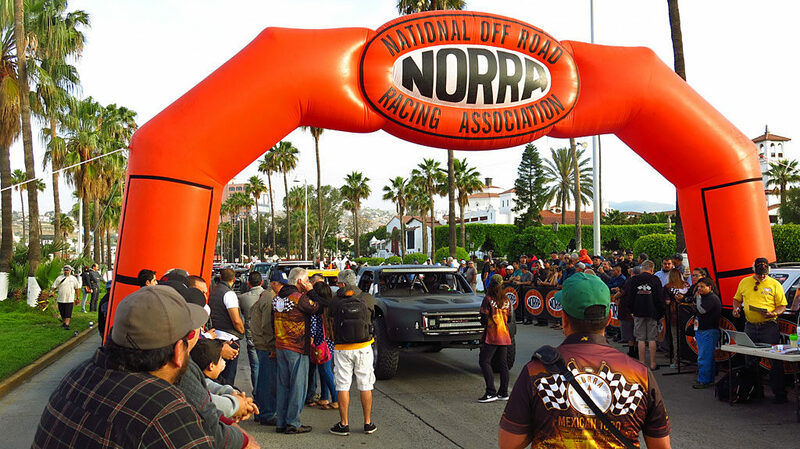 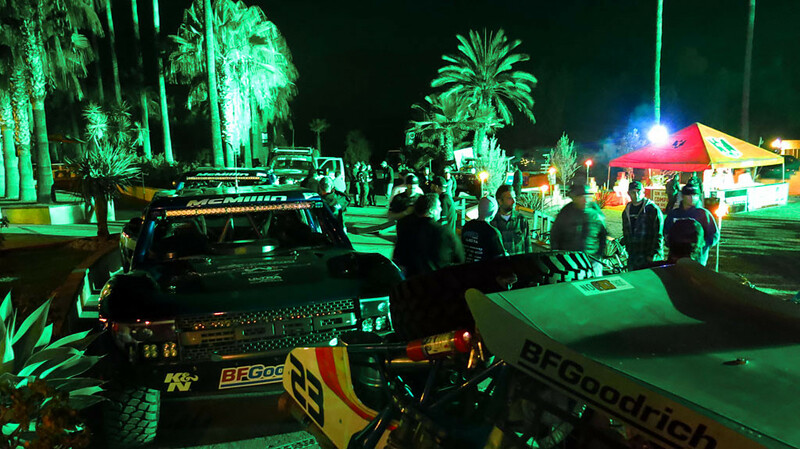 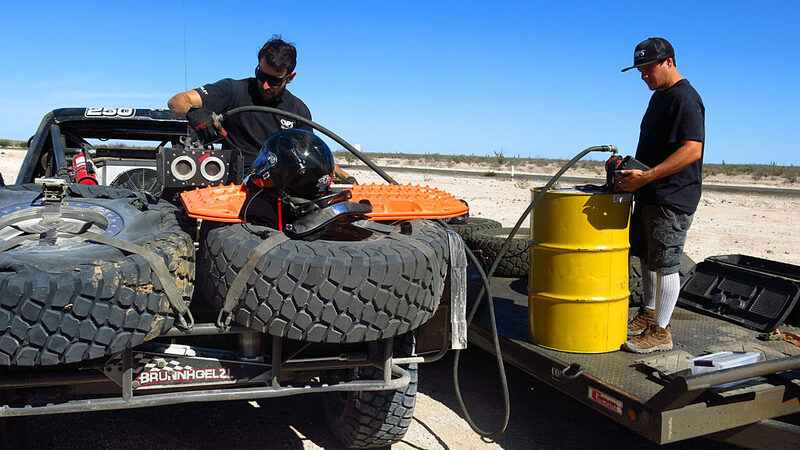 With its roots from 1967, the 2016 edition of the NORRA Mexican 1000 Off Road Race ran 1374 miles down the Baja peninsula, starting in Ensenada with the checkered flag in San Jose del Cabo. 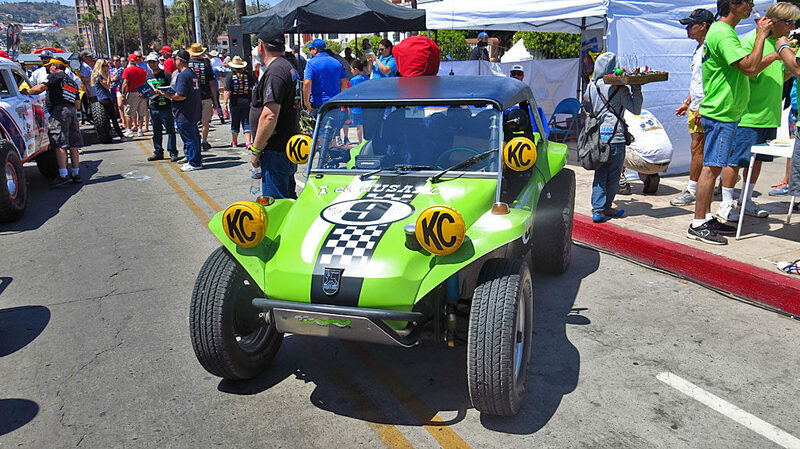 The four-day event represents six eras of race cars, defined primarily by the technology available when originally introduced. 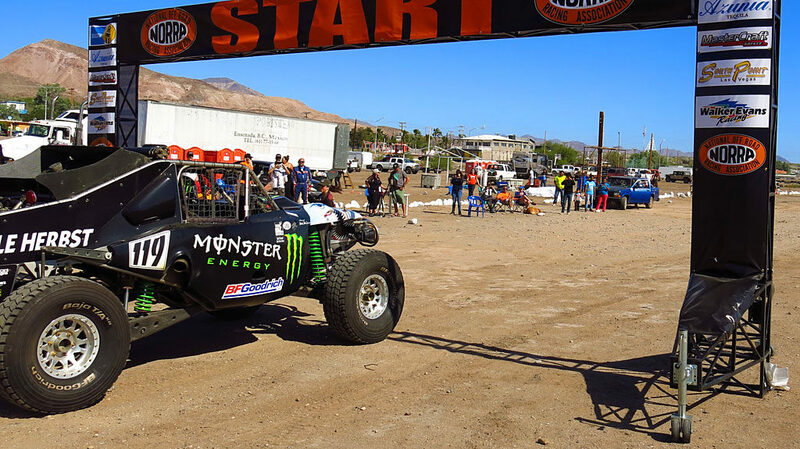 Each era will be awarded an overall trophy. 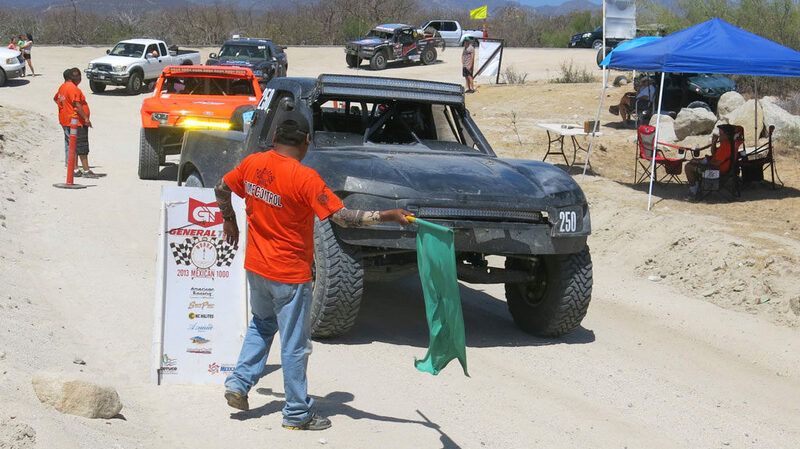 One hundred twenty-four racers will begin their journey down the peninsula in Ensenada, advancing each day to the Bay of Los Angeles; then Loreto; then the capital city of Baja California Sur, La Paz, and finally the finish in San Jose del Cabo. 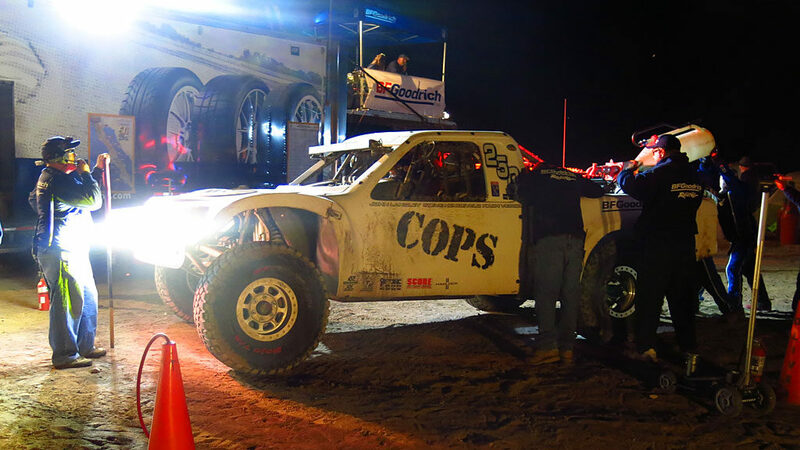 COPS Racing entered two Spec Trophy Trucks in the race: the E/S Motorsports #29 driven by Zak Langley, and the #250 Brenthel-built truck driven by John Langley — both trucks are in the Evolution Unlimited Class for contemporary race cars. 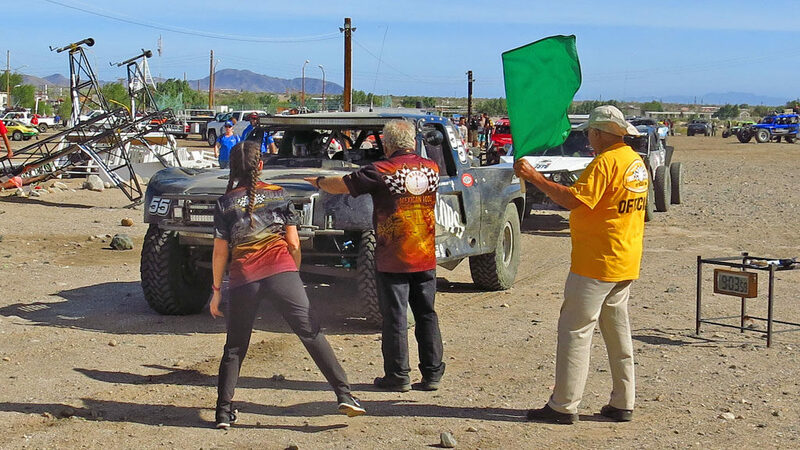 Contingency Row gives race fans a down-and-dirty, close-up view of the racers and race cars in an almost a carnival-like atmosphere. 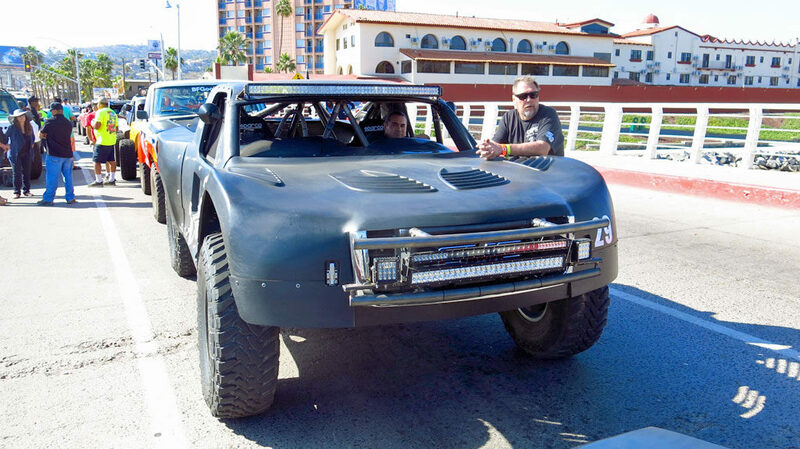 The pre-race event is held the day before the race in front of the historic Riviera Convention Center and gives racers one last chance to solicit help from sponsors before the race. 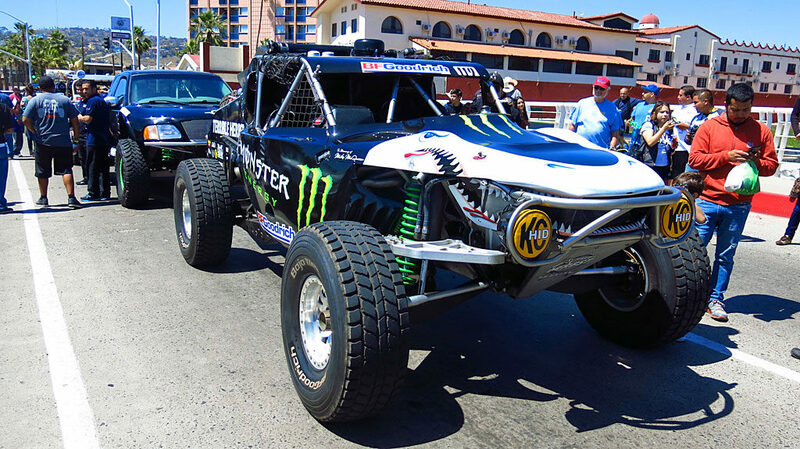 At the end of Contingency Row, race cars pass through Technical Inspection, to verify the race car is rules-compliant and safe to race. 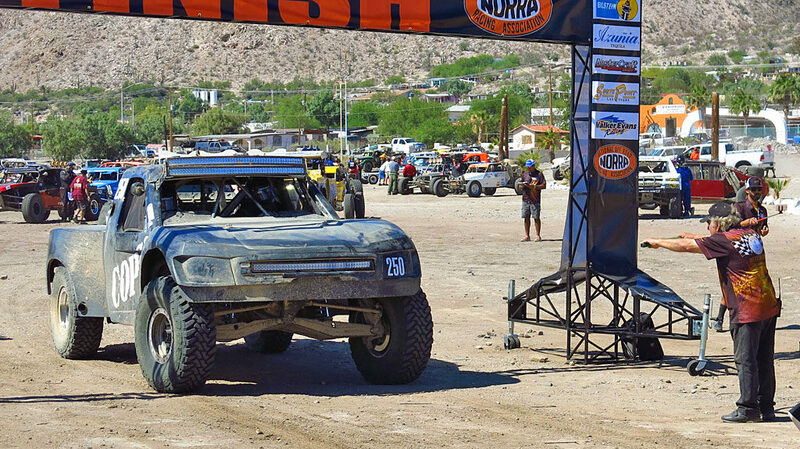 The NORRA 1000 has been described as a “Gentleman’s Race” as evidenced by the relaxed, fun atmosphere of Contingency. 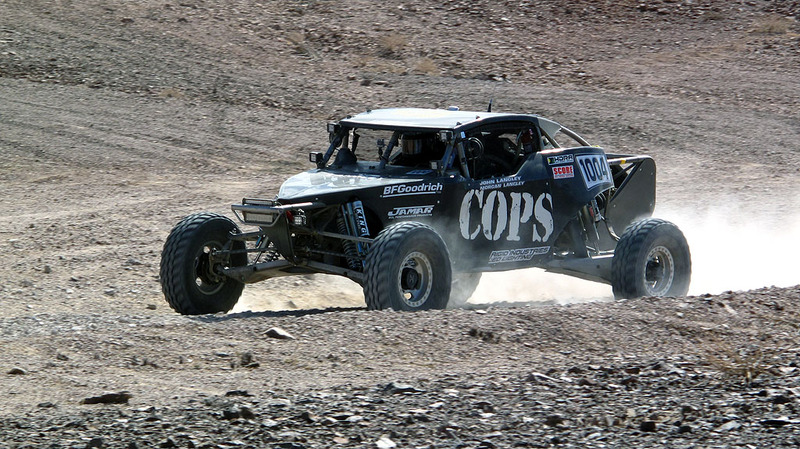 John Langley will pilot the COPS Racing #250 in the Evolution Unlimited Era class. 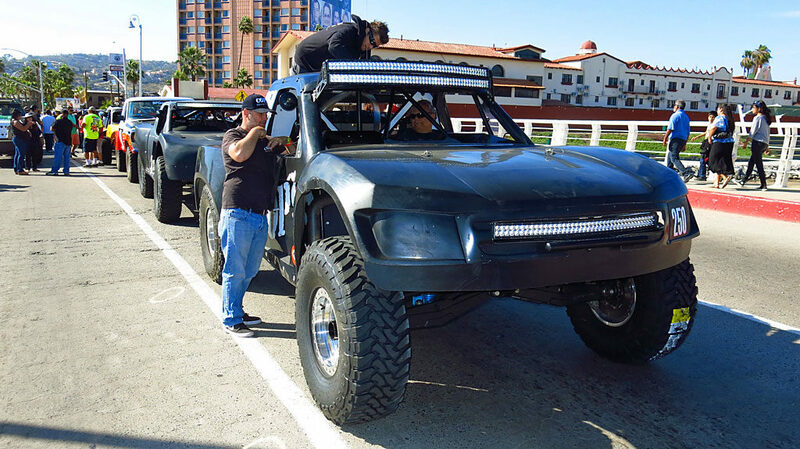 “Evolution Era” includes contemporary race cars and UTVs. 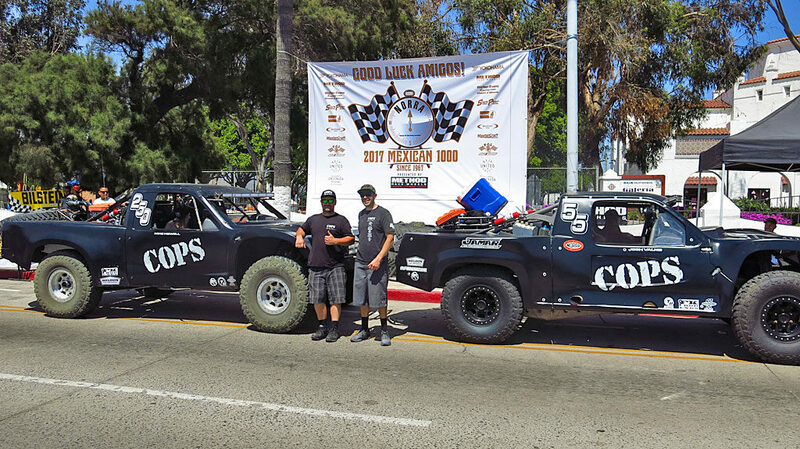 Zak Langley will be driving the 2016 COPS Racing #29 E/S Motorsports Spec Trophy Truck in the contest, for Pro Unlimited for Evolution Era cars. 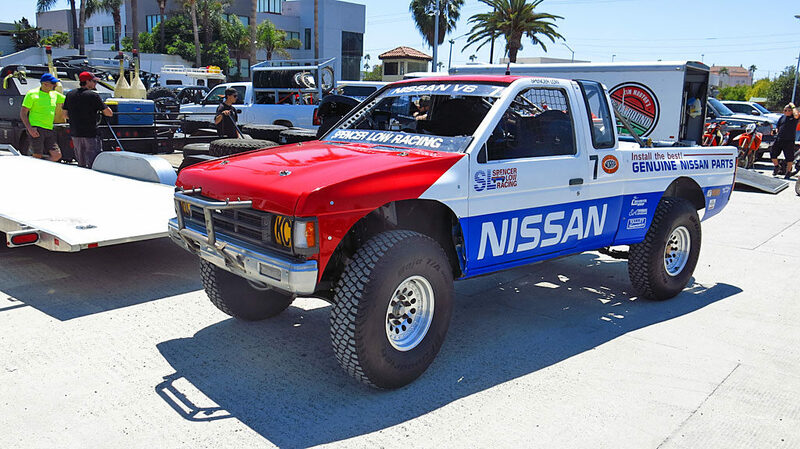 Michael Power drove the #125 1991 Nissan T Mag, racing in the Historic Truck and Truggy class, which is defined as 20 years or older. 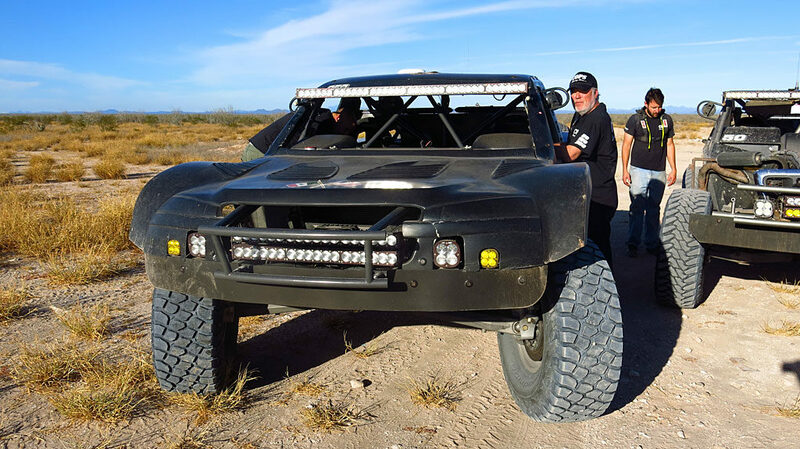 Troy Herbst is the driver of the iconic Terrible Herbst Land Shark, the revolutionary 1994 Smittybuilt truggy (half truck, half buggy). 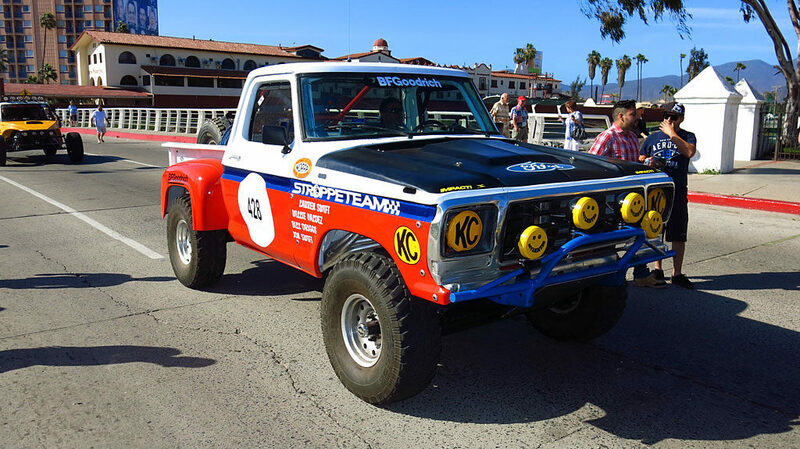 Jonathan Swift raced this 1975 Ford F-100 in the Pioneer 4×4 class. 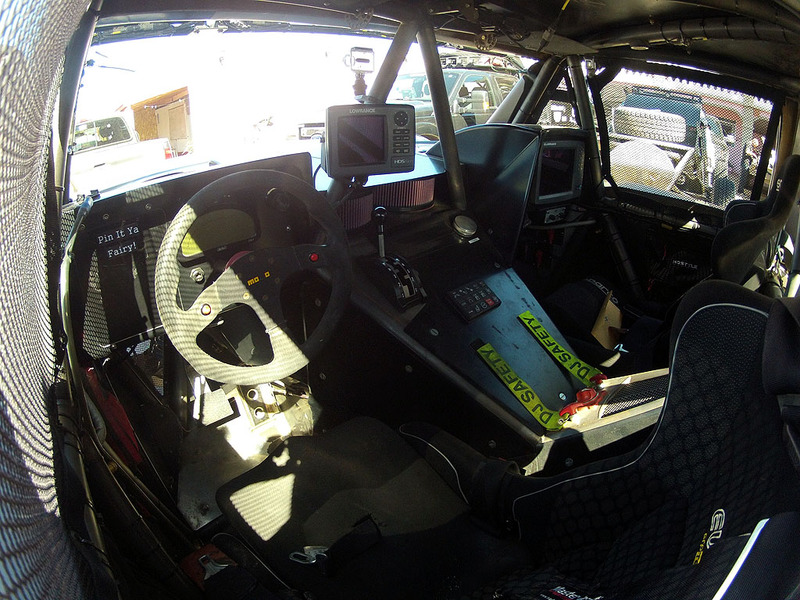 John Swift is driving the 1972 Olds Cutlass in the Pioneer Era class, for 1967 through 1975 cars. 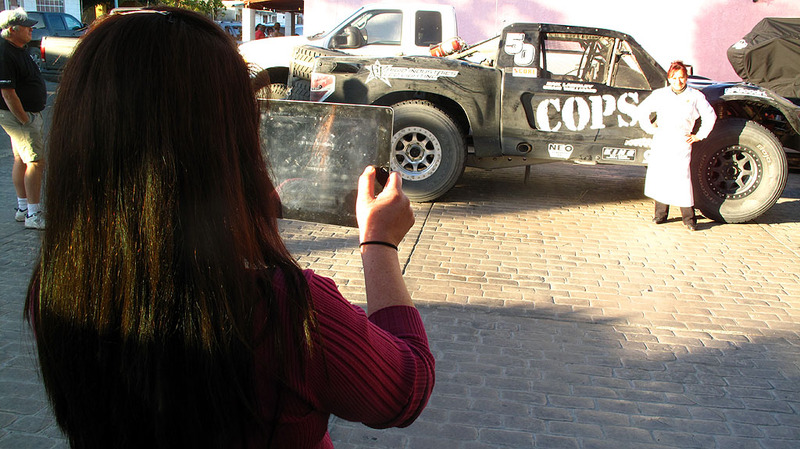 The car was festooned with a tequila version of The Tecate Girls. 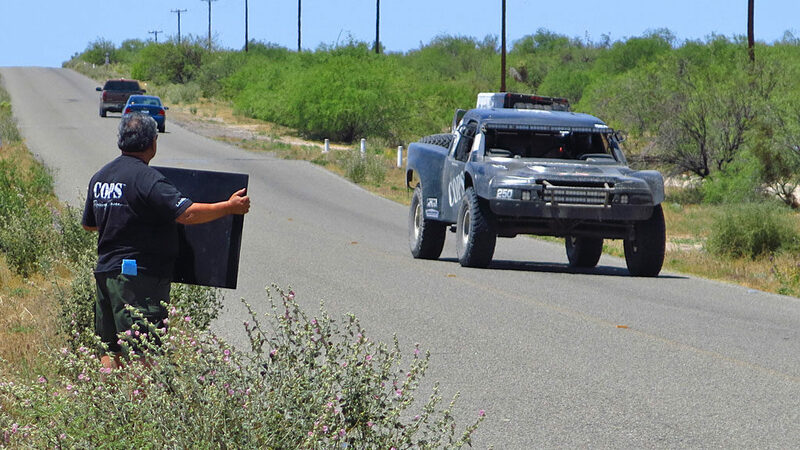 COPS staged at 6 a.m for the 7 a.m. start of the 1374 mile race. 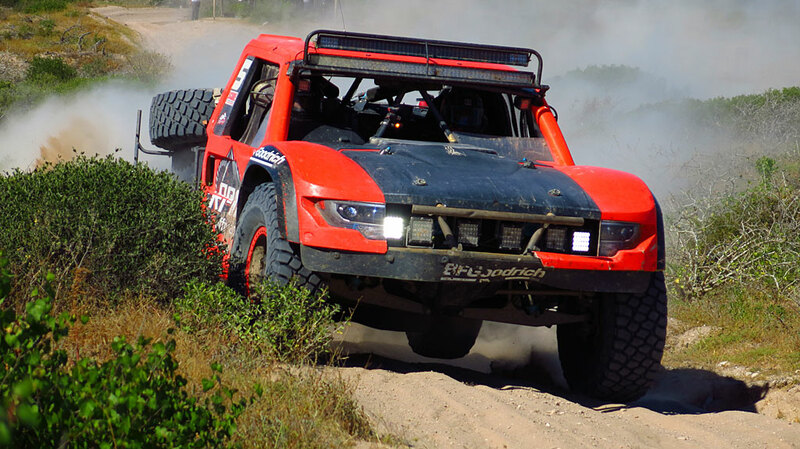 After departing Ensenada, racers will log 456 miles before seeing the day’s finish in the Bay of Los Angeles on the east side of Baja. 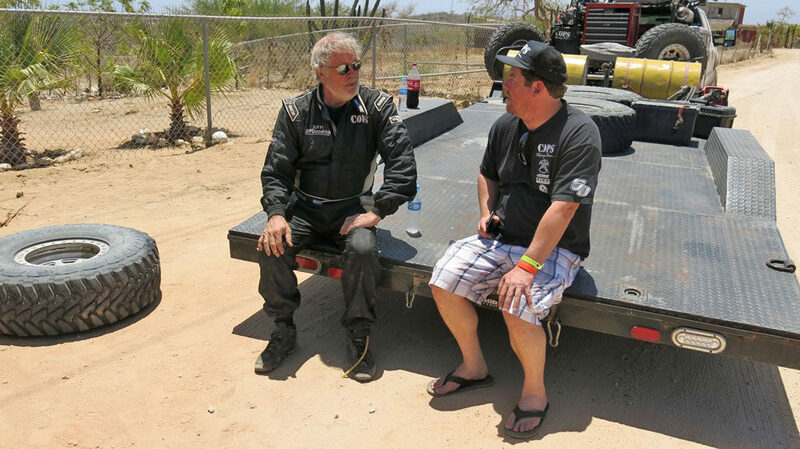 John chats with the Brenthel brothers before the race. 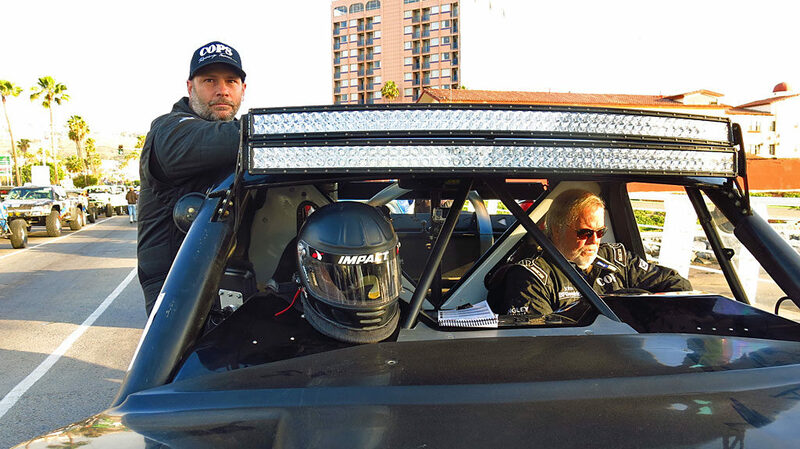 Mike Howell will handle the right-hand seat duties with John Langley in the COPS #250. 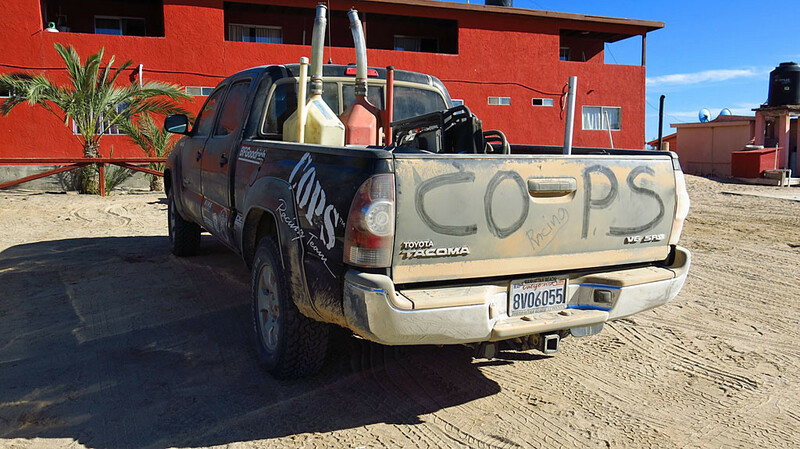 The #29 COPS truck is off the line in Ensenada with its cross-hairs on Cabo. 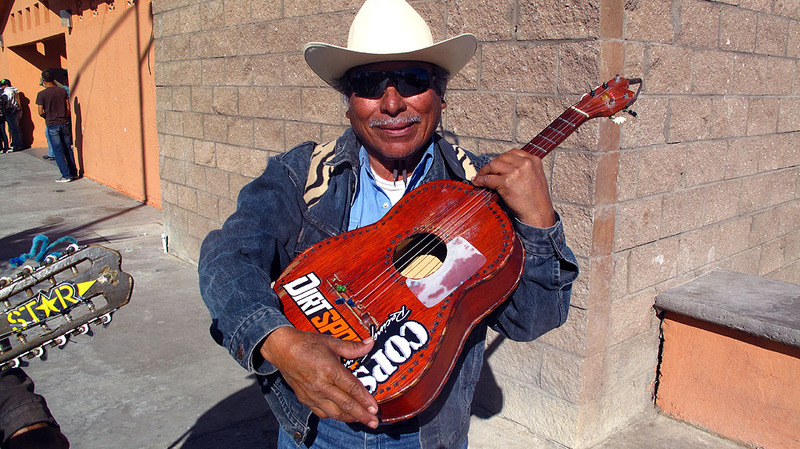 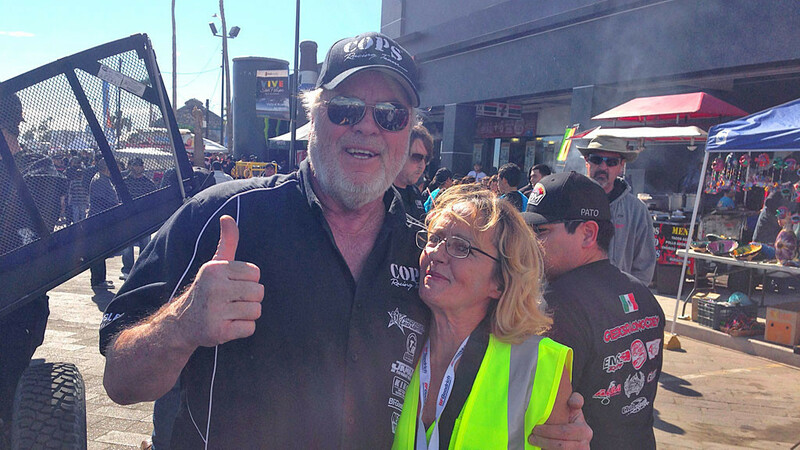 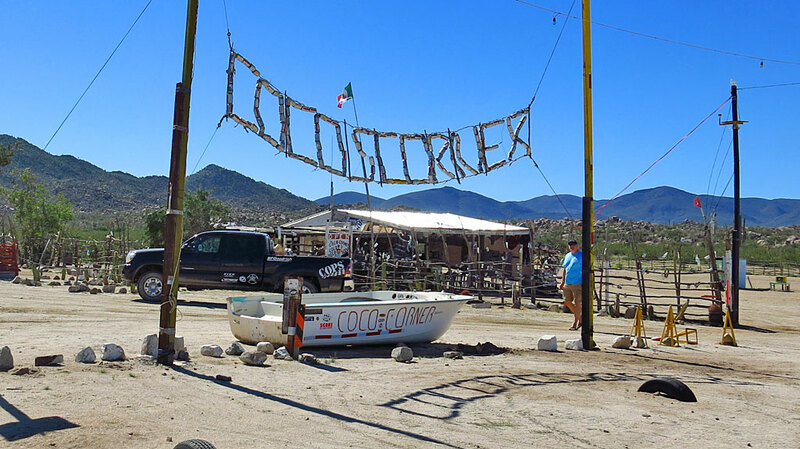 Coco, from the world-famous Coco’s Corner, is a race dignitary. 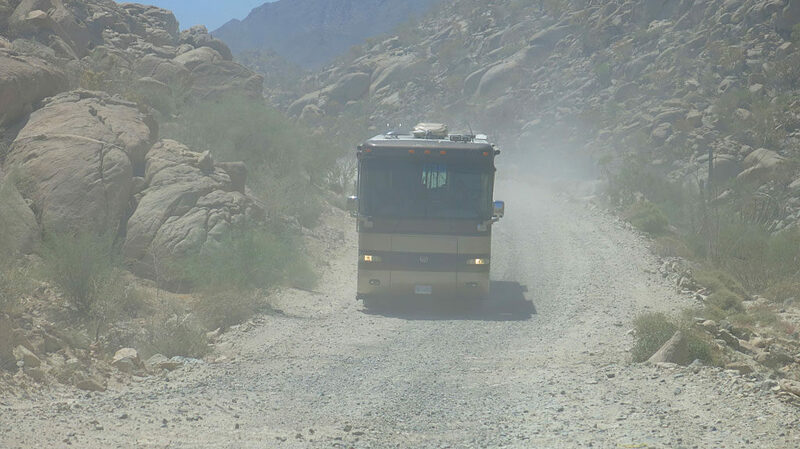 John leaves the dirt and enters Highway 1 outrunning a bus. 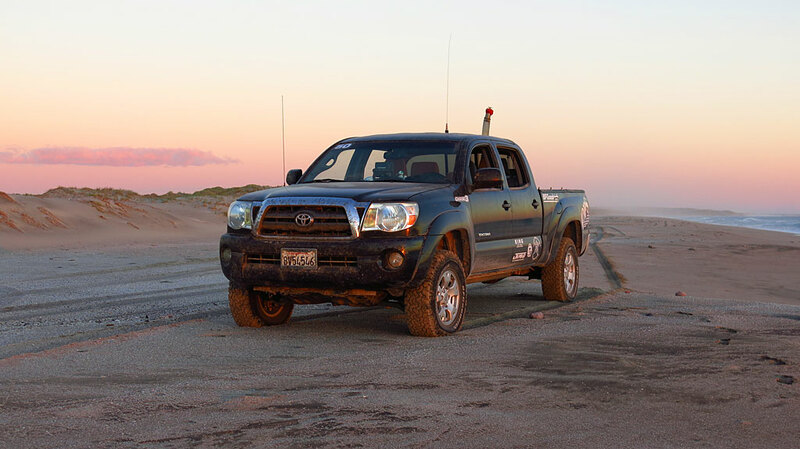 Our first gas stop at Santa Maria, around 125 miles into Day 1, and midway in our first Special Section. 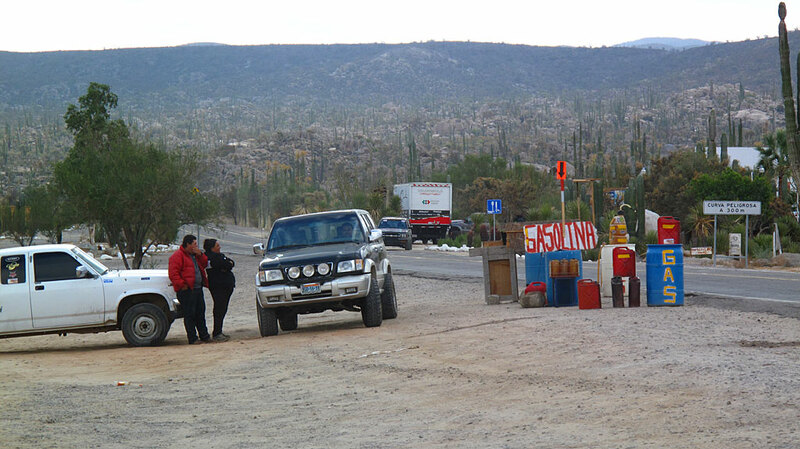 Due to timing, we had the time for a luxuriously-long gas stop where drivers could get out of the car and relax. 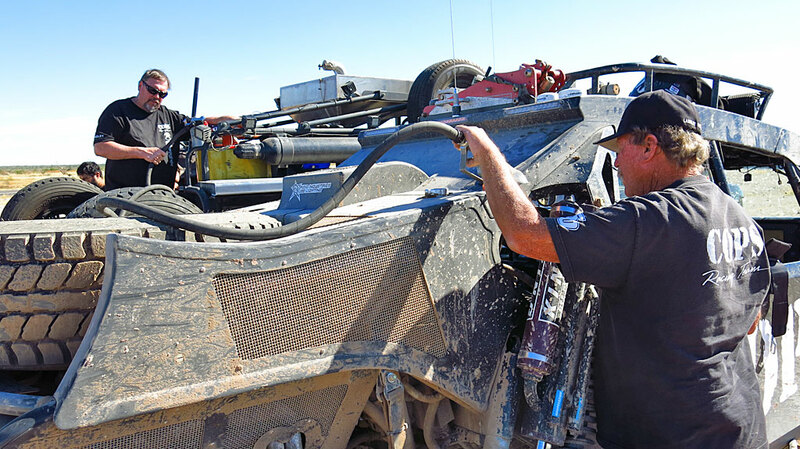 The second truck arrives in our pits — George prepares to fuel it. 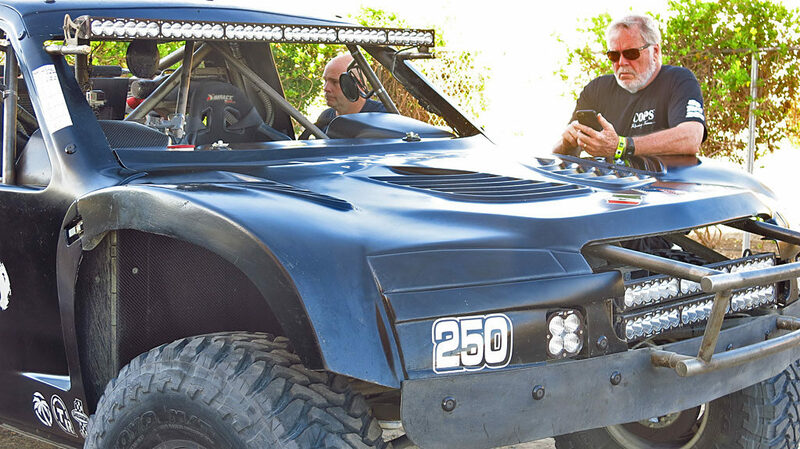 Zak schools Mike on some of the navigation equipment. 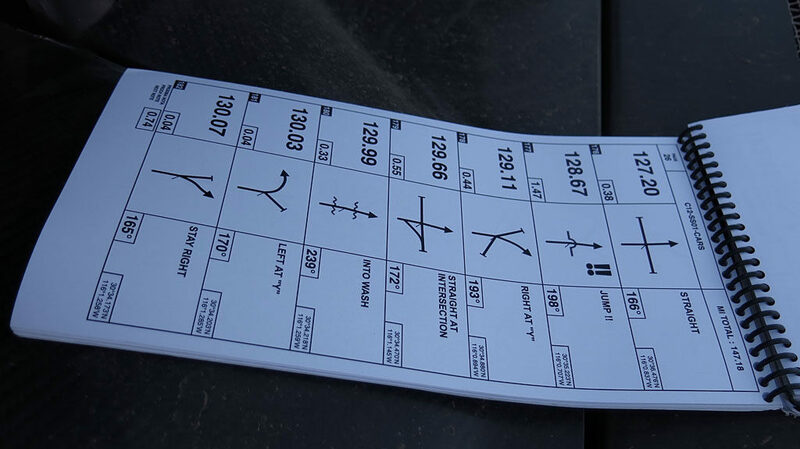 The co-driver navigates with a road book (aka tulip notes) augmenting the GPS — he has little time to look out the window. 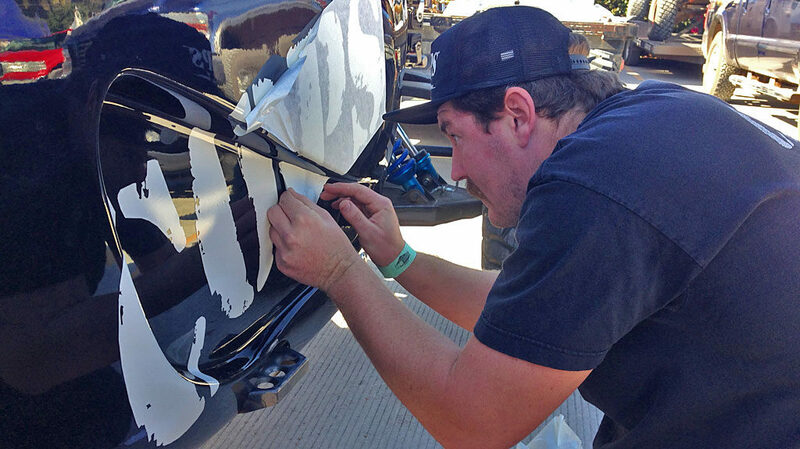 At our second fuel stop, Kory Halopoff repairs the #29’s rear Fiberglas fender. 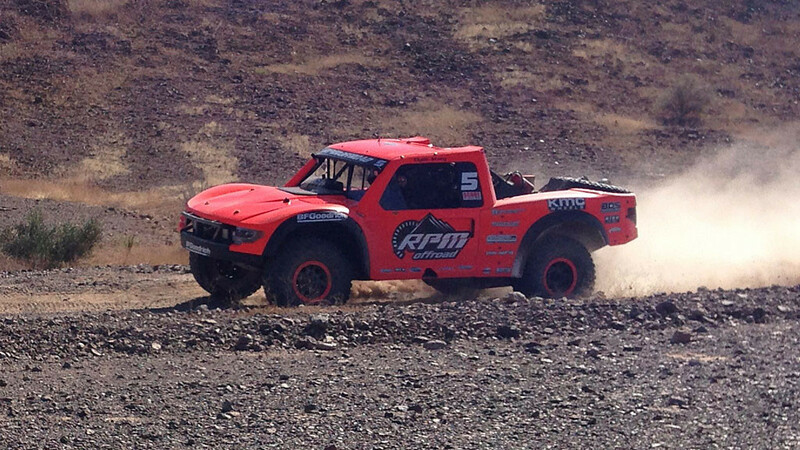 Kory will drive the #250 for a leg of the race to give John a break. 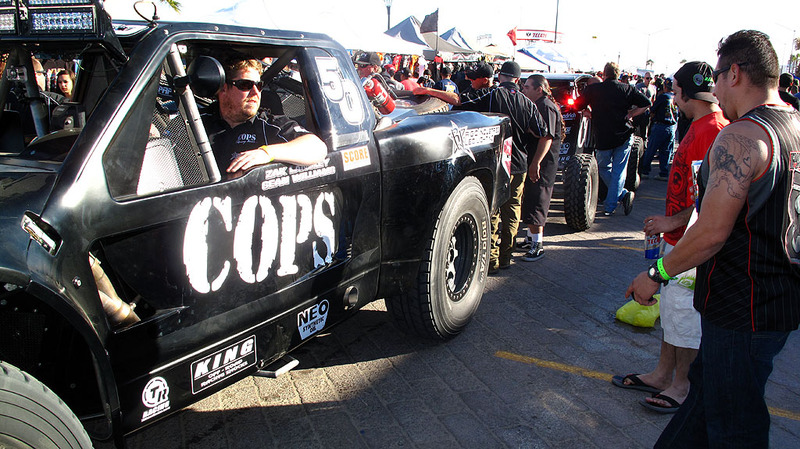 Both COPS race trucks carry MaxTrax extraction ramps. 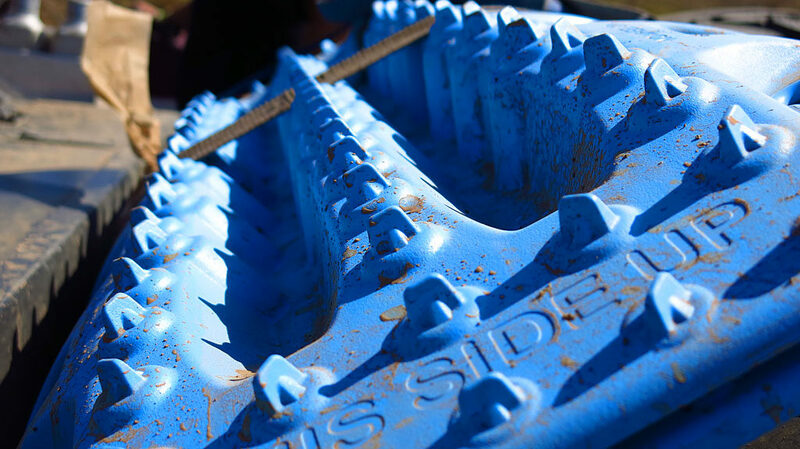 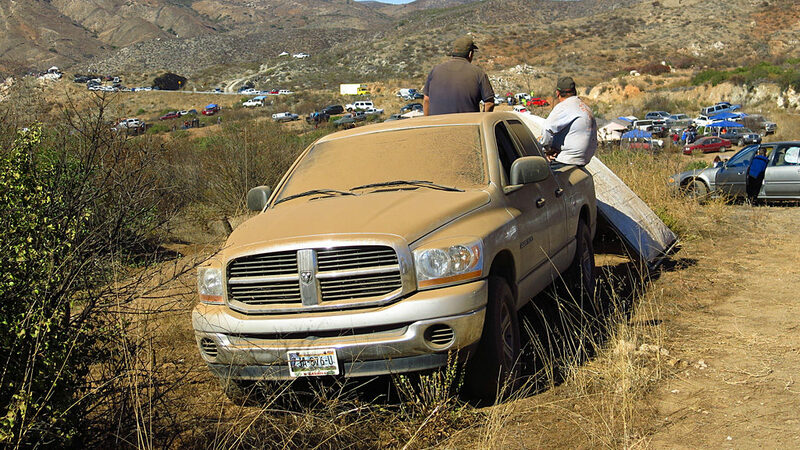 Most racers view this new technology as cheap insurance against getting stuck. 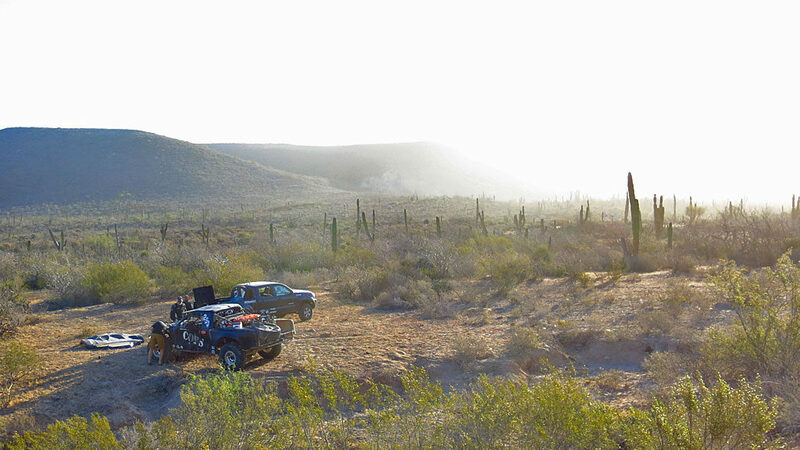 The #250 waits out the clock on a Special Section, where timing is critical — you do not want to arrive too early or too late. 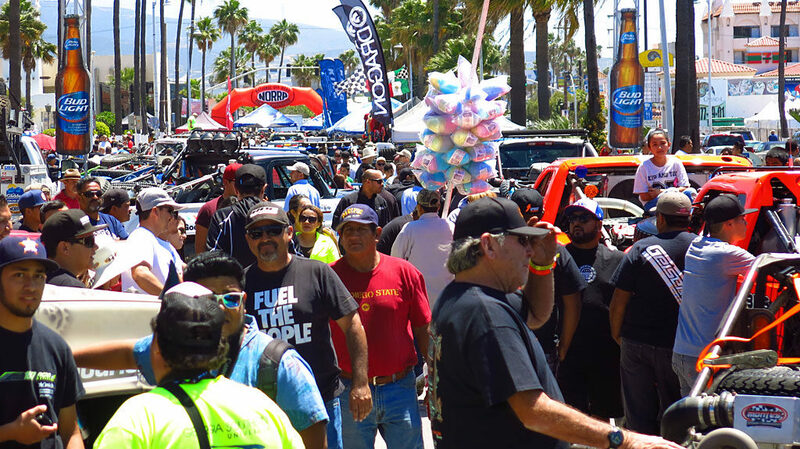 After a flawless day of racing for both trucks, we visit Pit City at the finish line in Bay of Los Angeles, where tacos and margaritas flowed freely, along with many race-related stories. 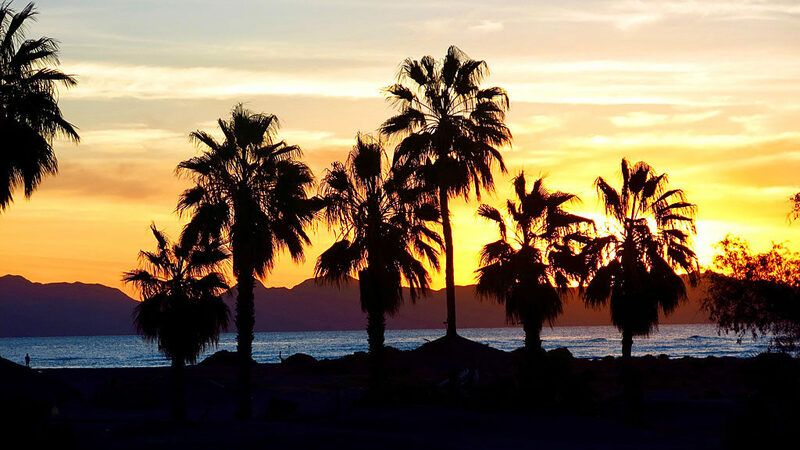 Sunup at the Bay of LA. 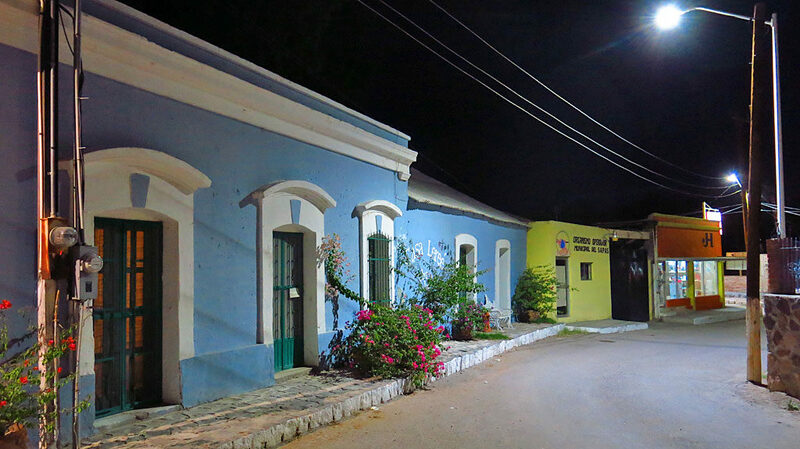 The first cars depart town at 7:30. 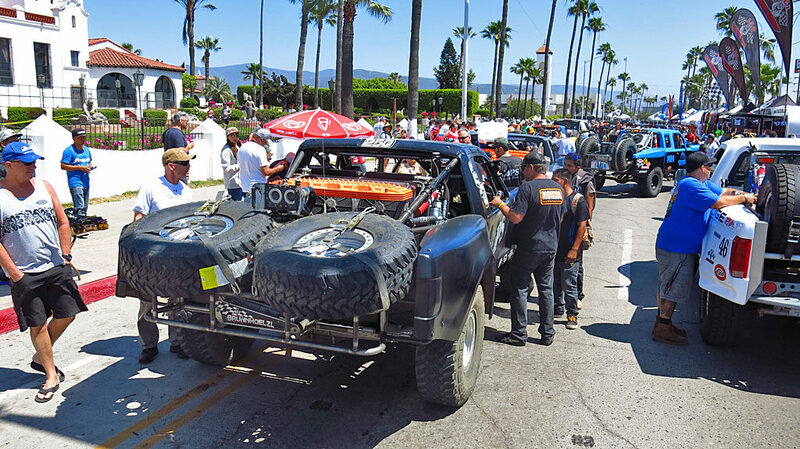 The Terrible Herbst Land Shark leaves the line at Bay of LA. 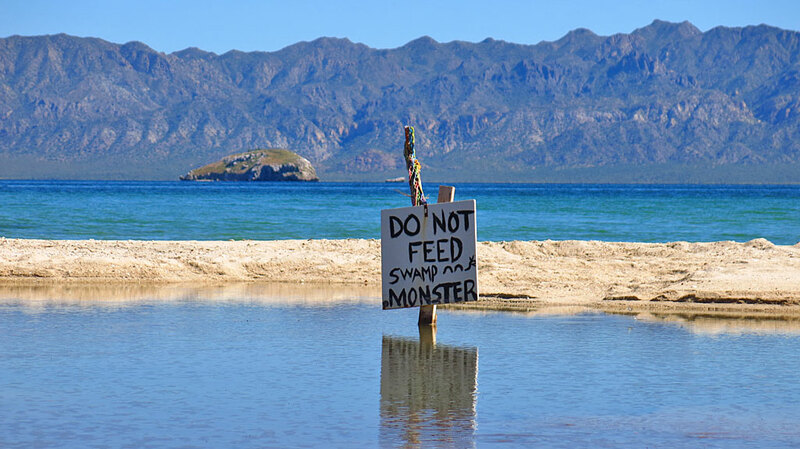 In one more day, the Shark would catch fire and burn to the ground. 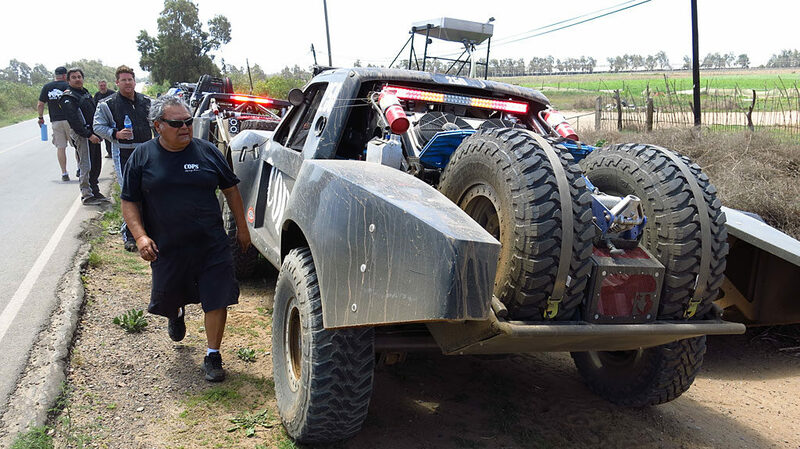 John leaves the starting line at the direction of NORRA Director Mike Pearlman. 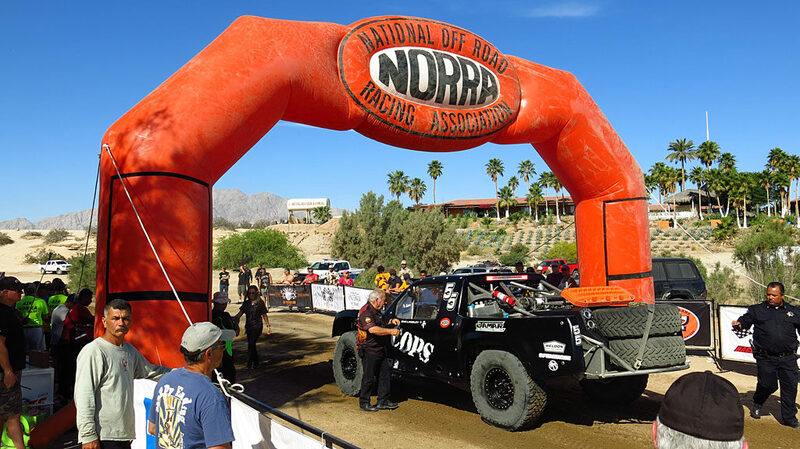 It was Pearlman’s late father Ed, along with others, who established the first running of the NORRA Mexican 1000 off-road rally in November 1967. 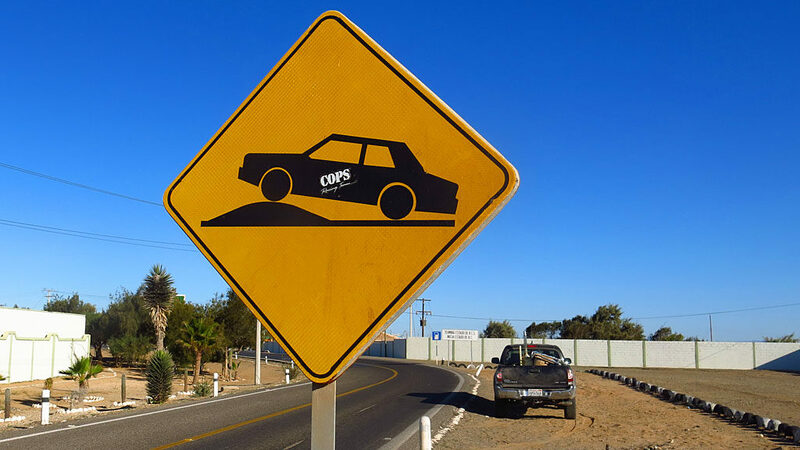 A vado? 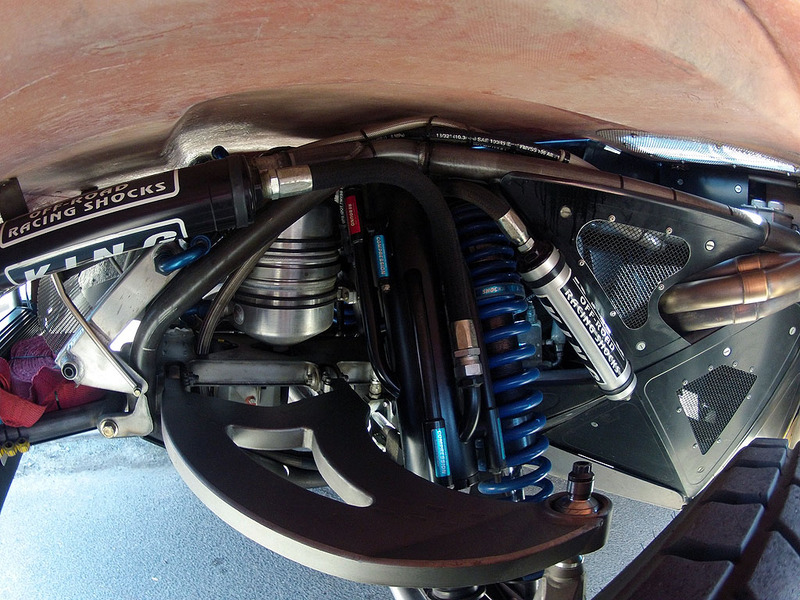 Looks more like a tope to me! 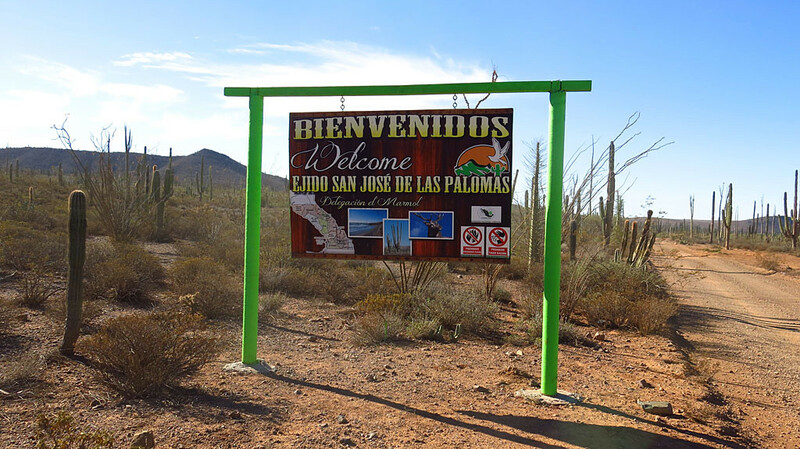 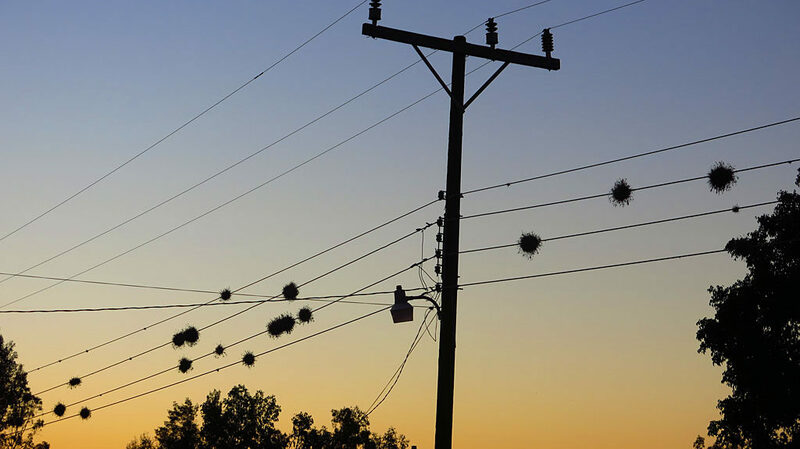 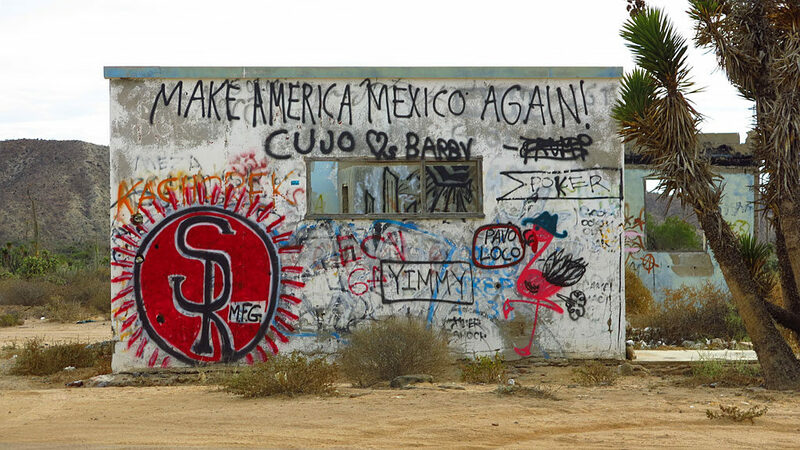 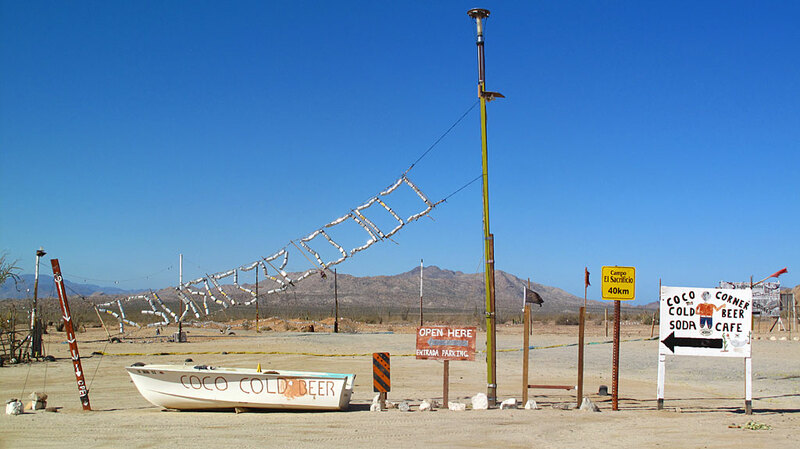 Ja ja – love that Baja humor! 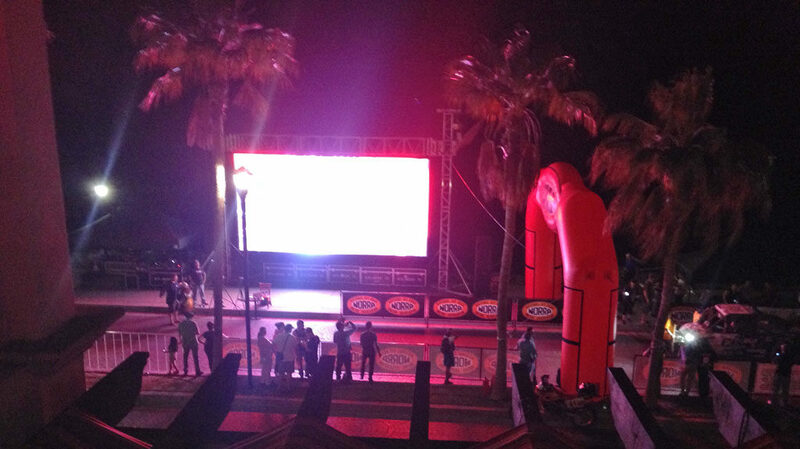 The view of the Loreto Finish Line from the balcony of our room at the Mision Hotel. 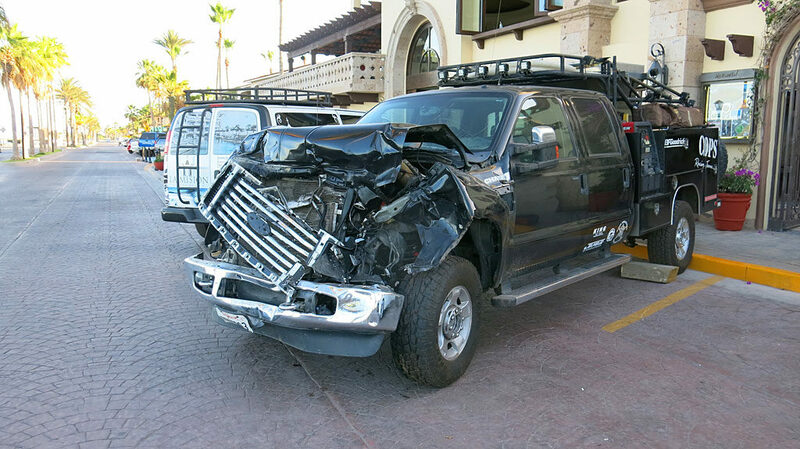 I was looking forward to a good night’s sleep when I got the word: George and Manny had hit a horse in one of the Team’s F-350 chase trucks. 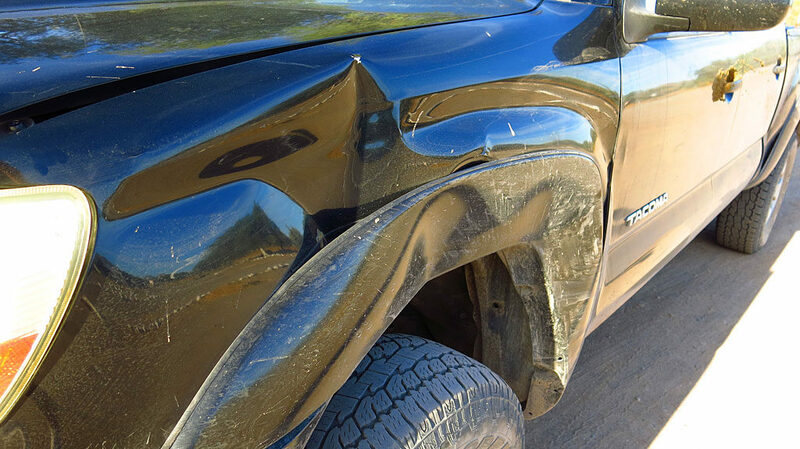 Luckily they were OK, but the Ford and the horse didn’t fare so well. 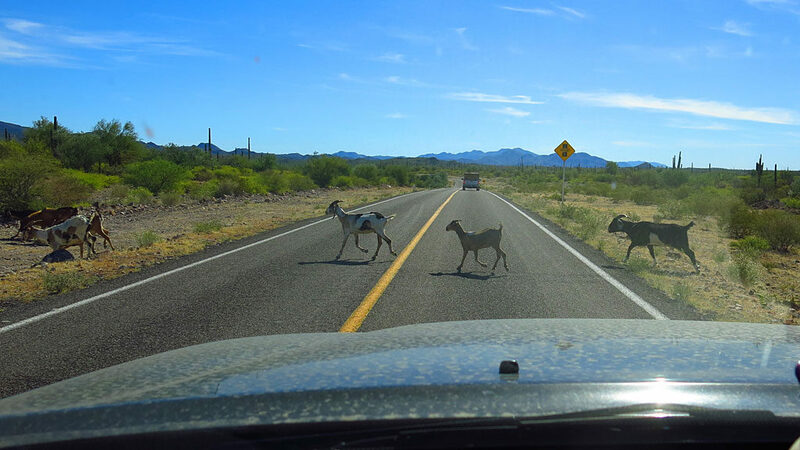 We drove north of Loreto about 10 miles to get them and bring them to the hotel. 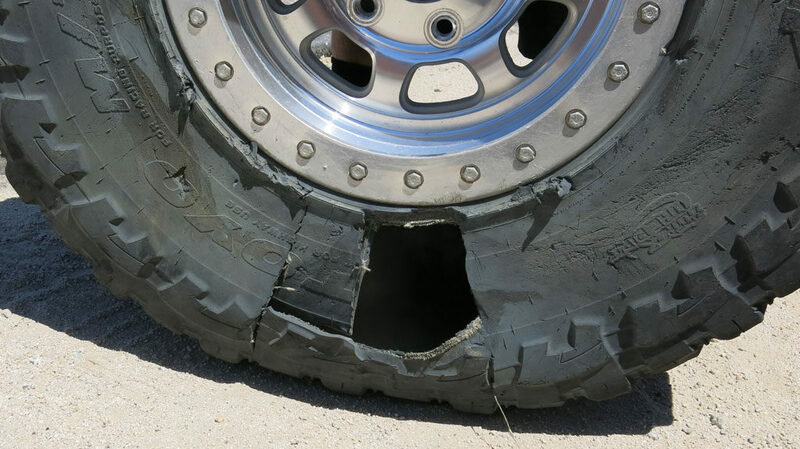 And then the other shoe dropped. 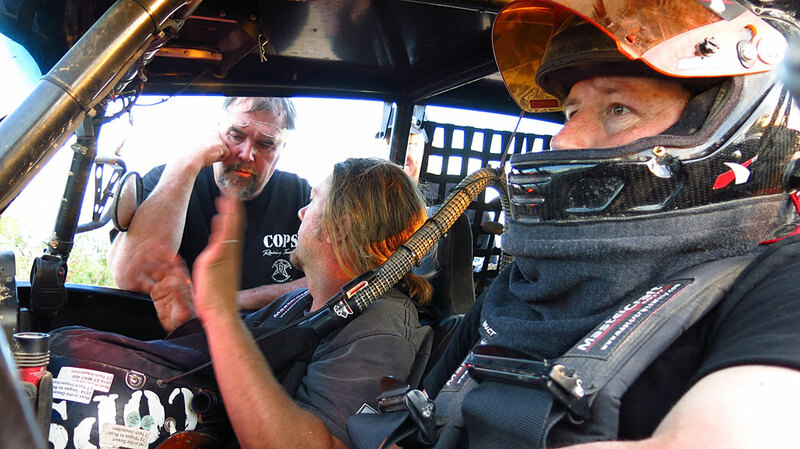 Zak, in our #29 truck, had a blown motor and Steve and I were tasked to retrieve Zak, his co-driver, and the race truck. 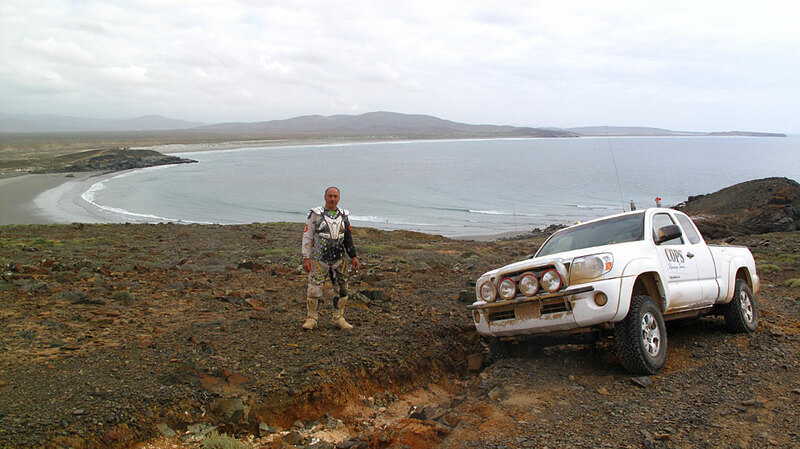 We were on the Sea of Cortez while Zak was on the Pacific side, near San Juanico, about 30 miles north of the closest pavement. 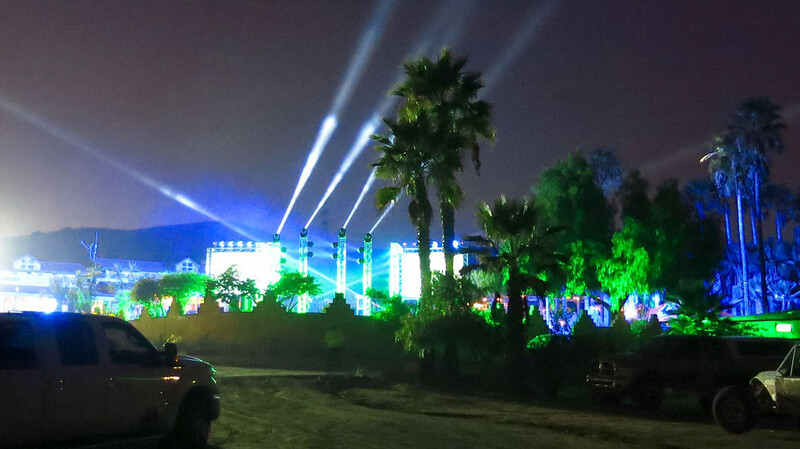 We were looking at a very long night at best. 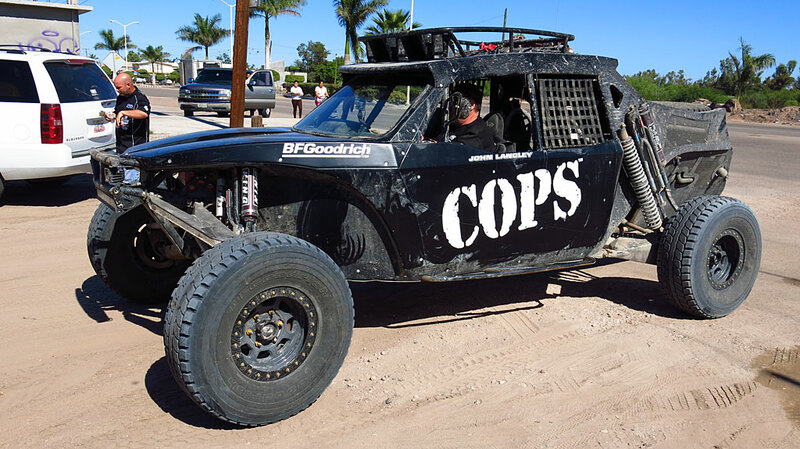 George and Manny’s chase truck will sit this race out. 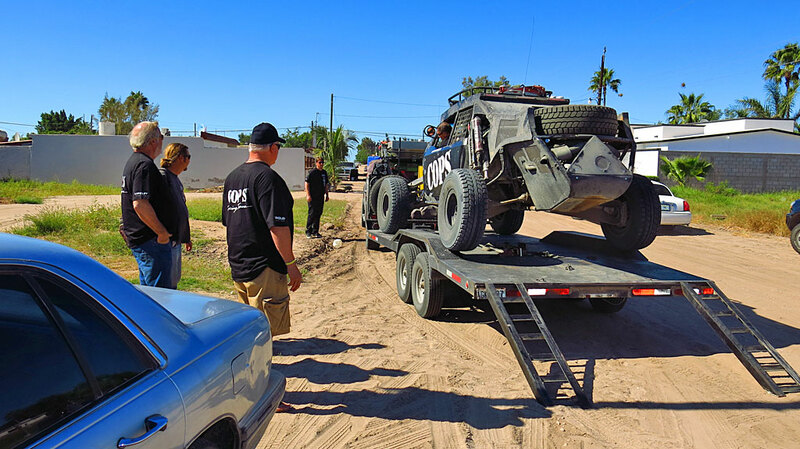 On the trip north, we stopped to remove the generator/welder, tools, and spare race truck parts. 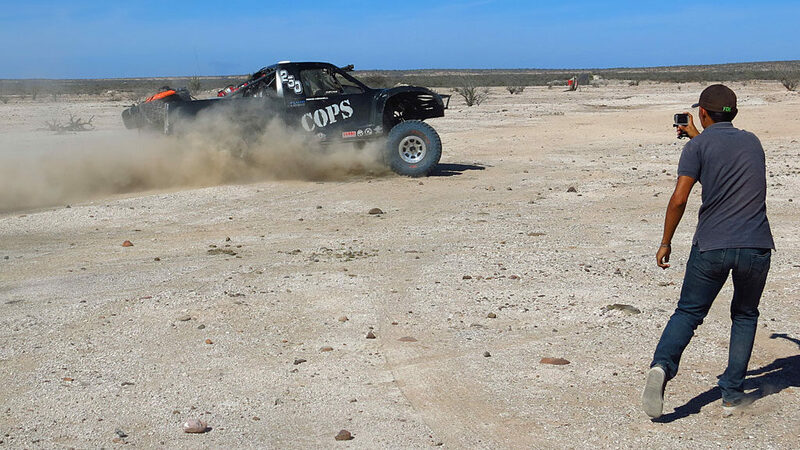 We have to assume the cars started OK in Loreto — the four of us, with broken race truck in tow head south to meet the race in progress. 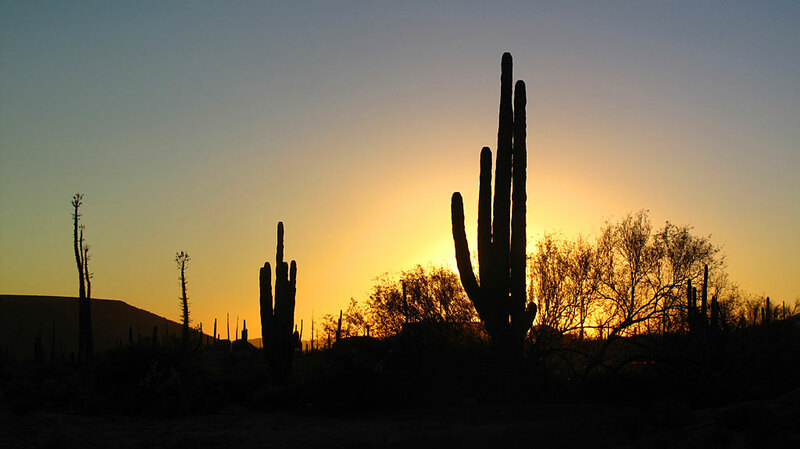 The sunrise was quite spectacular. 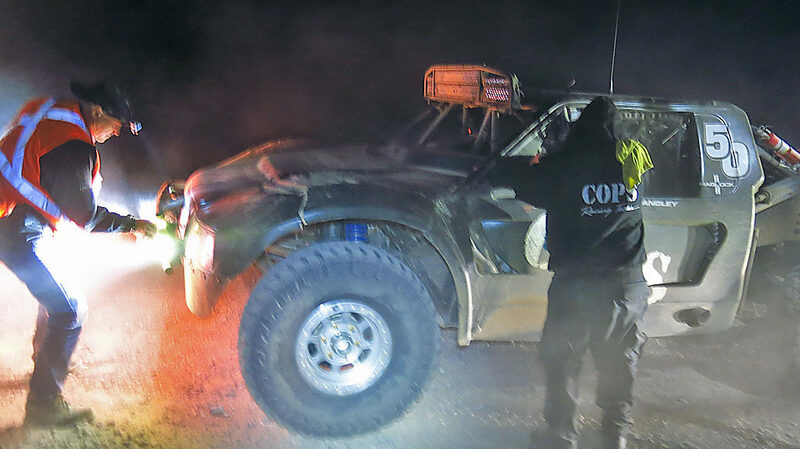 Steve and I spent a night to get to Zak, who was waiting patiently (and freezing) in his truck in front of the San Juanico police station. 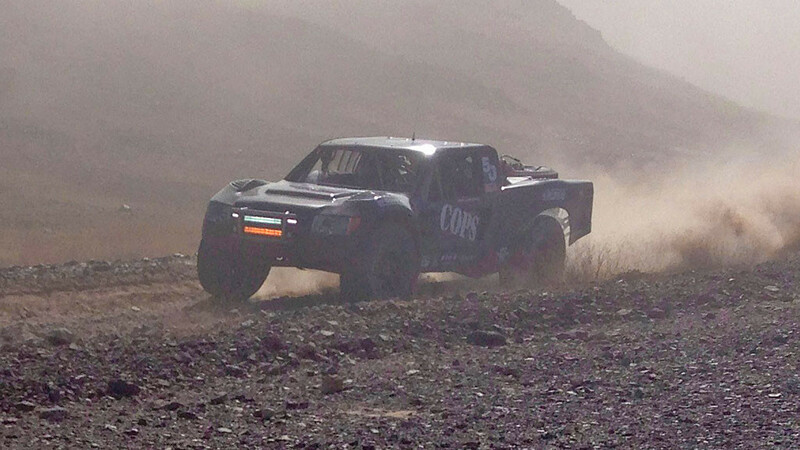 With Zak’s truck on the trailer, we rejoined the race in progress on Tuesday. 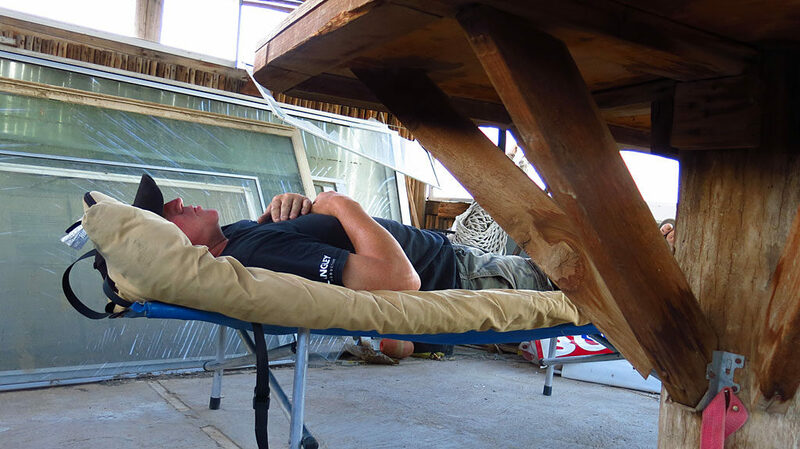 Monday-Tuesday would eventually be a 38-hour day for us. 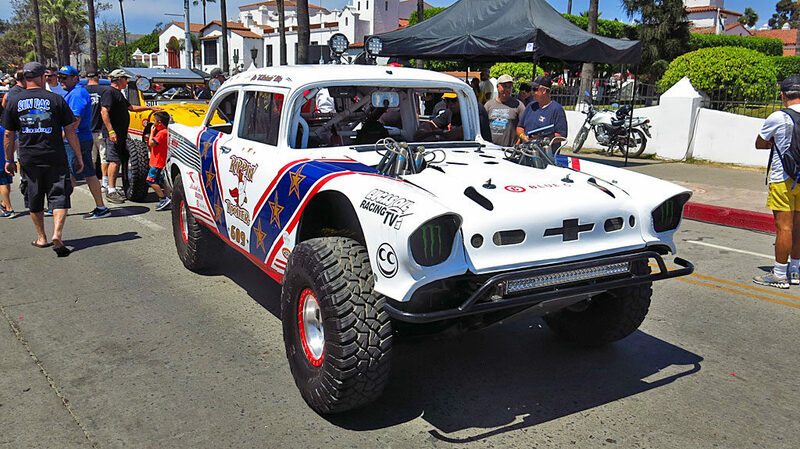 Florian Oger tears it up with the Snortin’ Nortin’ 1971 Chevy Nova — a favorite of spectators. 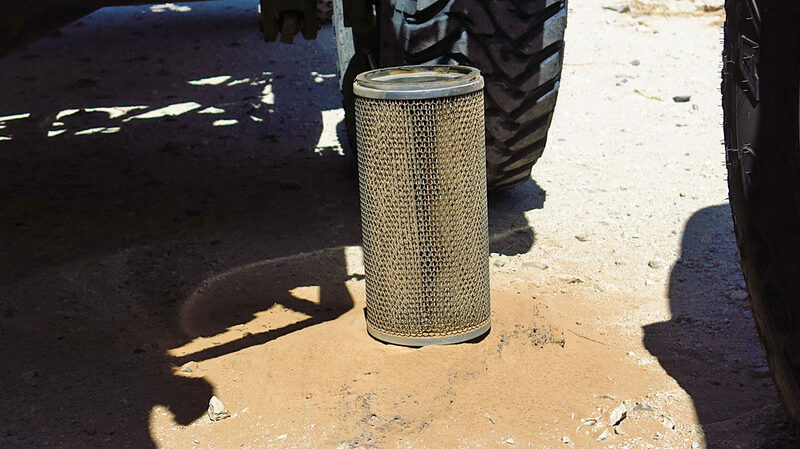 Dennis swapped out the #250’s air filter — he dropped the old filter on the ground and a little light brown silt came out. 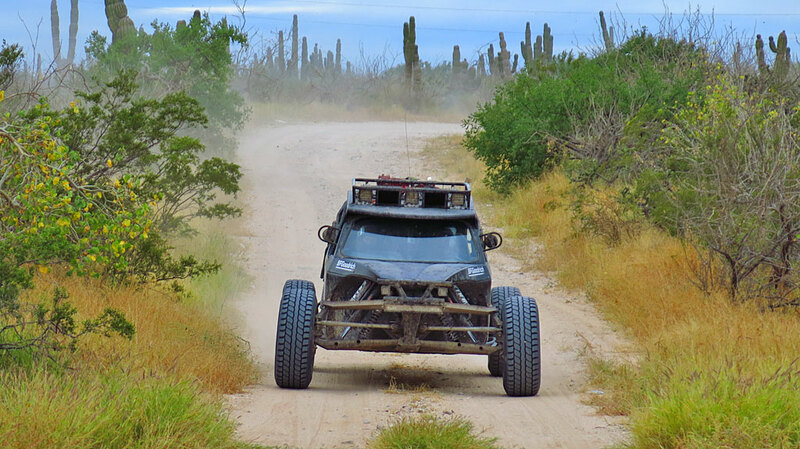 Racers in the distance, headed to La Paz. 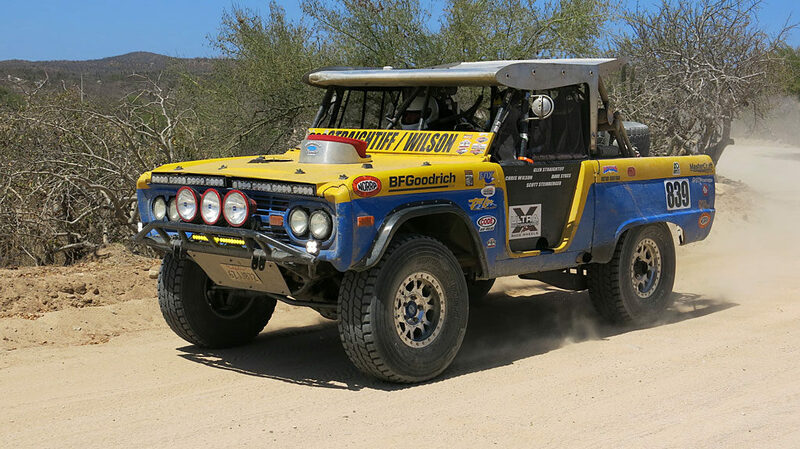 Chris Wilson and Glen Straightiff working for the finish in the Vintage Class 1966 Ford Bronco. 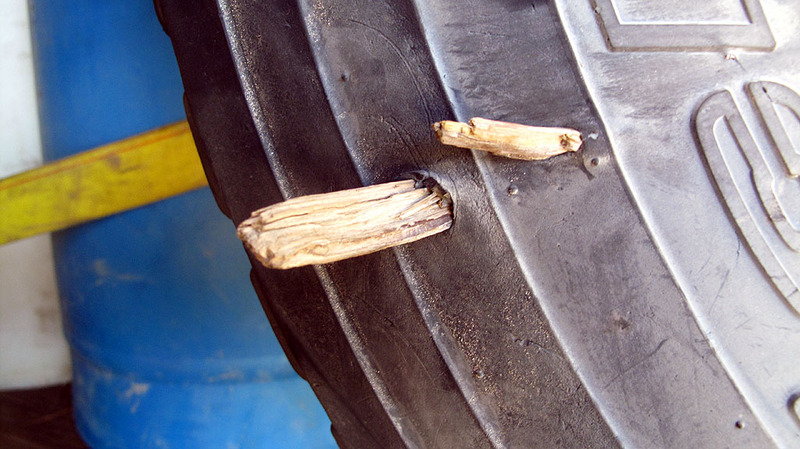 We swapped out one of the #250’s tires before the last Special Section due to low air pressure. 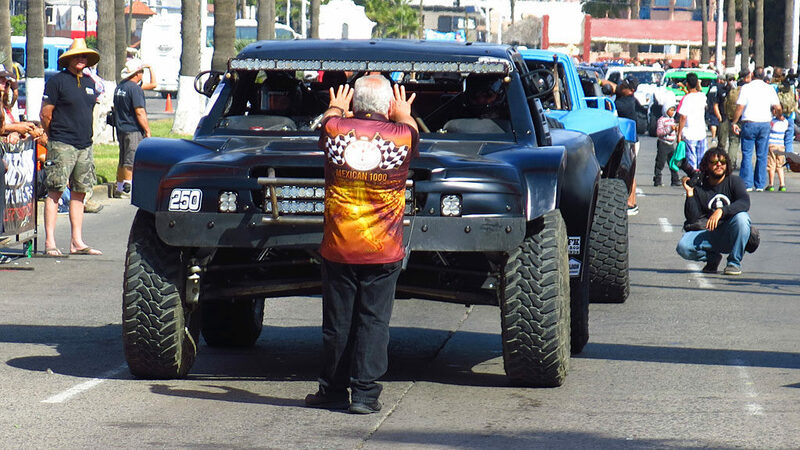 John waits for his truck’s wheel bearing to be swapped out. 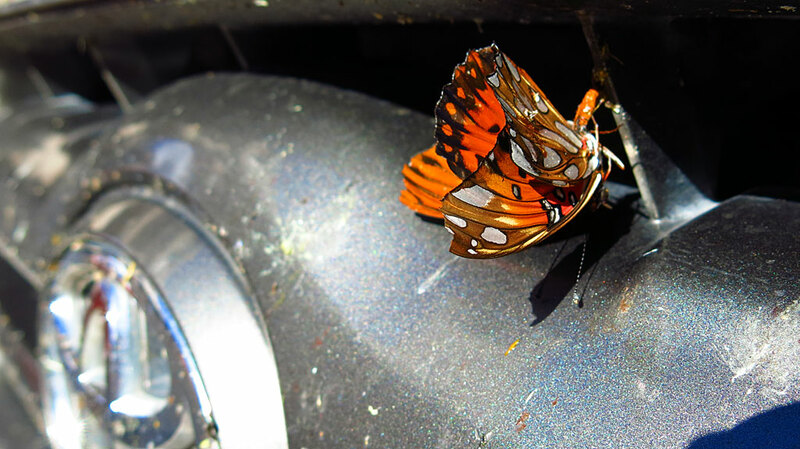 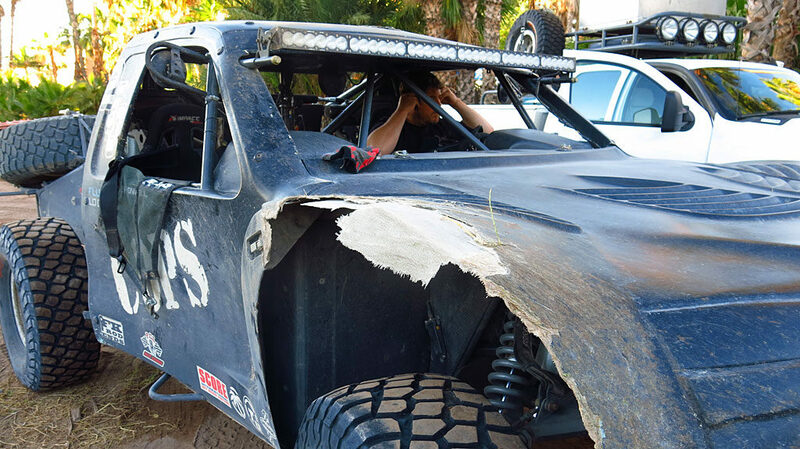 Including the time required to locate him, and mechanical repairs, his down-time was close to two hours. 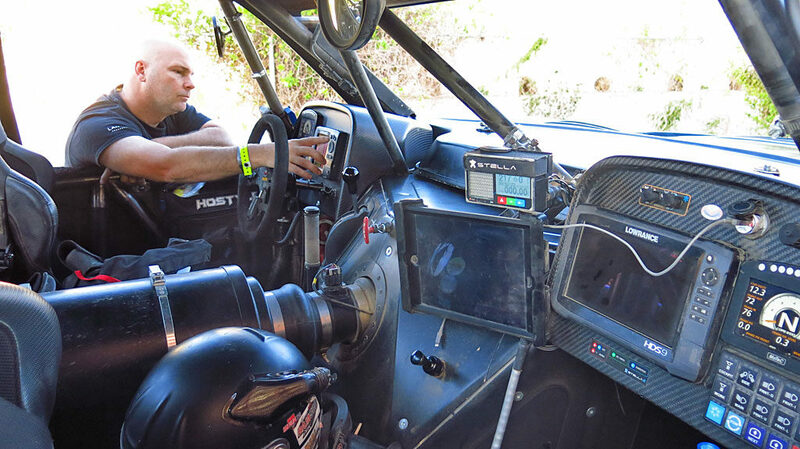 Even with the down-time, he would finish seventh in class. 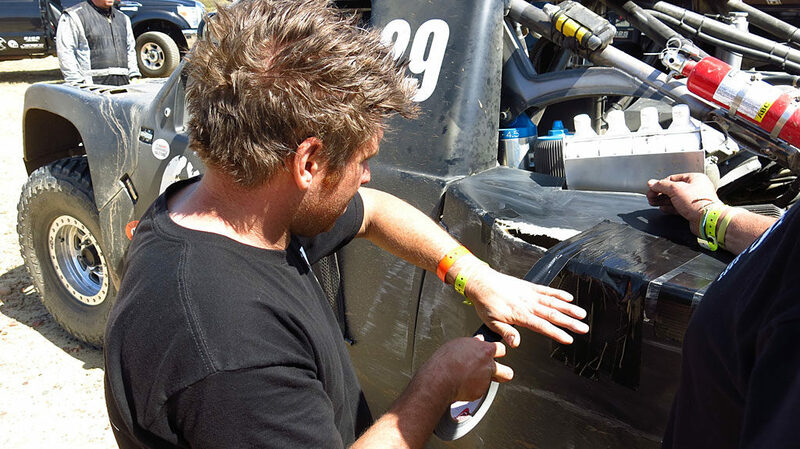 Dennis and Corey and Mike swap out the #250’s wheel bearing with the broken #29’s bearing. 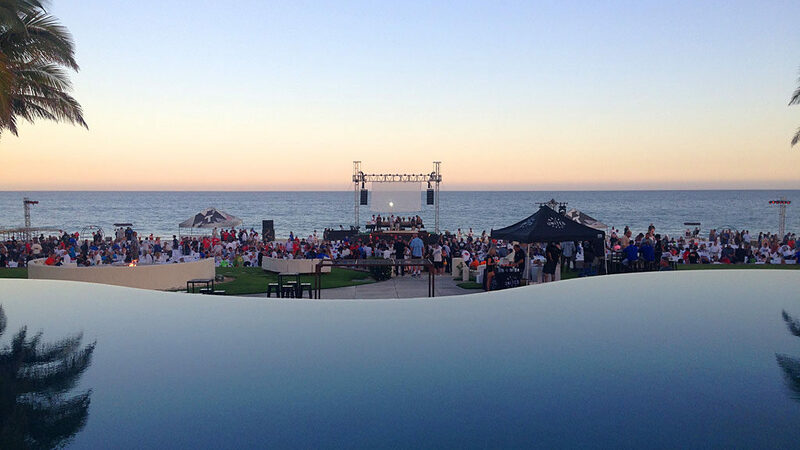 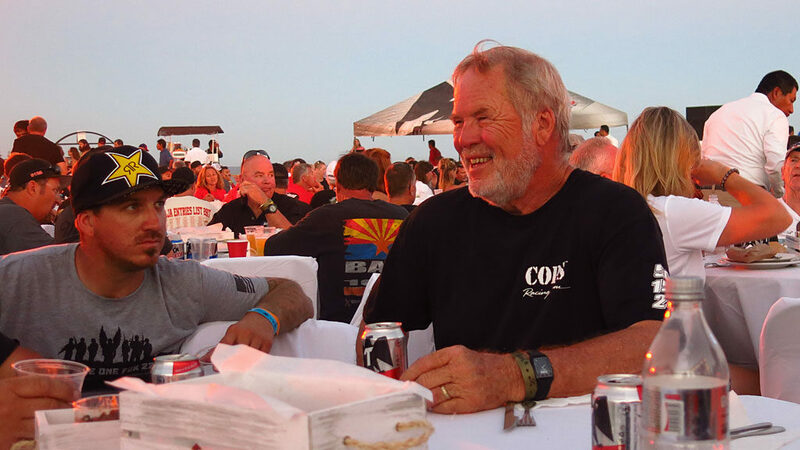 End-of-race dinner in San Jose del Cabo. 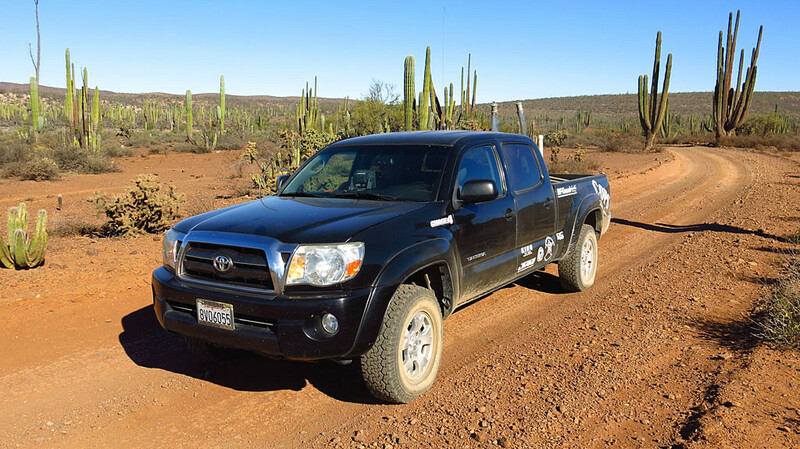 Beginning the next day, we will drive to Carson, CA, 1200 miles to the north. 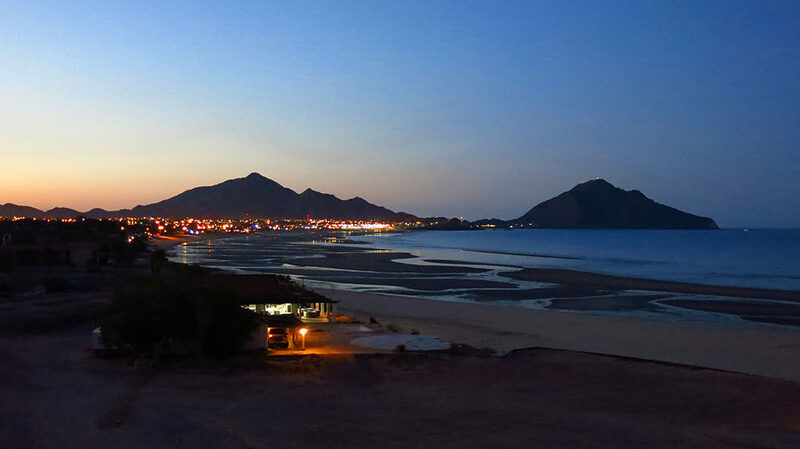 Playa Lugui — as nice is it is, expect to see a resort and 18-hole golf course with loud, drunk Americans in the near future. 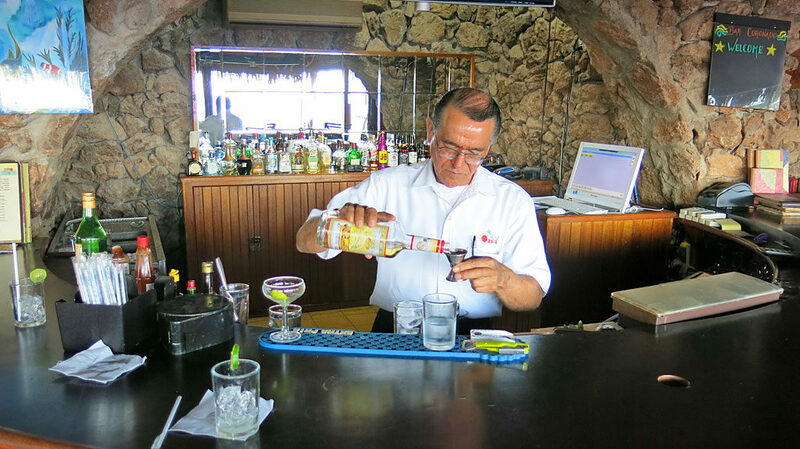 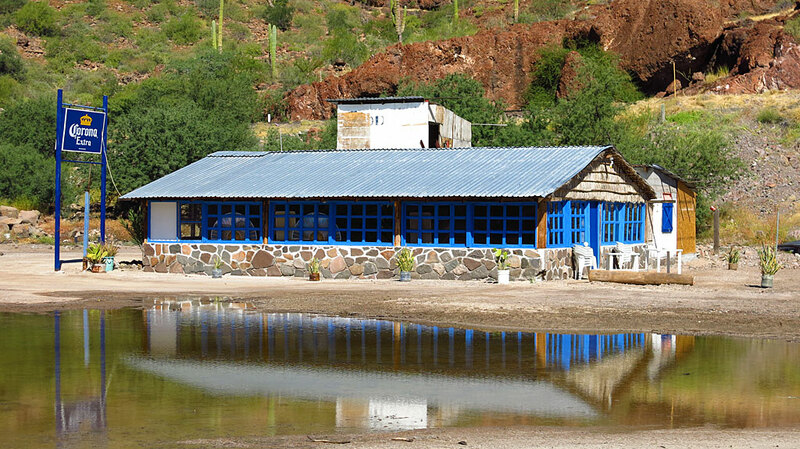 Where the best margaritas in the world are made: the bar at the Oasis Hotel in Loreto. 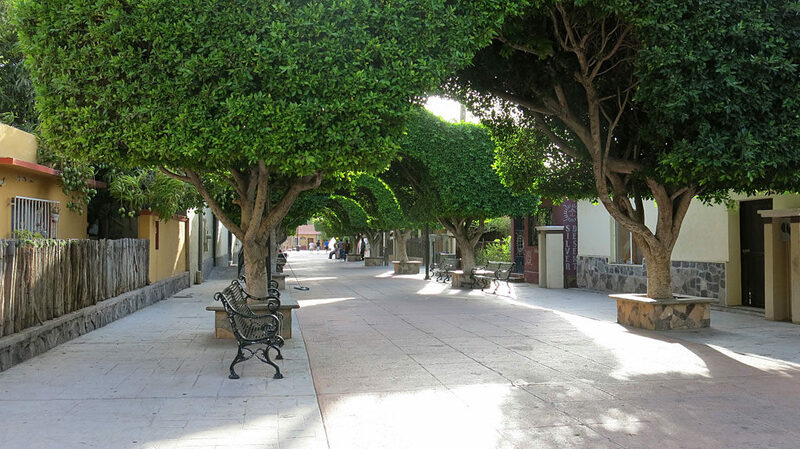 Downtown Loreto, BCS, an über-cool Baja town. 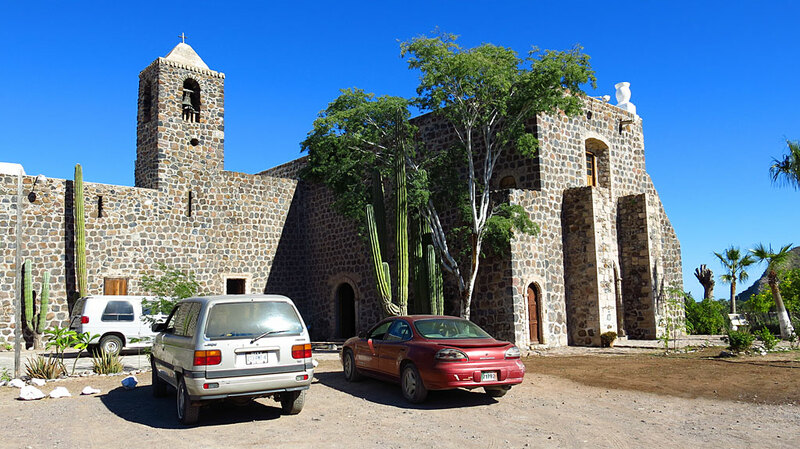 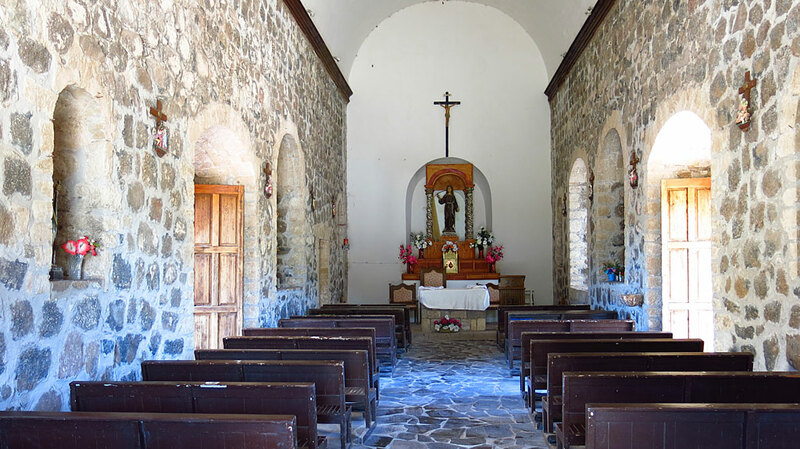 A photo sphere of the Misión de Nuestra Señora de Loreto Conchó which was founded on October 25, 1697 — the first of the California Missions. 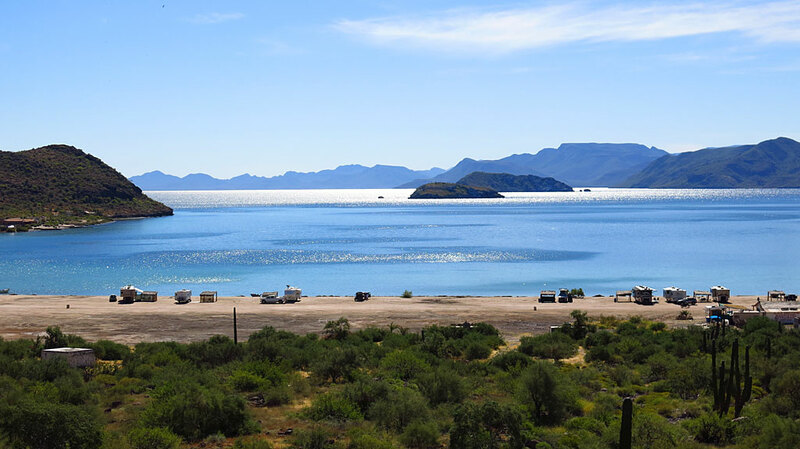 North on Highway 1 along the Sea of Cortez. 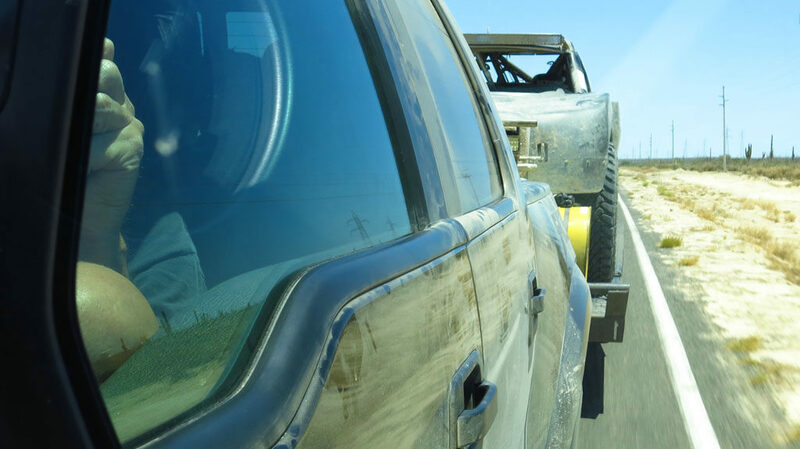 Note the road shoulder width – extra challenging when towing a trailer. 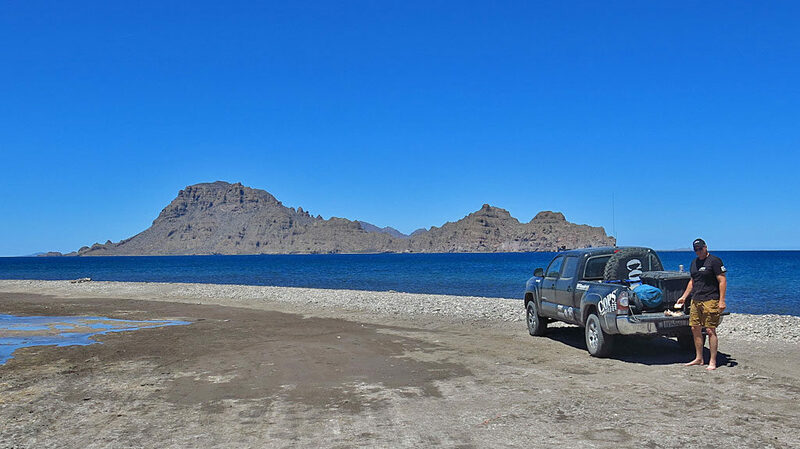 Playa En Bahia Concepcion Magico Lugar. 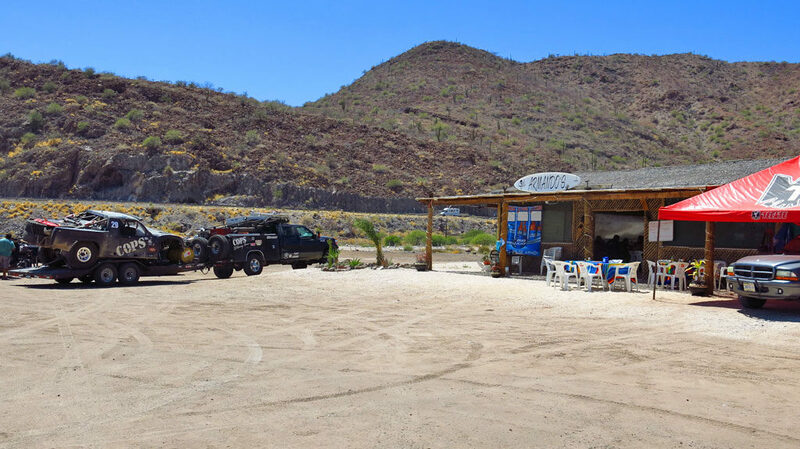 Dennis needed to make an important business stop at Armondo’s at Playa Santispac which just so happens to serve a pretty good lunch. 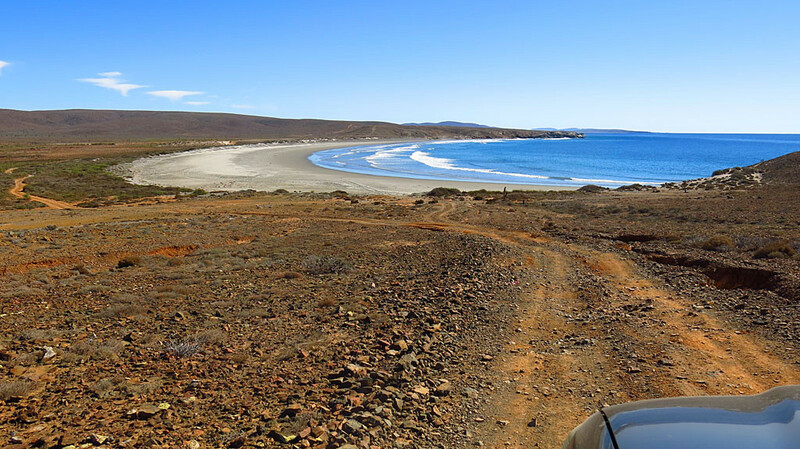 A photo sphere taken at Microondas Tiburón — Bahía Concepción to the south and Mulegé to the north. 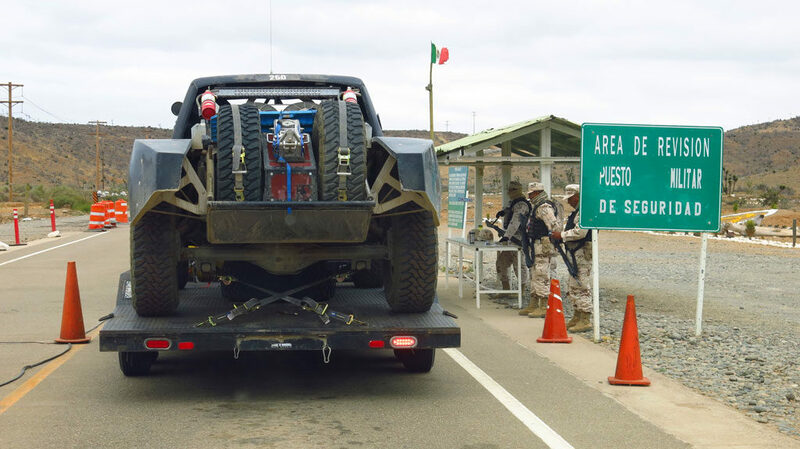 Passing thru one of the handful of military checkpoints along Highway 1 — homeward bound. 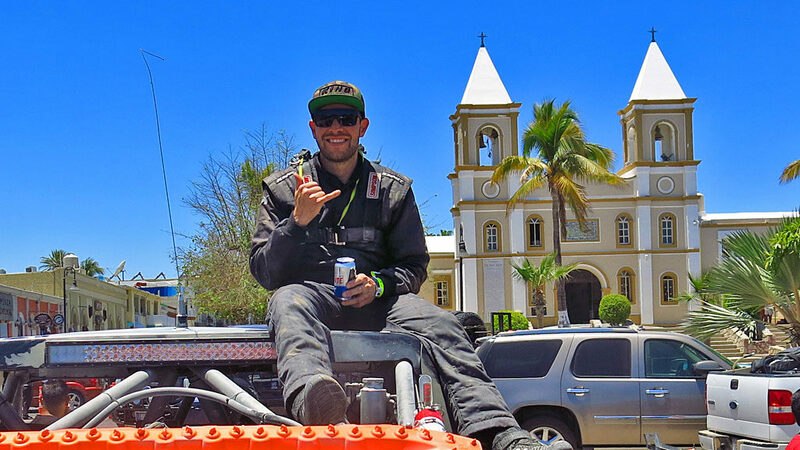 12 things we learned on the Mexico 1000 — As our internal organs recover, some thoughts from possibly the world’s greatest race. 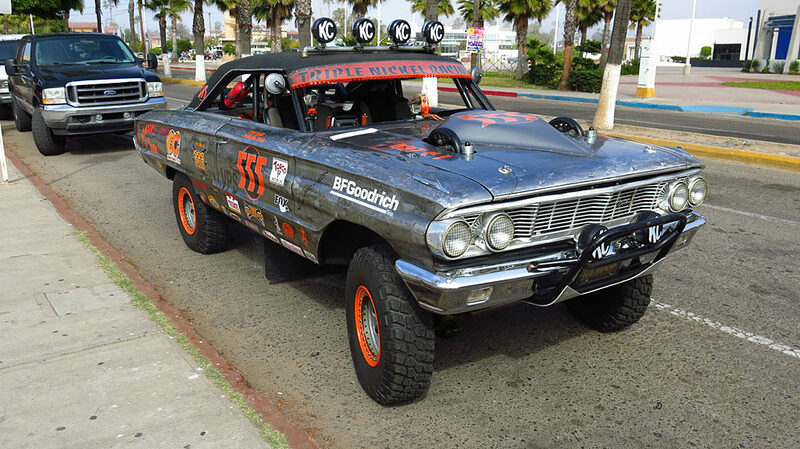 First Baja 1000 – 27 Hours to La Paz — The first official race started in Tijuana, Baja California, on October 31, 1967, and was named the NORRA Mexican 1000 Rally. 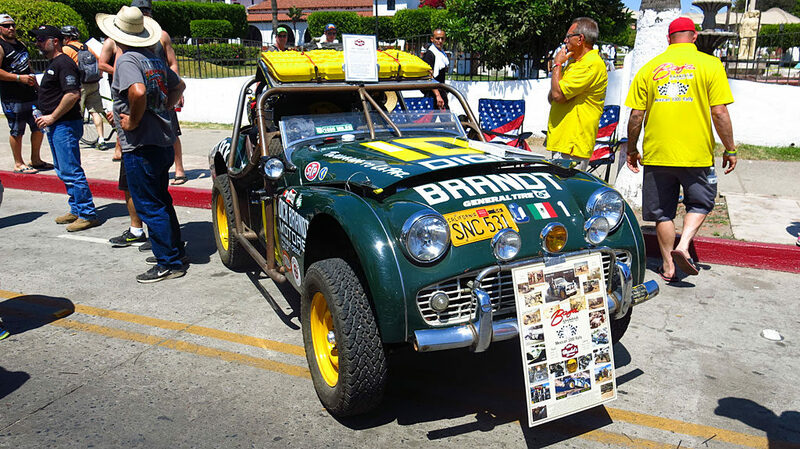 The course length that year was 849 miles (1,366 km) and ended in La Paz, Baja California Sur, with the overall winning time of 27 hours 38 minutes (27:38) set by Vic Wilson and Ted Mangels while driving a Meyers Manx buggy. 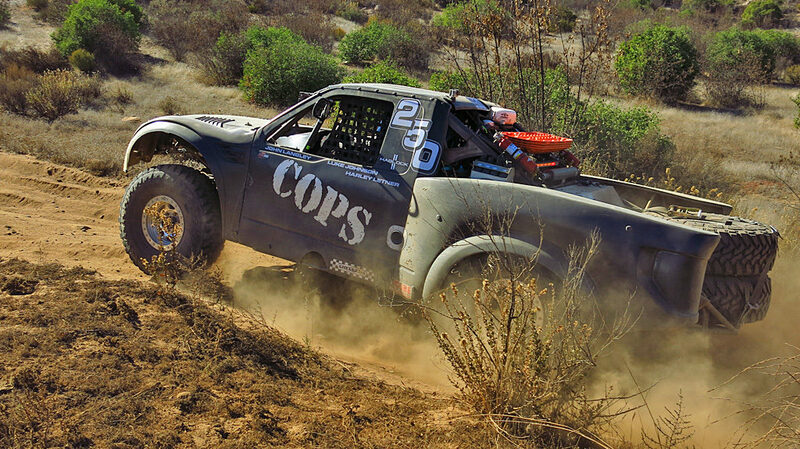 COPS Racing was campaigning Trophy Truck #50, driven by Zak Langley; the Class 10 car was driven by Morgan Langley, and John Langley handled the driving duties of the brand-new Trophy Truck Spec. 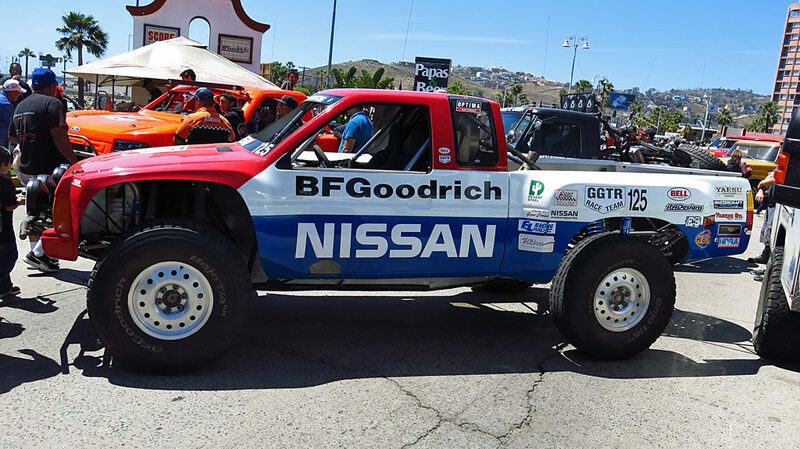 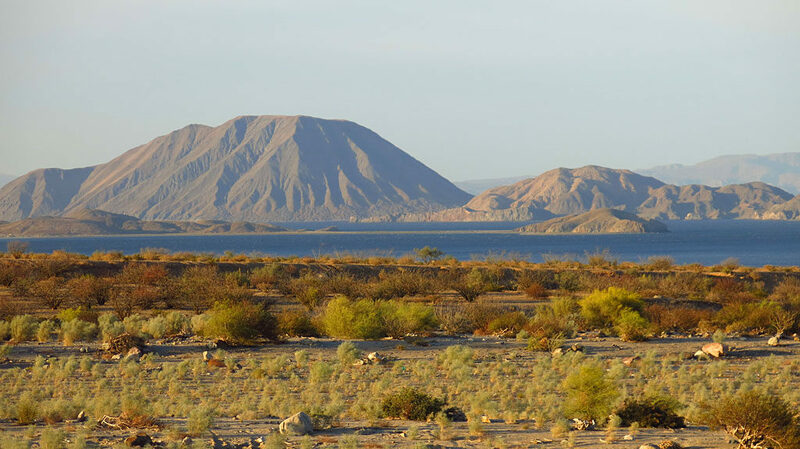 The 830 mile course started in Ensenada, with a loop south along the Pacific, east to the Sea of Cortez, then north to San Felipe, then west, back to the finish in Ensenada. 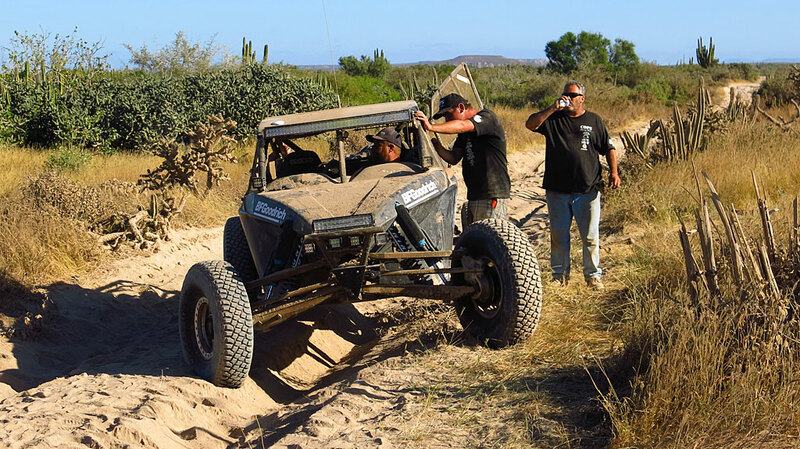 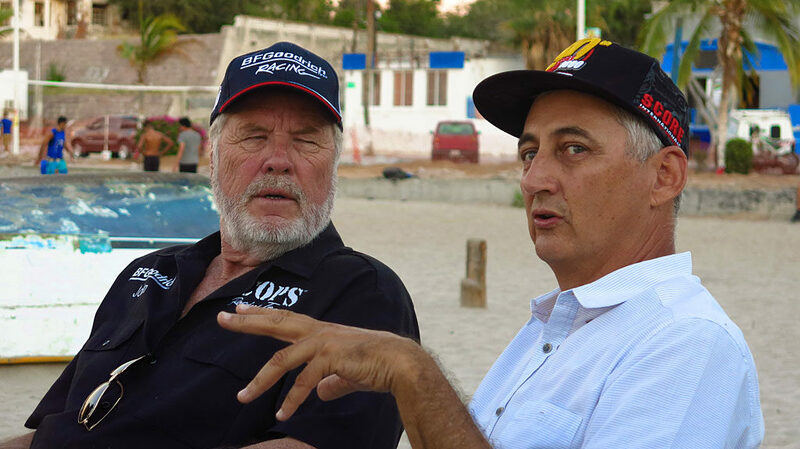 Our first stop in Baja was at the Horsepower Ranch outside Ensenada with its Legends Party, where off-road legends, Rob MacCachran and Rufus Parnell “Parnelli” Jones, were inducted into the Hall of Fame. 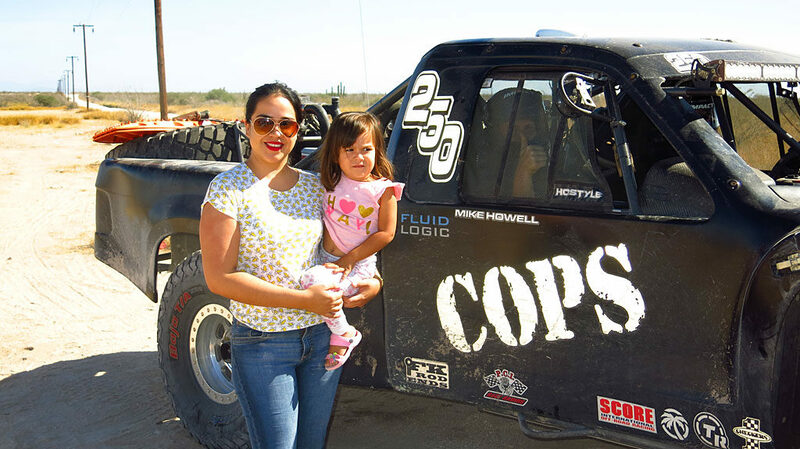 The McMillins provided their contemporary race trucks for static display at Horesepower, plus Mark McMillin was showing his old Class 1 car. 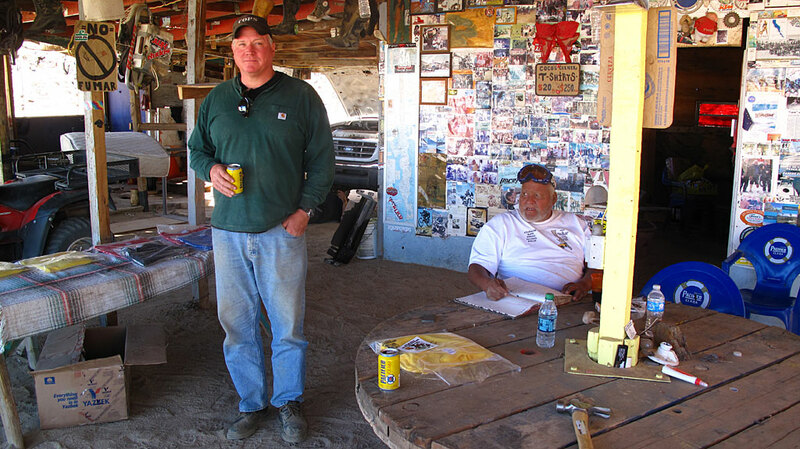 Speaking of Mark McMillin, the food at the Ranch was exceptional. 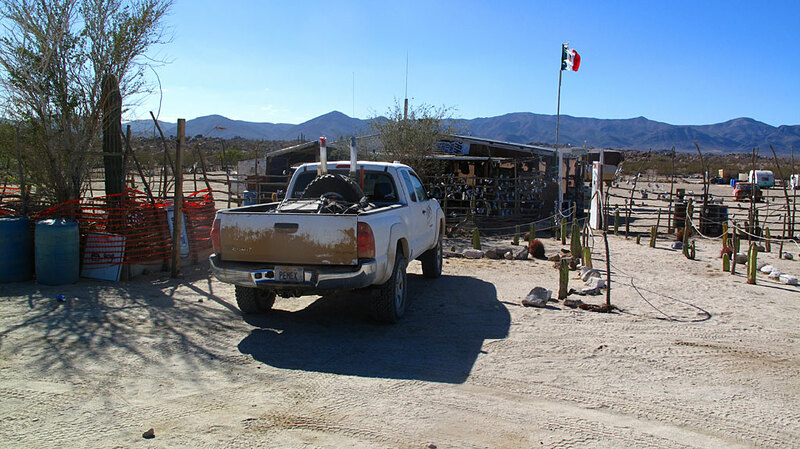 On Thursday we left Horsepower Ranch and headed toward the hotel at Cataviña via Highway 5 and San Felipe. 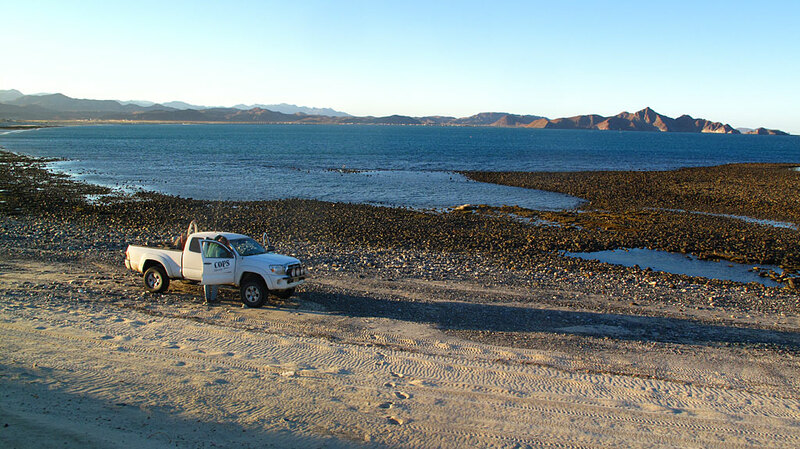 This is the end of the pavement, about 25 kilometers south of Gonzaga Bay. 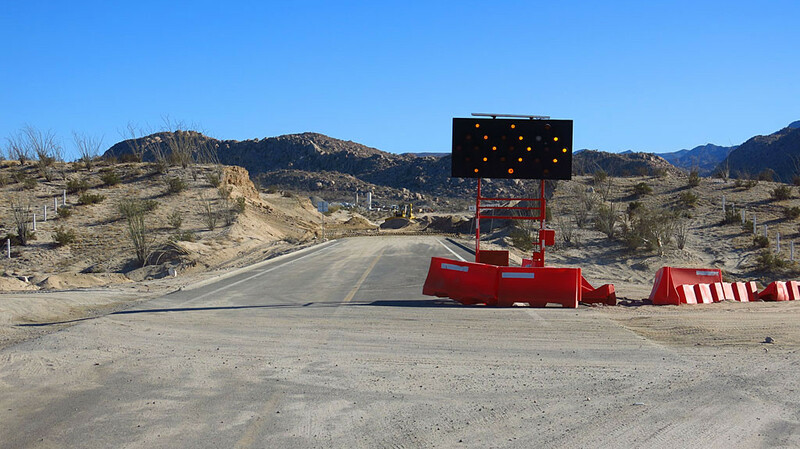 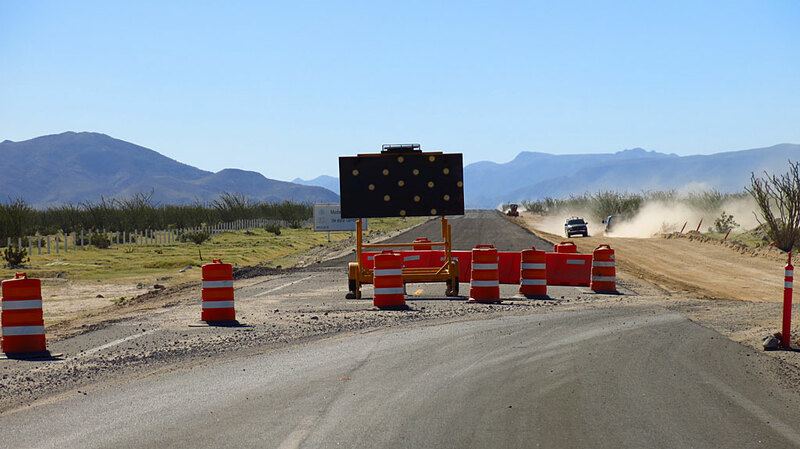 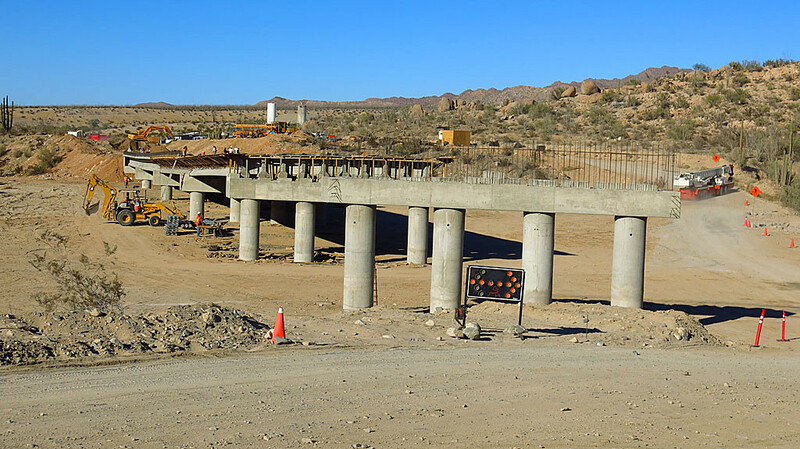 New highway construction is continuing to the south and west, progressing toward Highway 1. 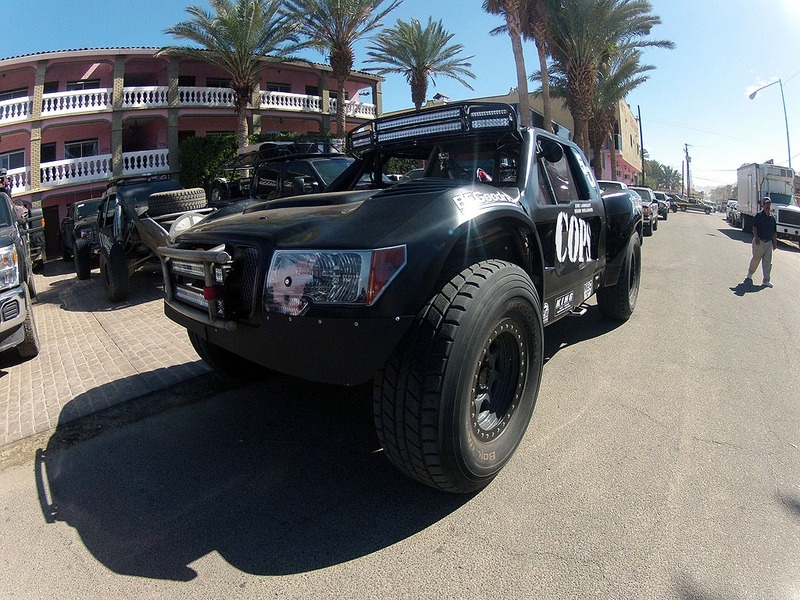 The creeping black death slowly takes over Baja. 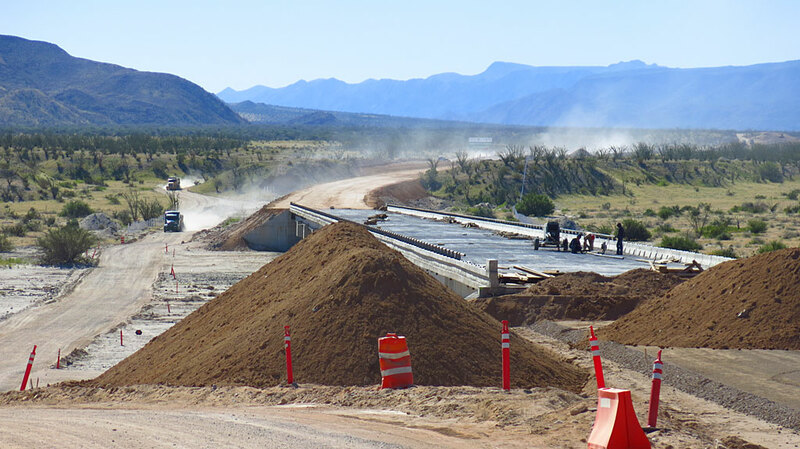 The new highway alignment runs about 2km west of Coco’s Corner, spanning some large arroyos. 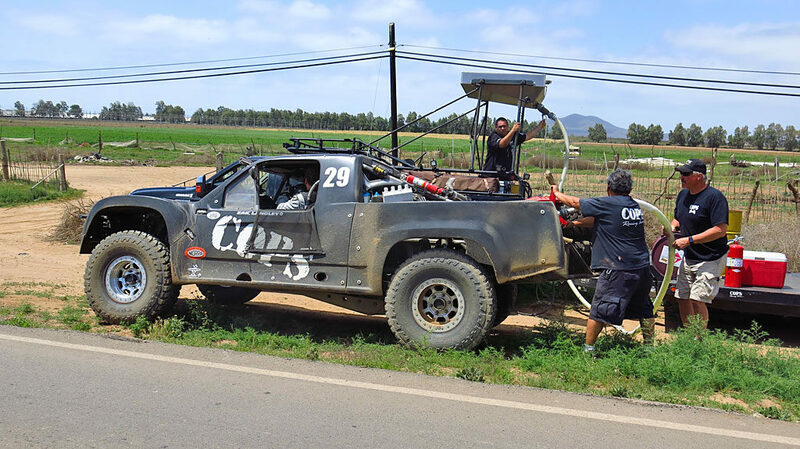 On Friday morning, we left the hotel in Cataviña, and headed to our position on the course at RM435 – the commute took close to six hours. 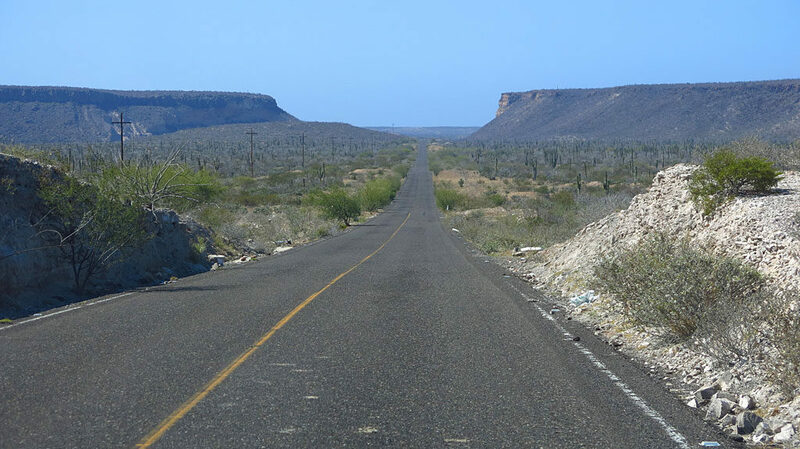 The road west of Highway 1 was scenic and fast. 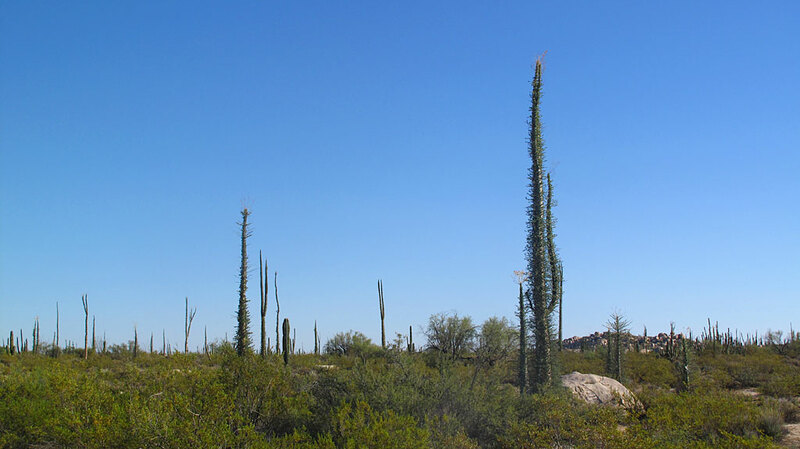 Leaving the highway, the desert was green and happy. 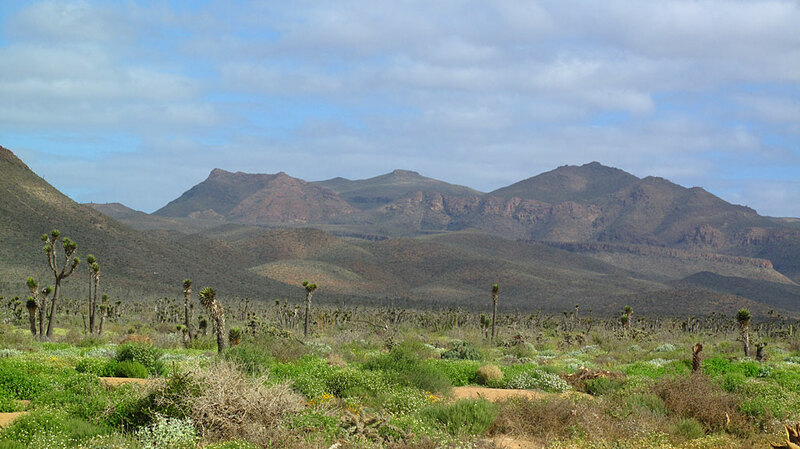 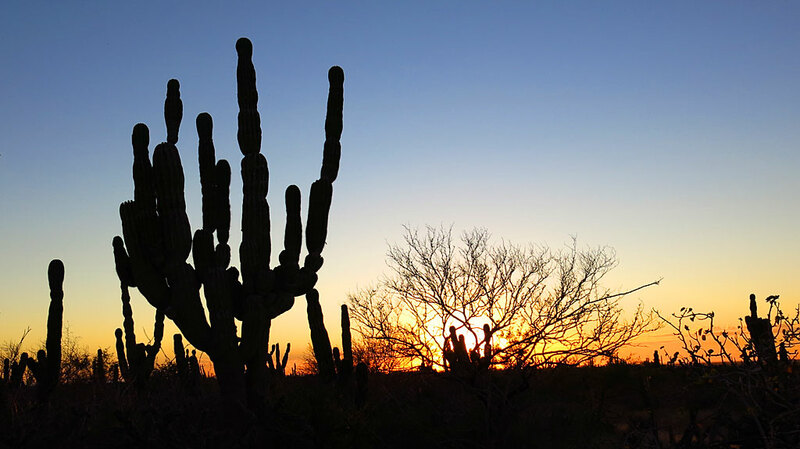 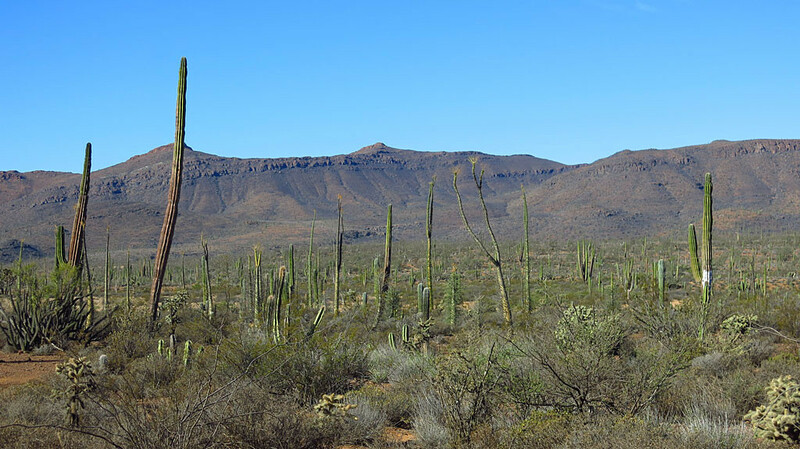 The Cardon, Boogum Trees and cholla were plentiful on the way to the San José de la Piedra fish camp on the Pacific coast. 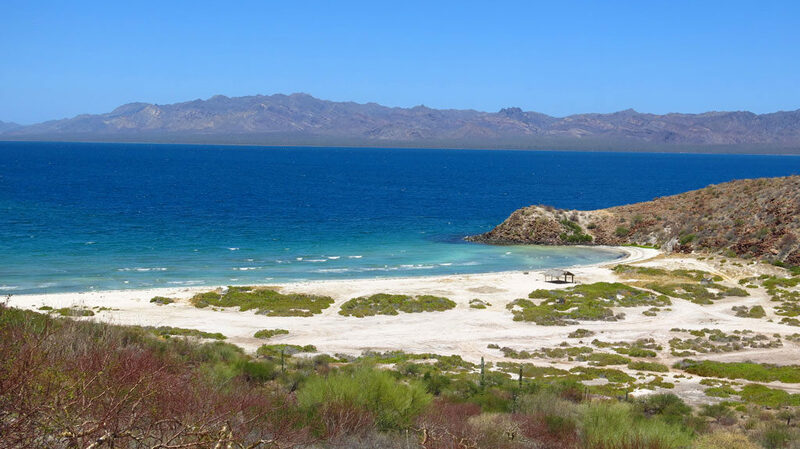 Once at the coast, we drove south about 25 miles, past bay after spectacular bay with no people, no buildings, no nada. 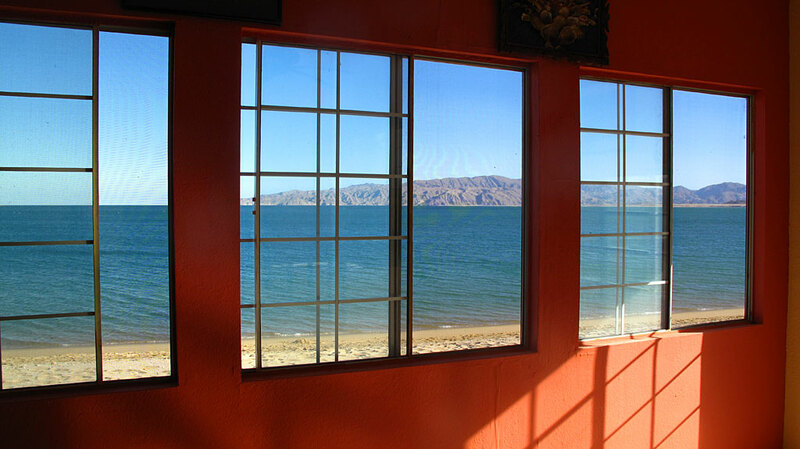 Good Lord, another beautiful bay. 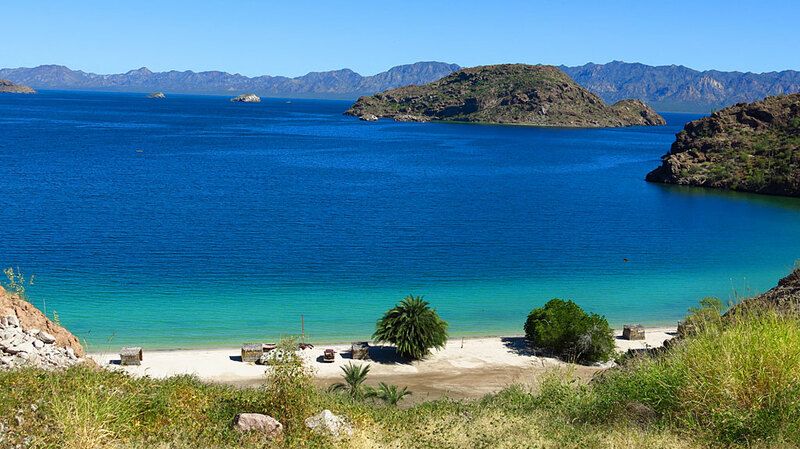 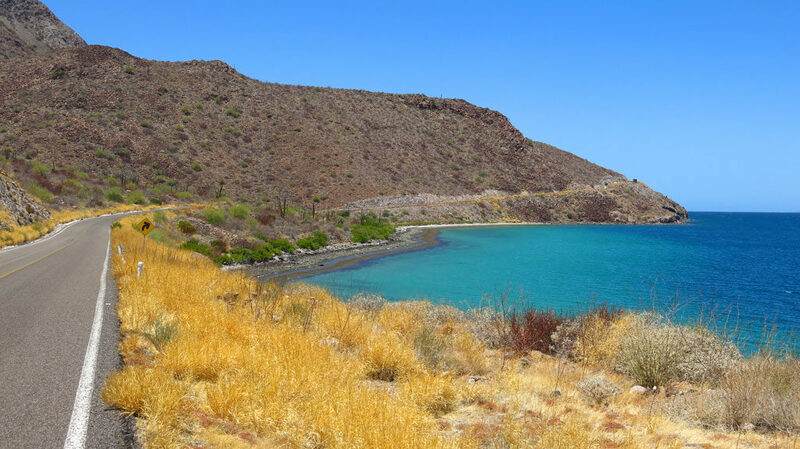 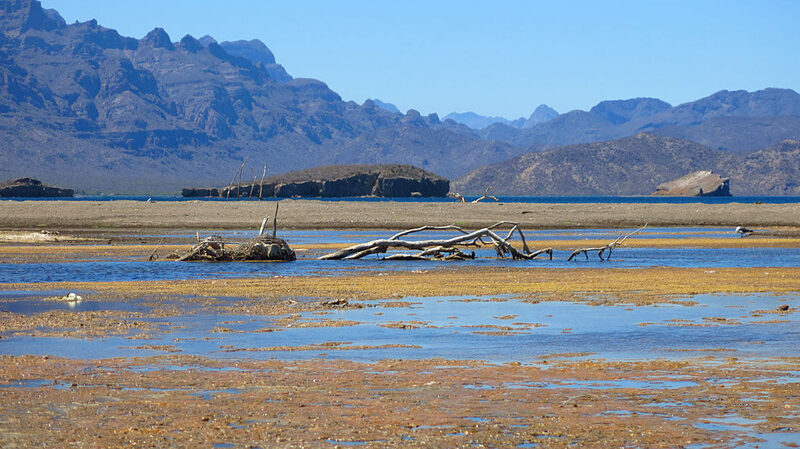 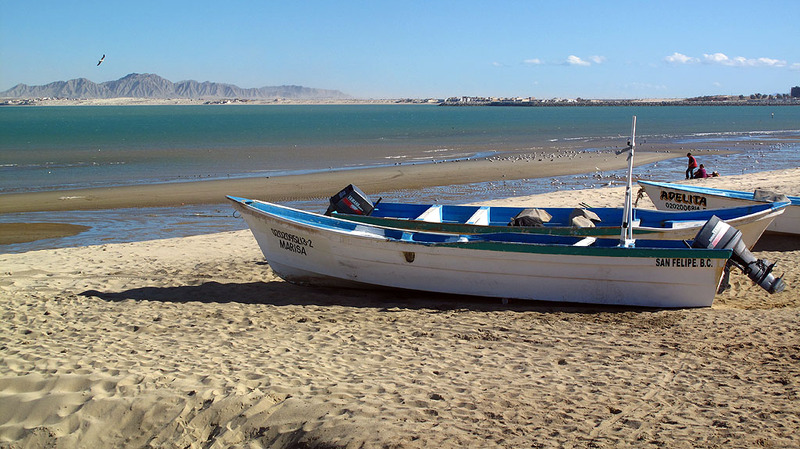 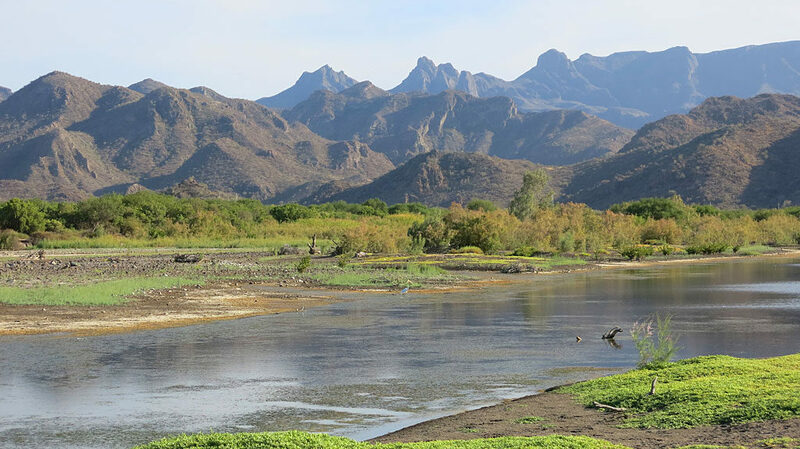 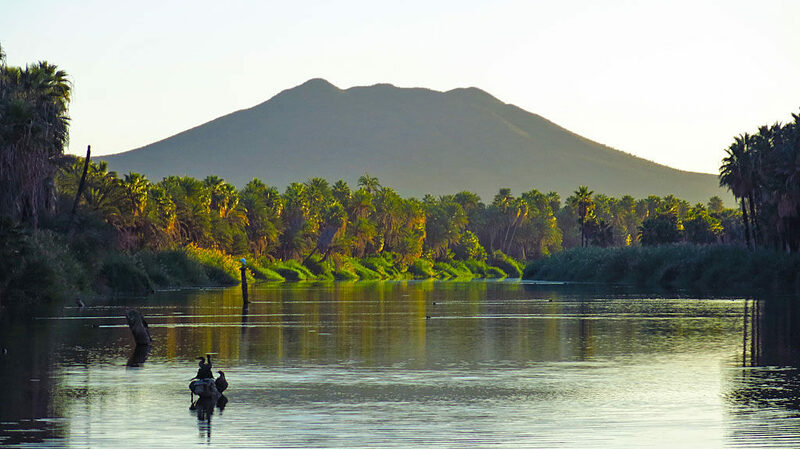 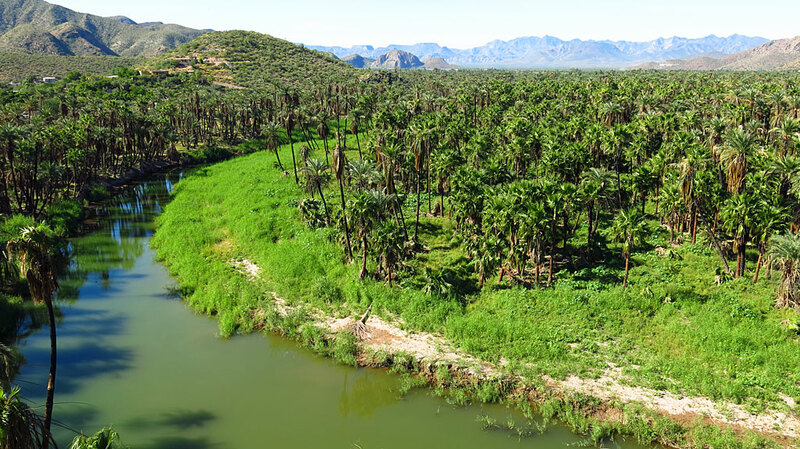 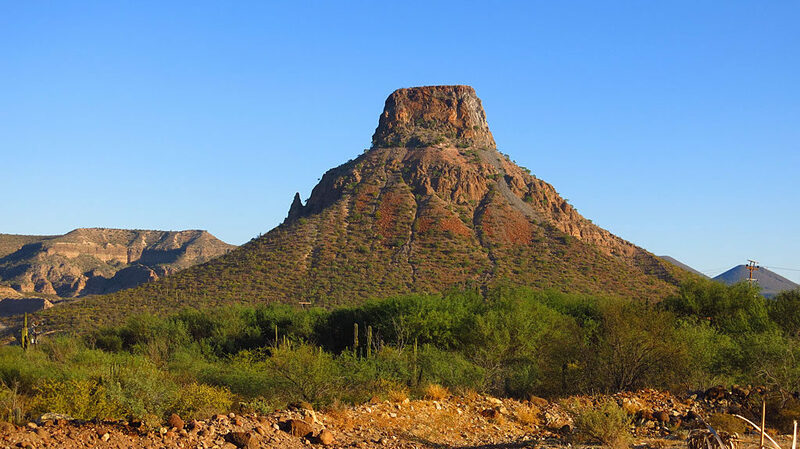 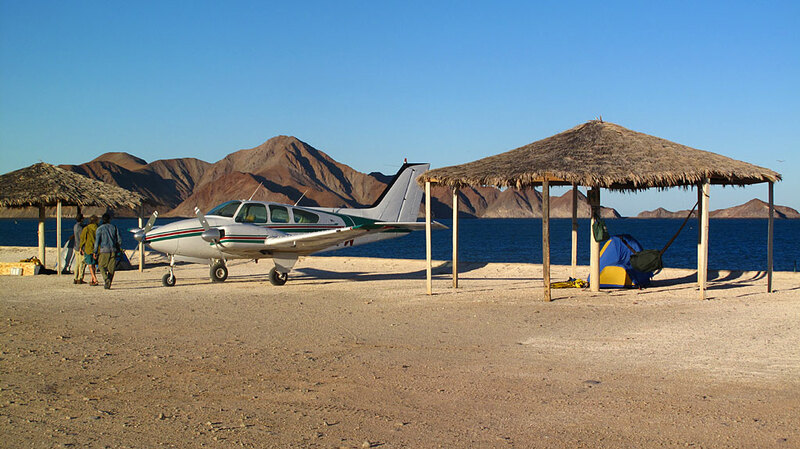 A photo sphere taken at the south end of Bahía Córbin – what the locals call Cuchillo. 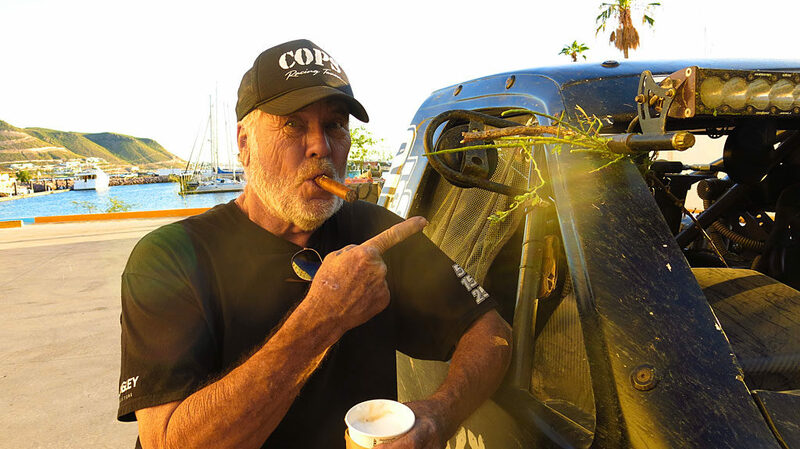 Steve does an excellent Coco impersonation. 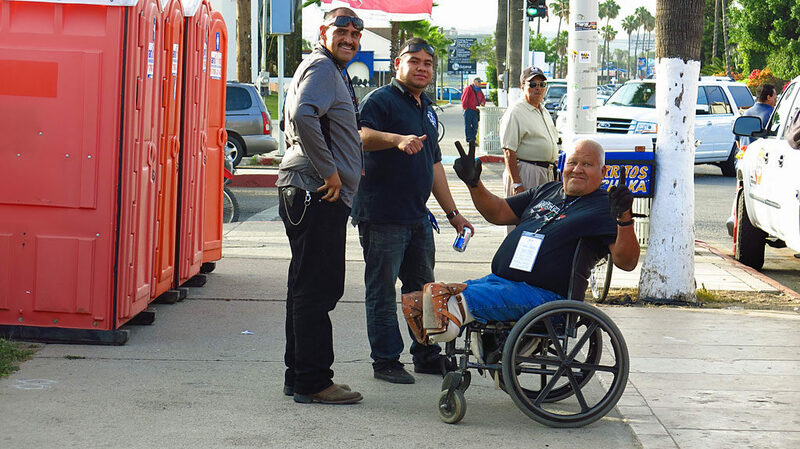 One of the race leaders was 45x ridden by Francisco Arredondo of Guatemala. 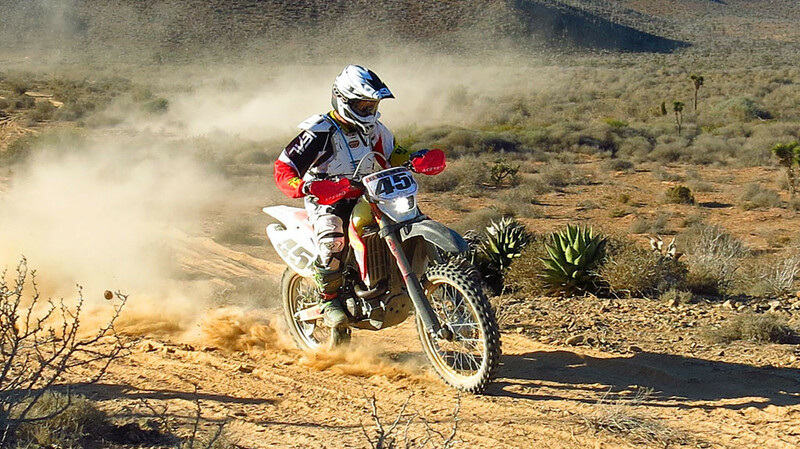 45x would finish the race, third in the Pro Motorcycle class, in 17 hours, 8 minutes. 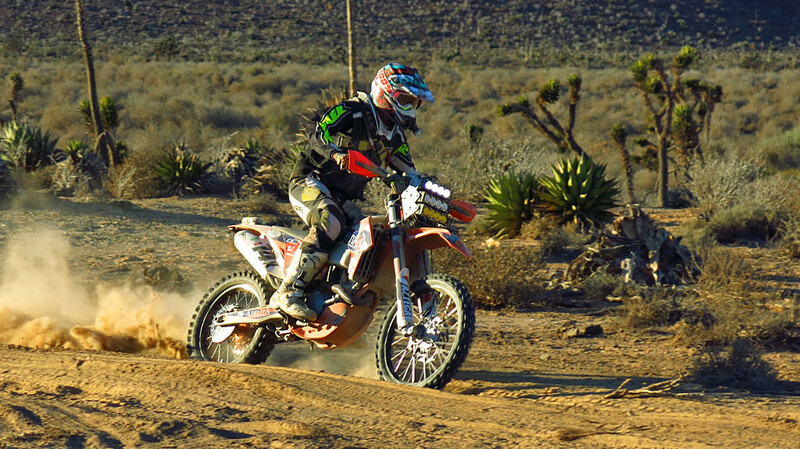 Raul Hernandez riding 14x KTM, finished sixth in the Pro Motorcycle class. 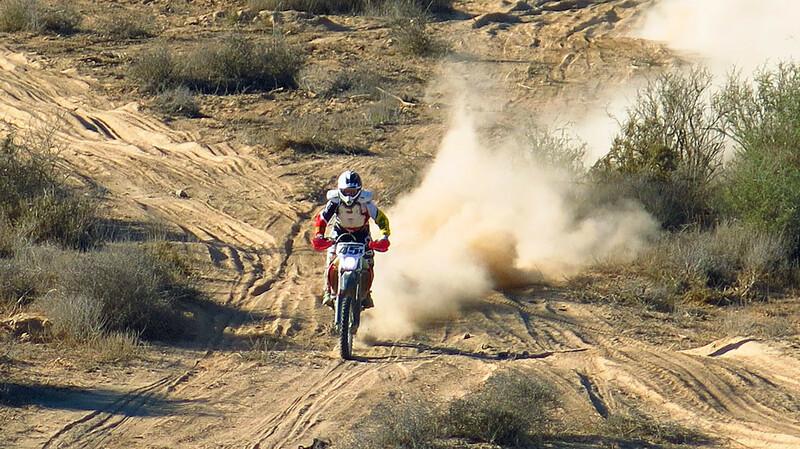 The last rider before sunset. 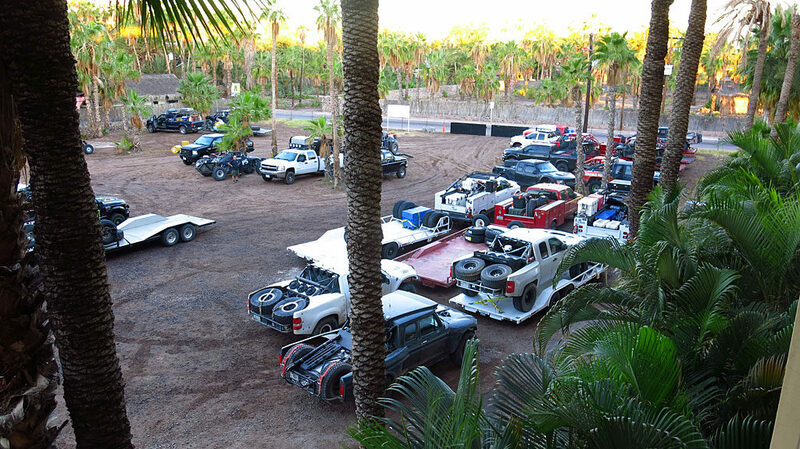 We only had nine hours to kill before our race cars arrive. 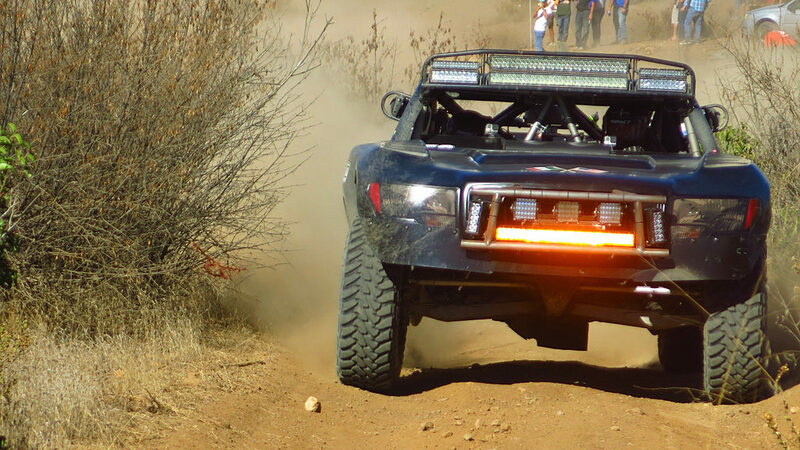 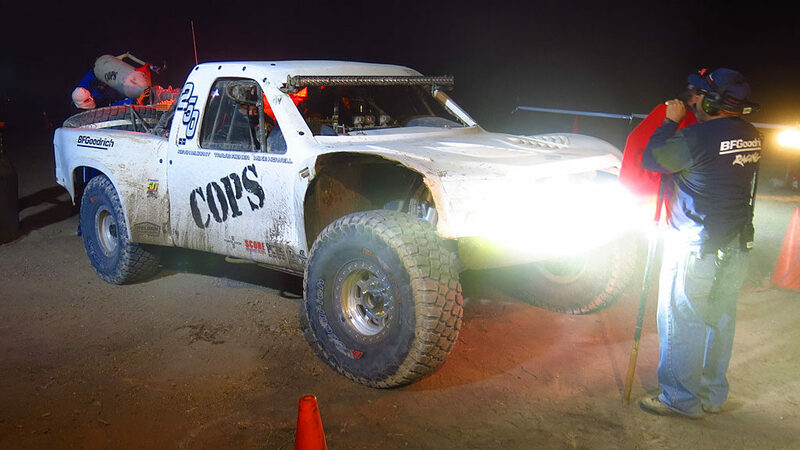 The Trophy Truck and Class 10 were running strong, but the Trophy Truck Spec experienced mechanical problems around Race Mile 250 and couldn’t continue in the race. 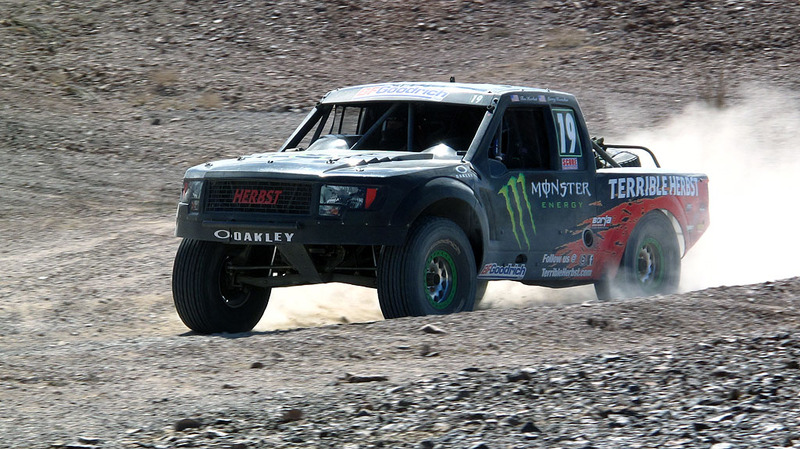 When the checkered flag dropped, the Trophy Truck finished 11th in class, and the Class 10 finished second in class. 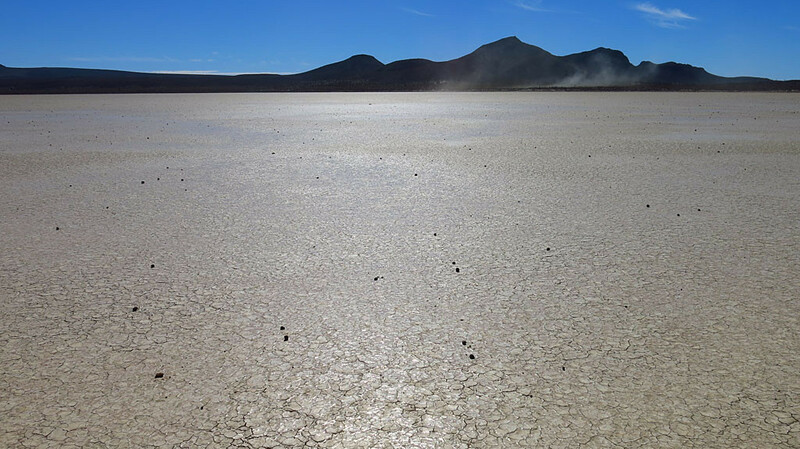 Saturday morning, heading back to civilization, we crossed El Islote dry lake – think: Bonneville Salt Flats (and all associated speed). 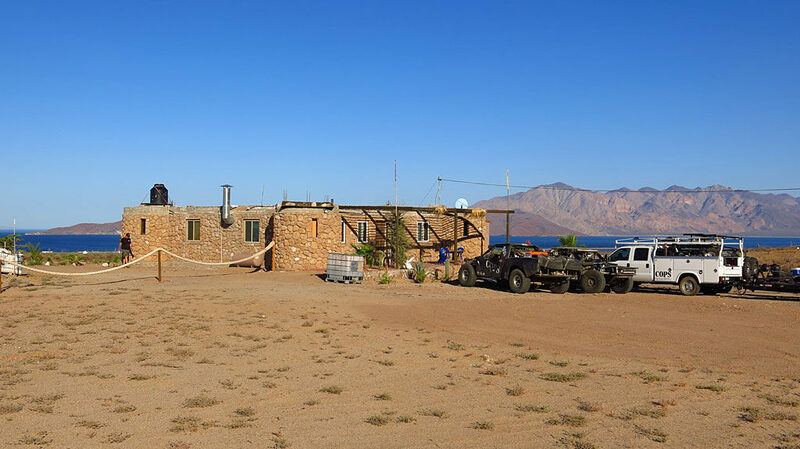 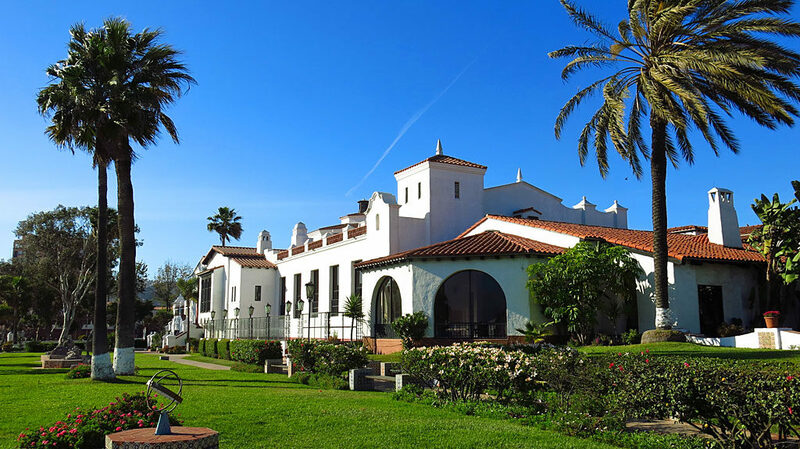 Alfonsina’s in Gonzaga Bay was our Saturday night hotel. 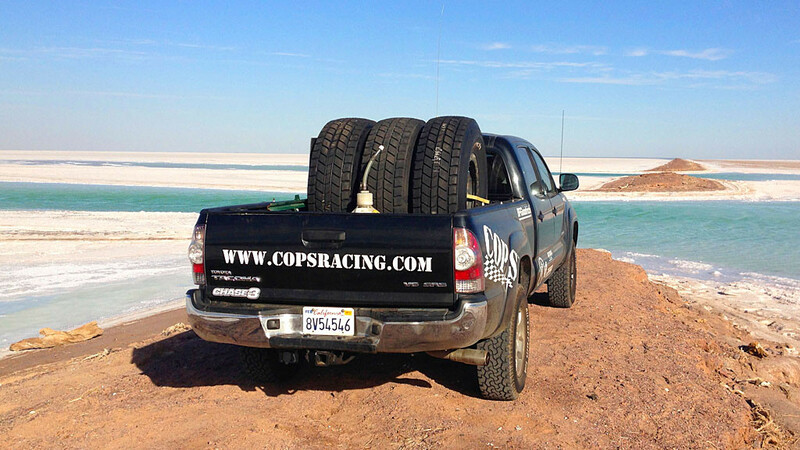 Friday was a long race day, and a shower and bed were greatly appreciated. 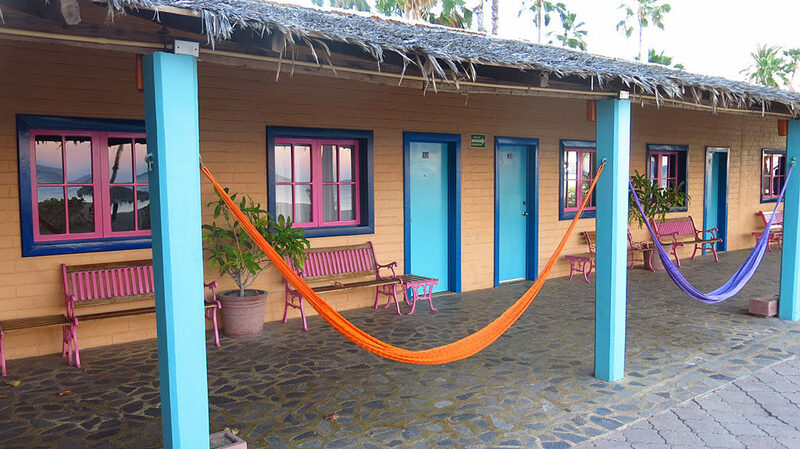 Ahhhh … it’s time to relax at Gonzaga Bay – the end of a 1200 mile weekend. 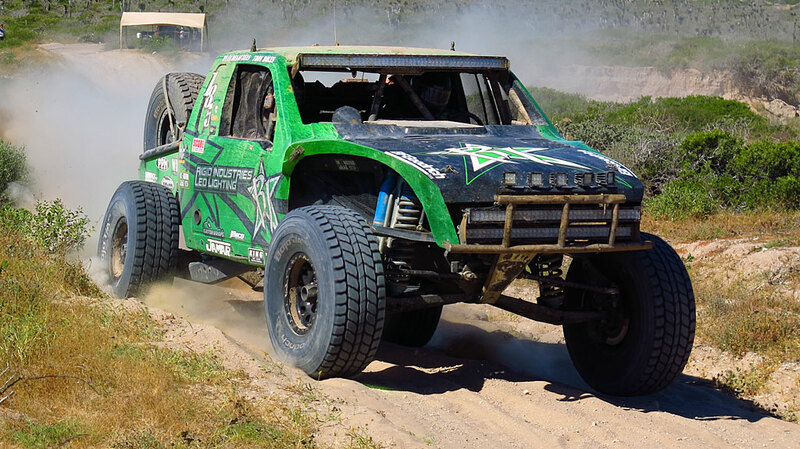 The Baja 250 was run at the end of January — these pictures just got back from processing at Photomat. 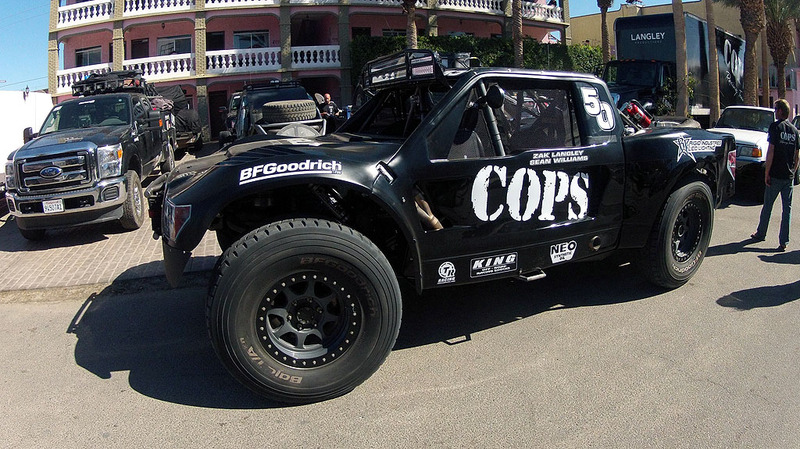 COPS Racing entered three cars in the 250 mile race: the Trophy Truck and two Class 10s. 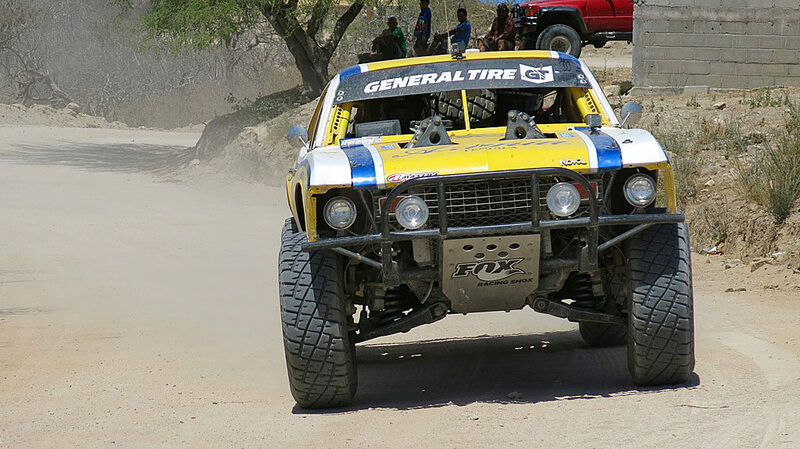 The course consisted of a loop, starting and finishing at the Arches in San Felipe. 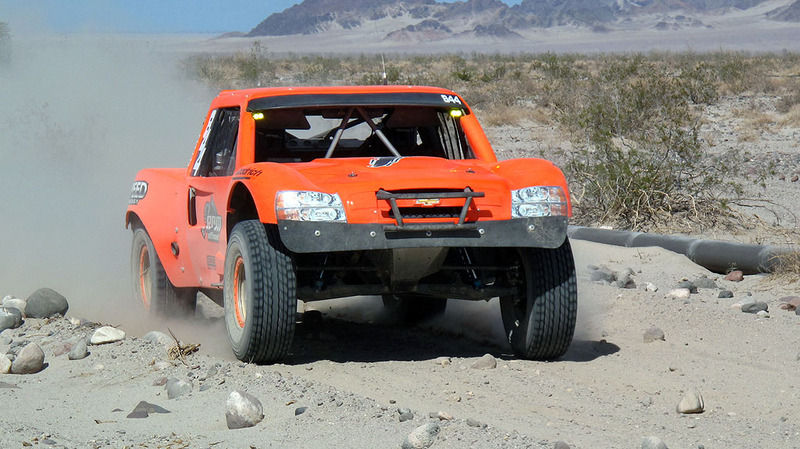 Spoiler alert: Gus Vildosola driving Trophy Truck #21 won the race overall in time of 04:03:41.195. 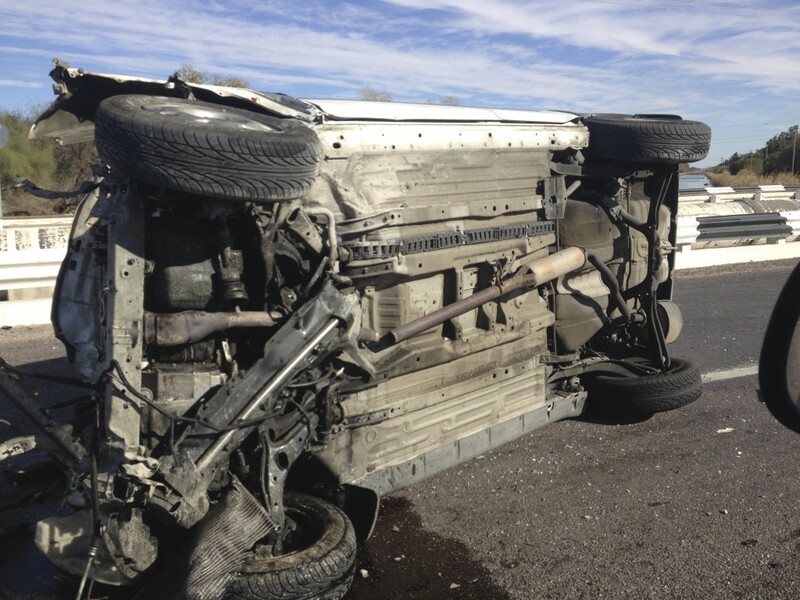 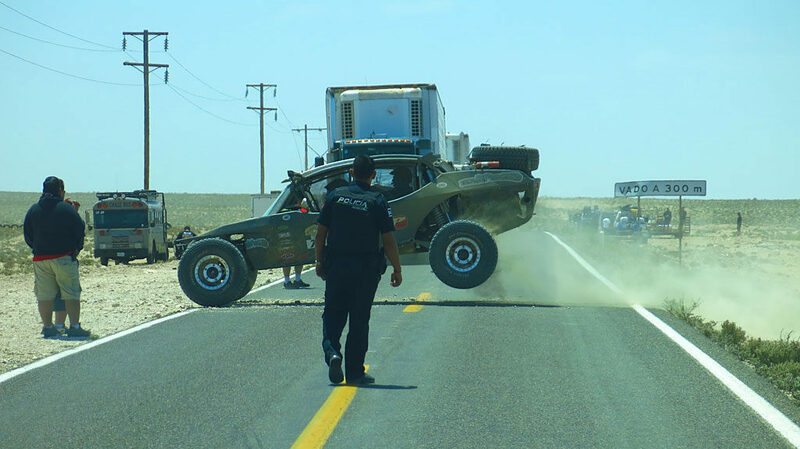 On my drive to San Felipe, south of Mexicali, I passed a truck on its side on the highway – a reminder to be attentive while driving. 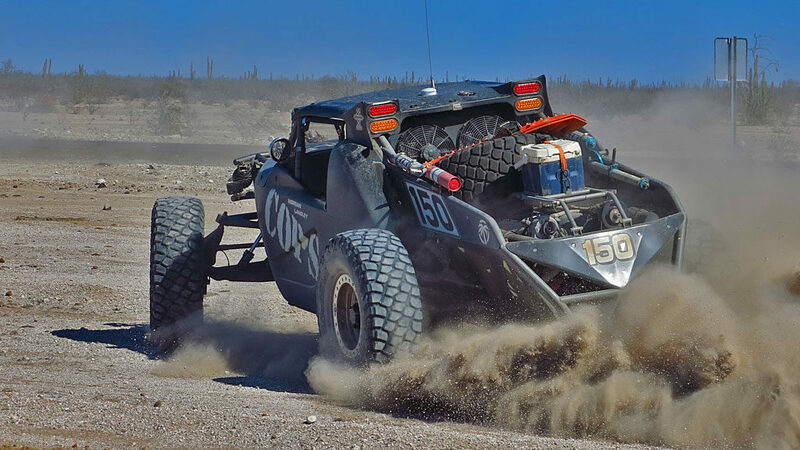 Among other things, I took down three, 42″ BGF Baja TA Trophy Truck tires to the race — each wheel set clocks in at 160 pounds which makes it a challenge to lift. 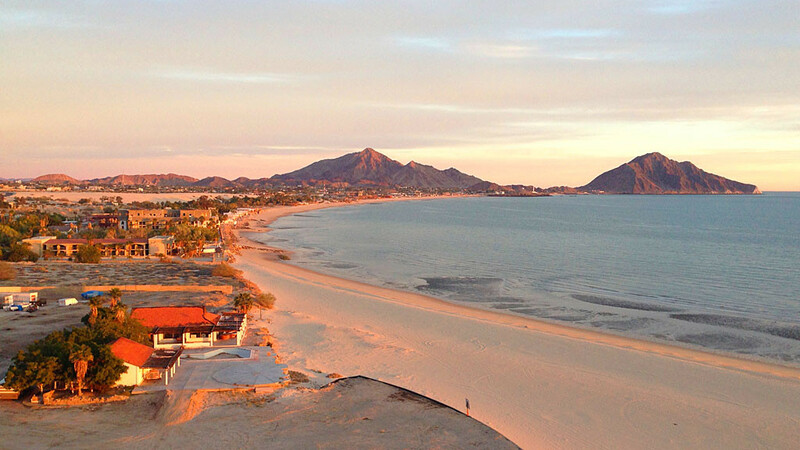 A spectacular San Felipe sunrise seen from the sixth floor of the Playas del Paraiso Resort. 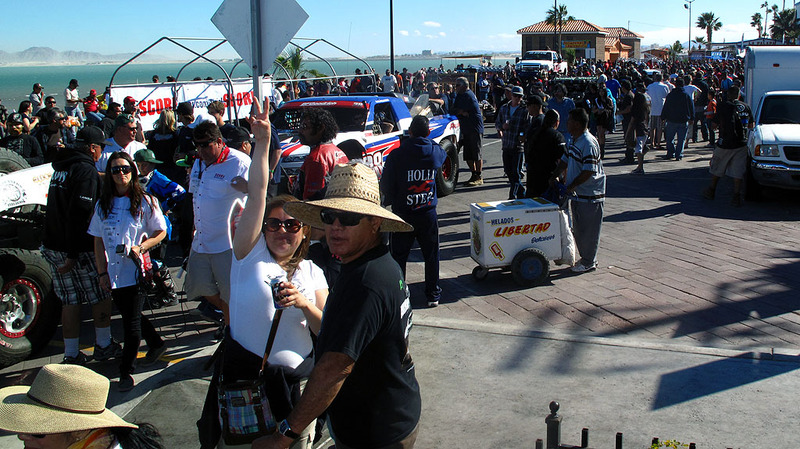 Contingency is held the day before the race on the Malecón – a place where local race fans can get close to the race cars and meet the drivers. 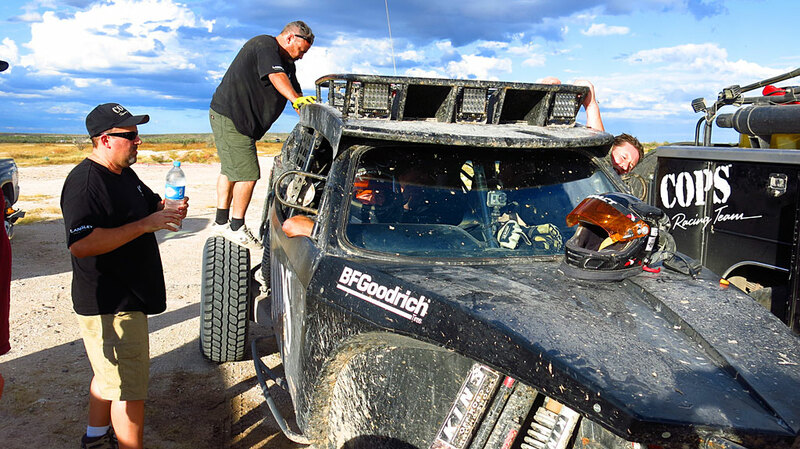 Zak gets some new sunglasses while passing thru Contingency – gotta look good while piloting the Trophy Truck. 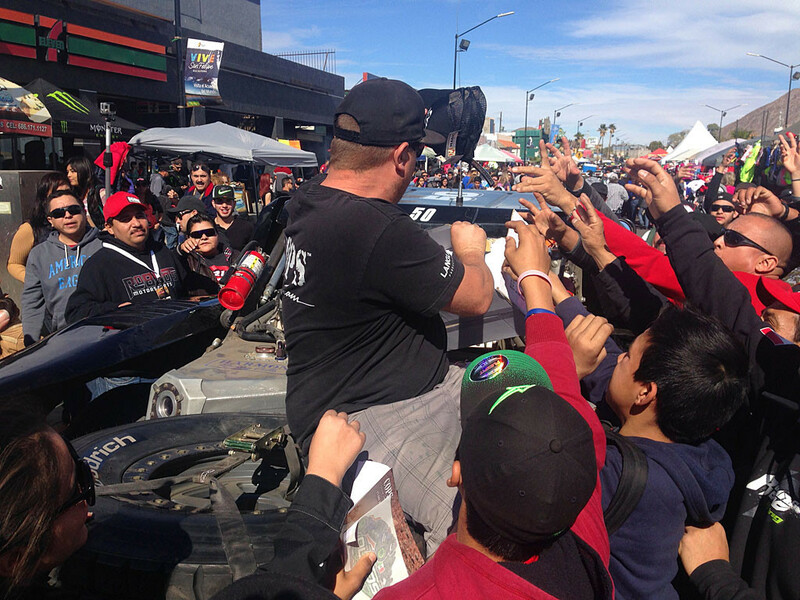 Handing out hats (or other free stuff) creates a frenzied excitement among spectators. 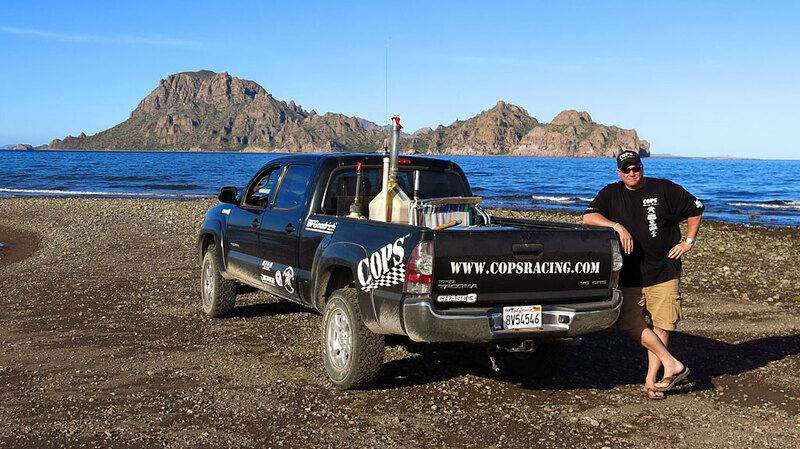 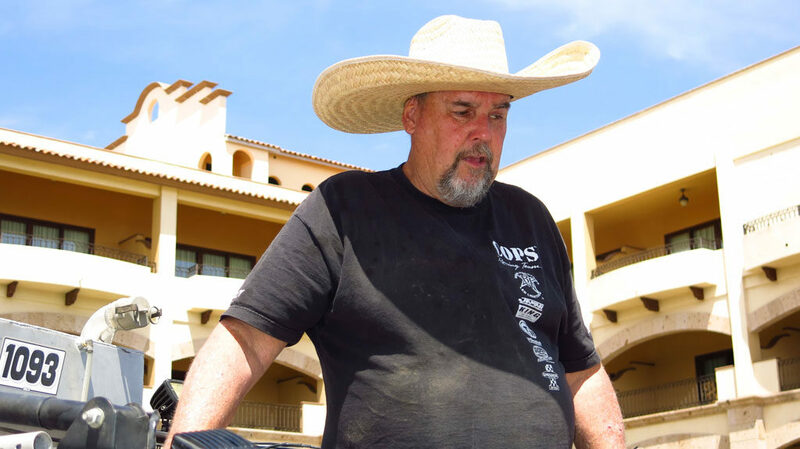 John Langley, COPS Racing Team Owner, with the world-famous Baja Kat. 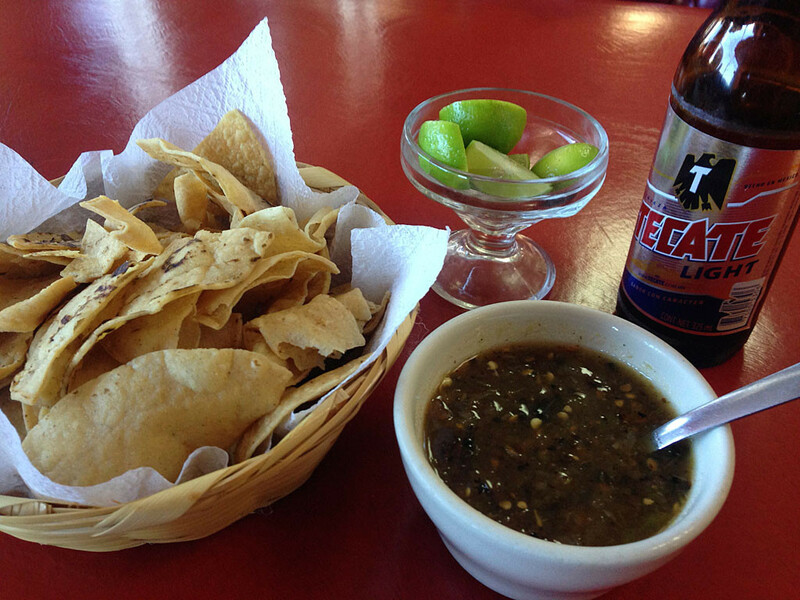 Pre-dinner chips and salsa and beer. 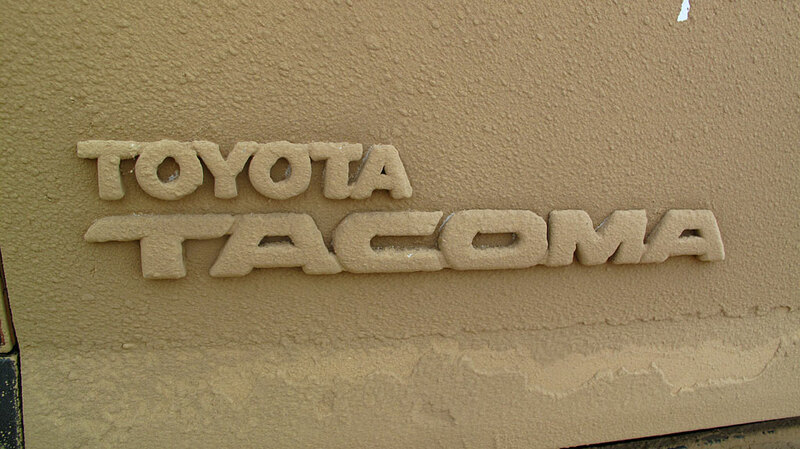 Note to people in the mid-west: this is what chips are supposed to look like. 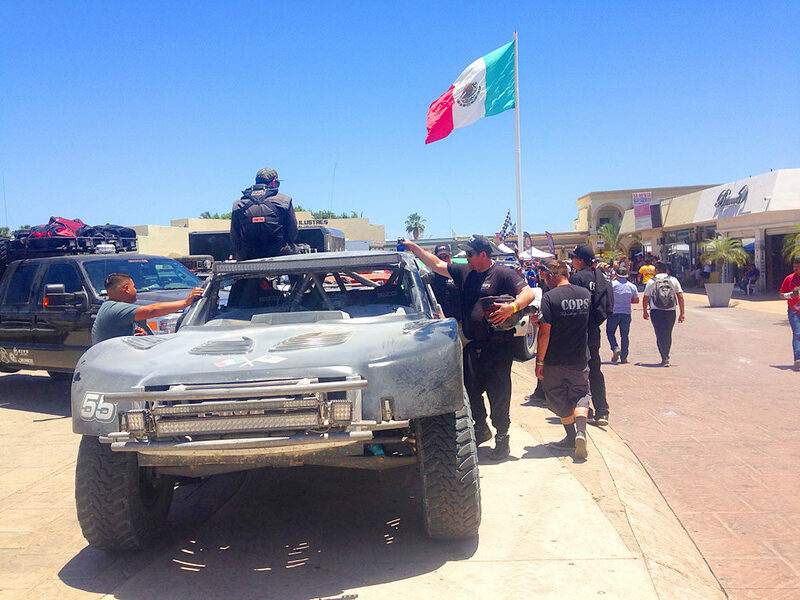 Staging along the course, race crews and spectators wait for the race to get to them – we won’t see race cars until 90 minutes after the they start in San Felipe. 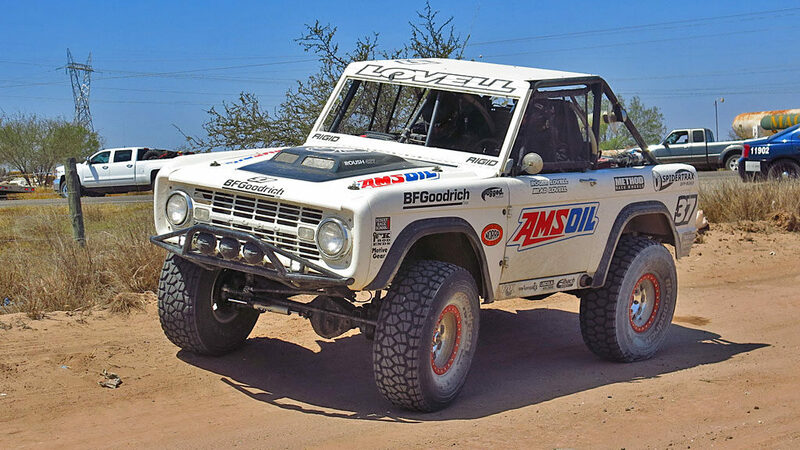 Clyde Stacy’s #5 RPM Racing Chevy Rally Truck was first on the course at RM85 with a several-minute lead on the number two position. 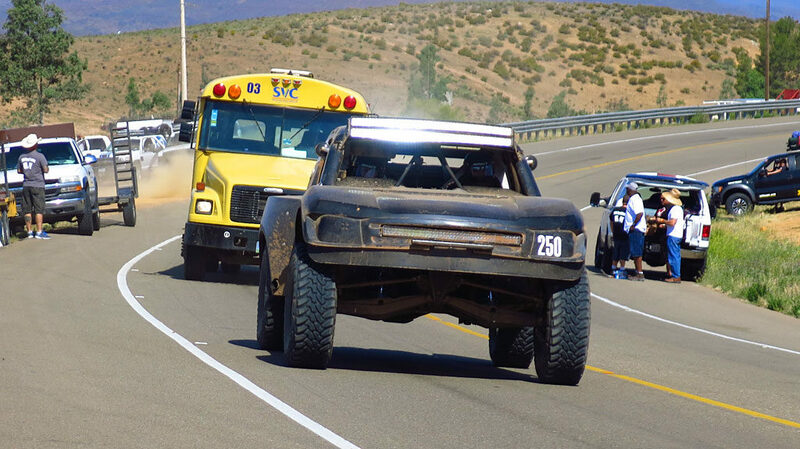 He ultimately finished third. 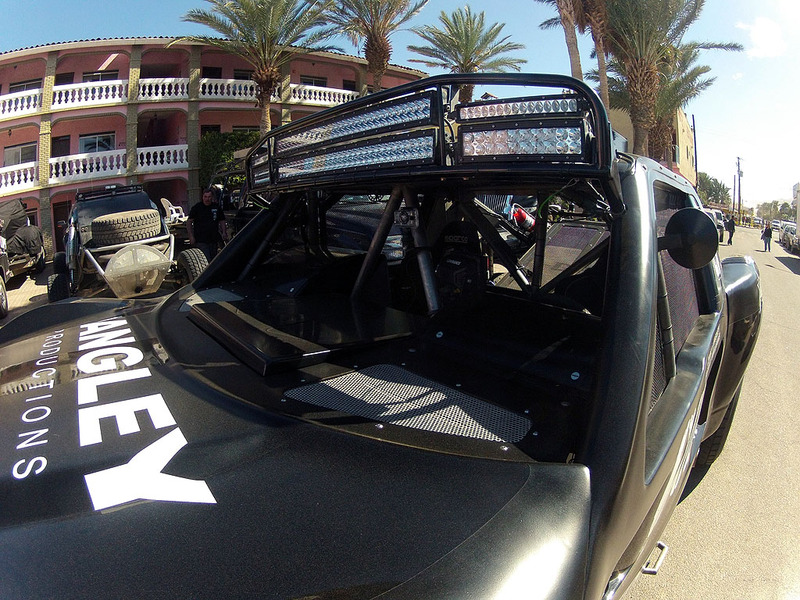 Zak Langley is in the hunt for the win in Trophy Truck #50. 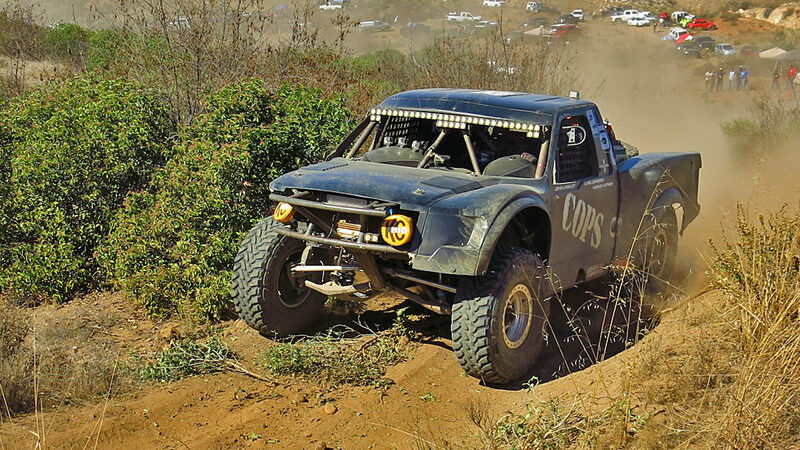 Zak came up thru the pack and finished 17th in class. 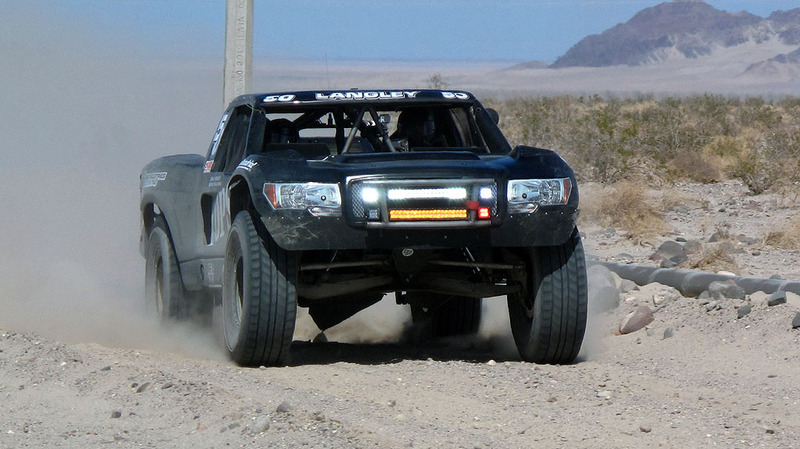 Harley Letner drove one of the Team’s Class 10s for the first half of the race before handing it over to John Langley for the race to the finish. 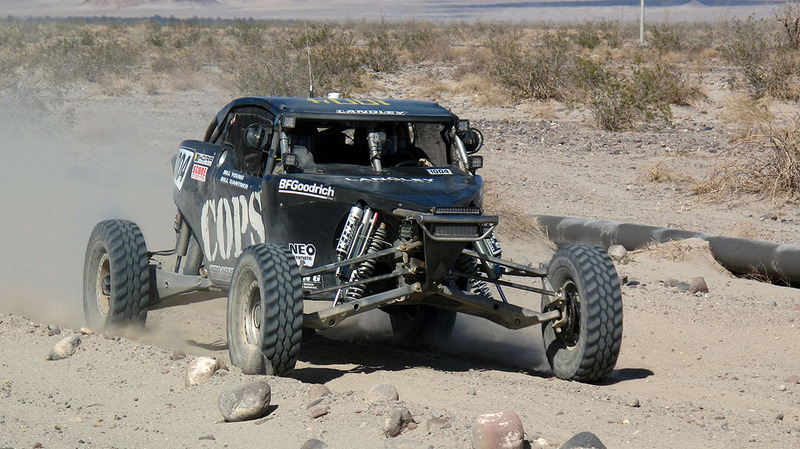 Morgan Langley drove the other Class 10. 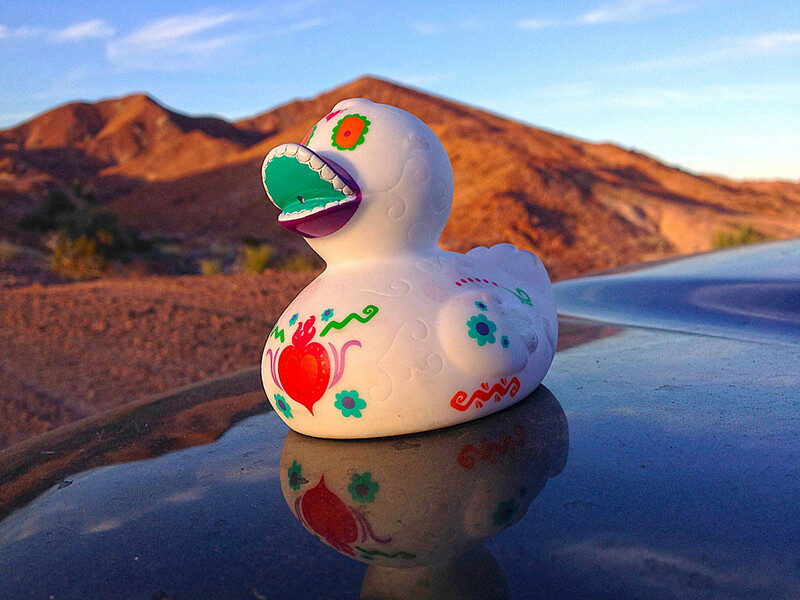 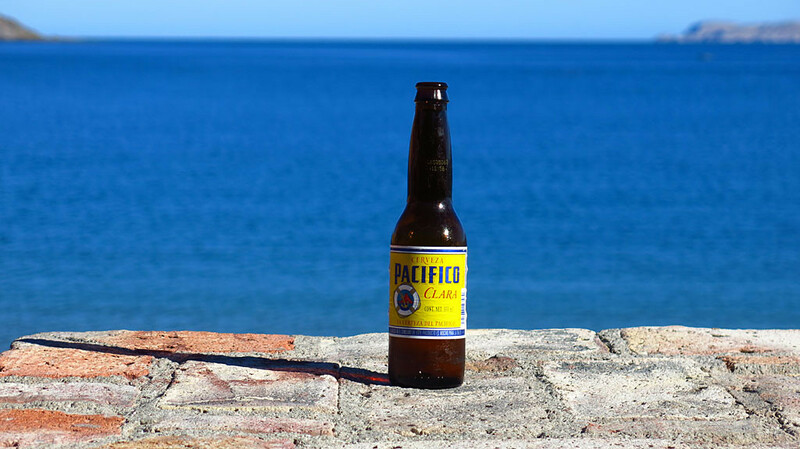 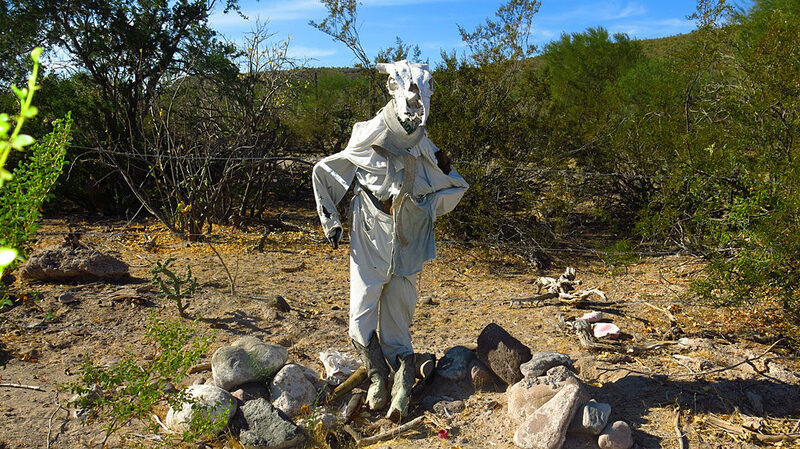 Día del pato muerto – our Baja traveling companion. 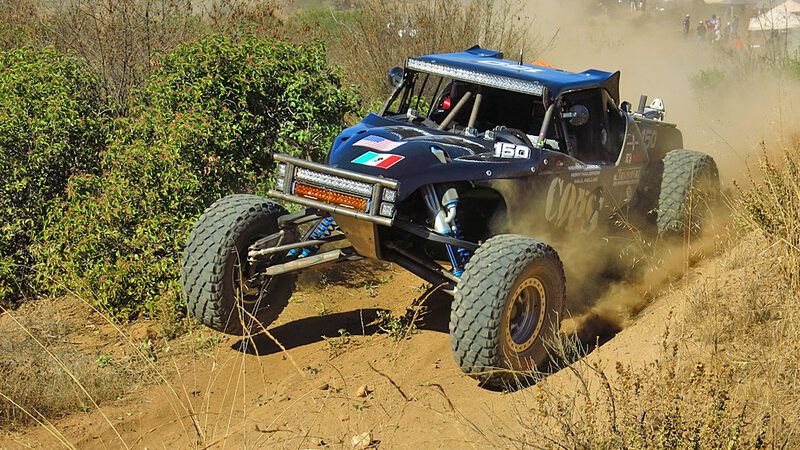 One of the Class 10 wheels underwent a transformation during the race. 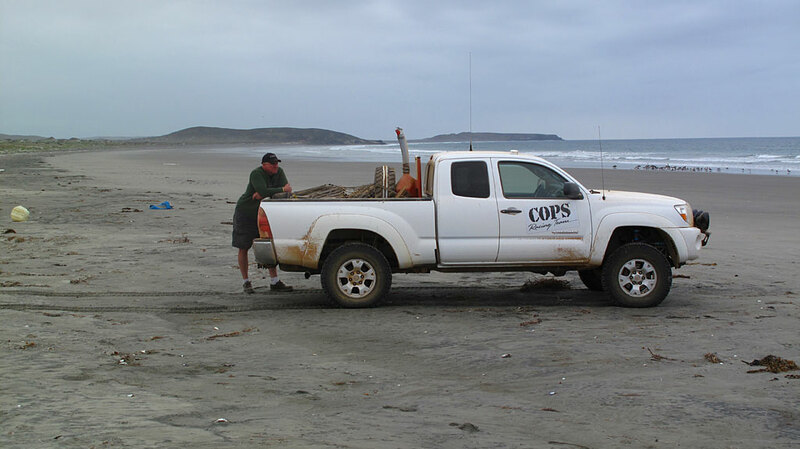 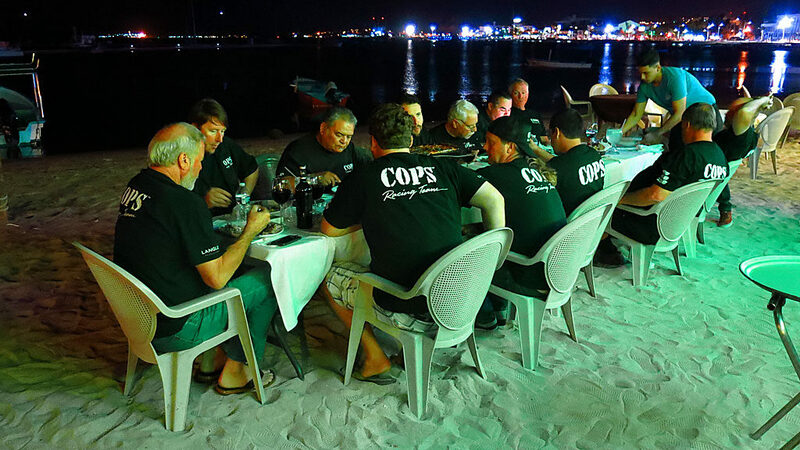 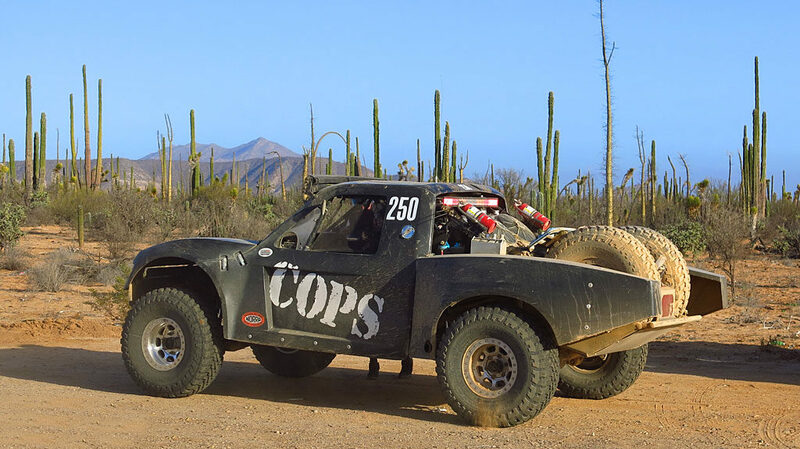 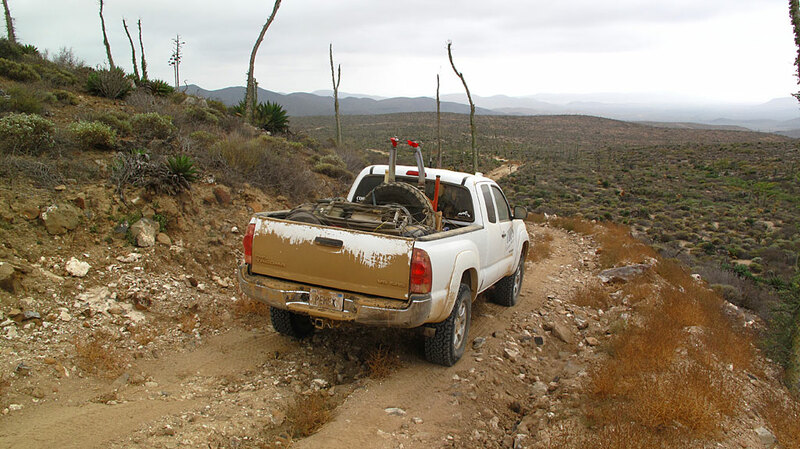 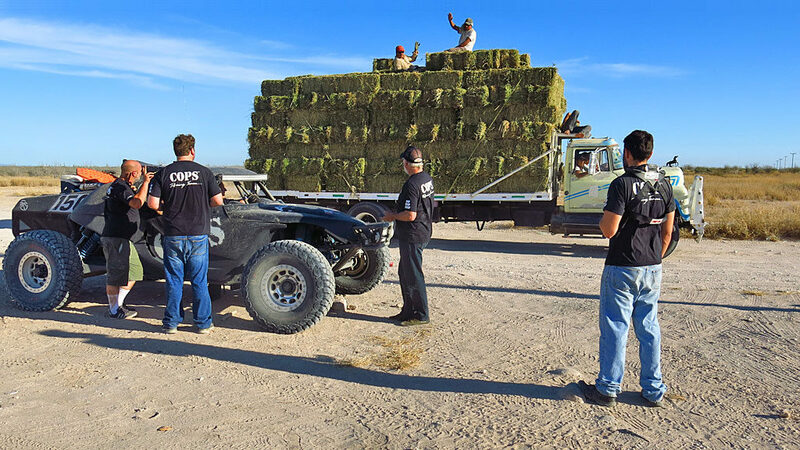 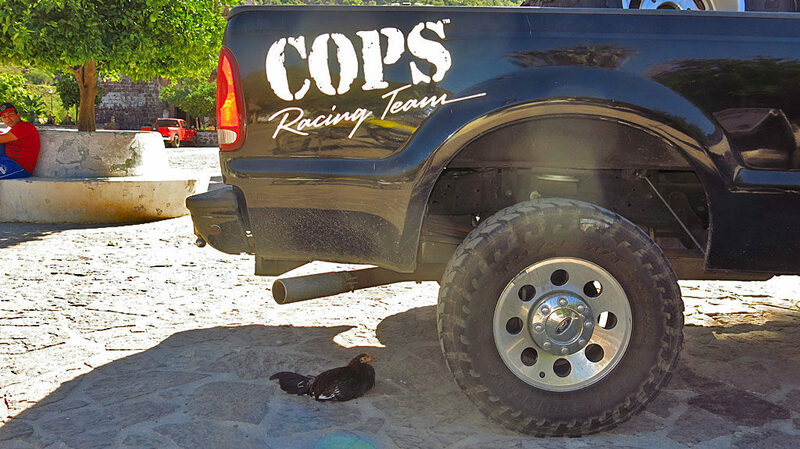 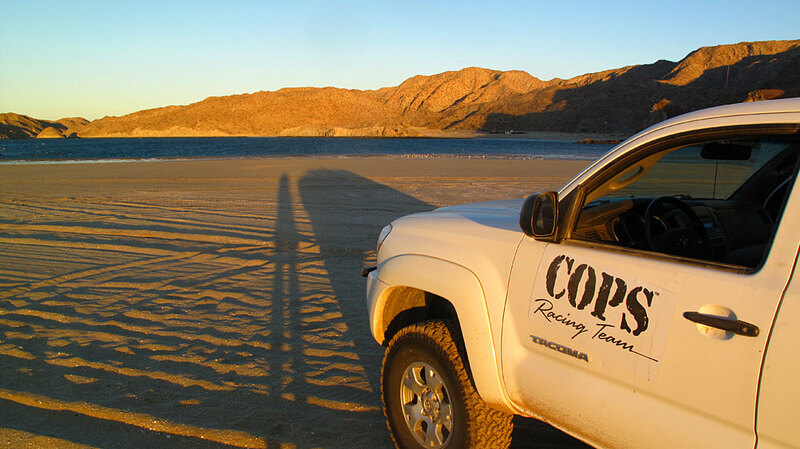 For the purpose of the Baja 1000 Off Road Race, COPS Racing divided the peninsula into thirds, to best manage crew and logistics. 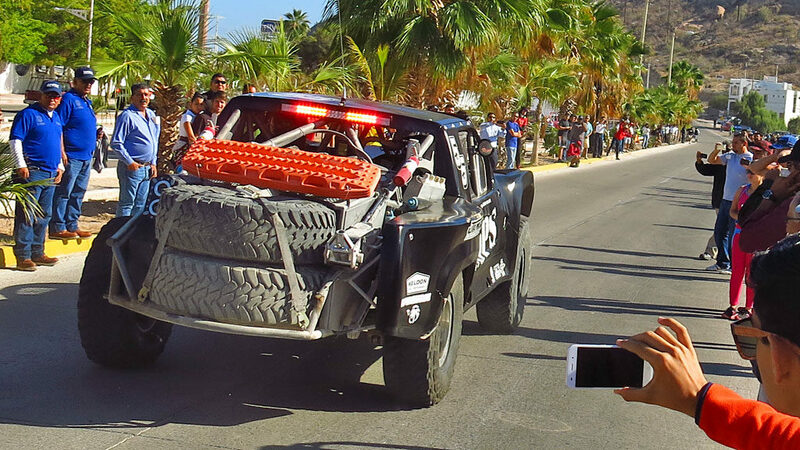 Our section of the course was the lower third, between Loreto and the finish at La Paz. 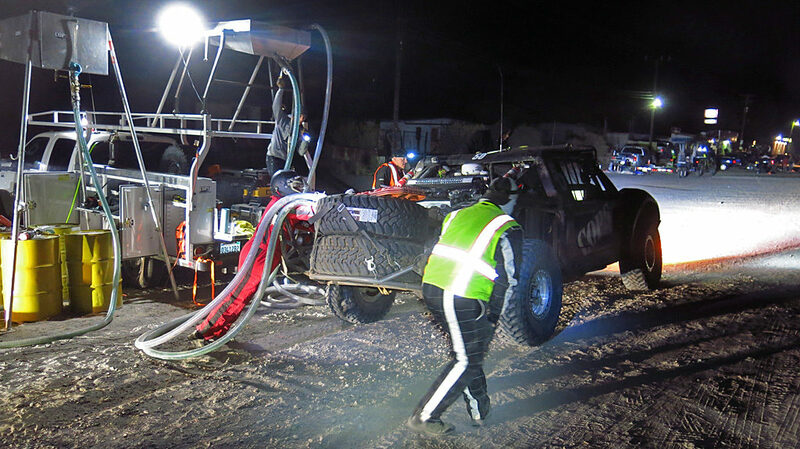 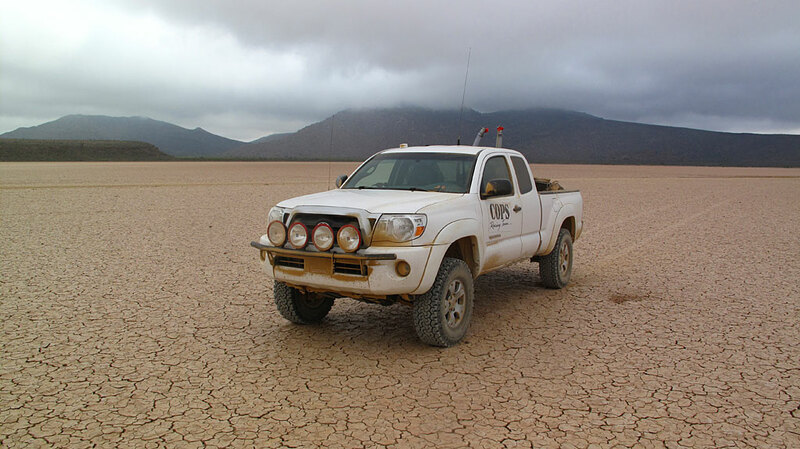 During the race, our job was to hang out close to some nasty silt beds near Race Mile 1190, and wait for the Class 10 car. 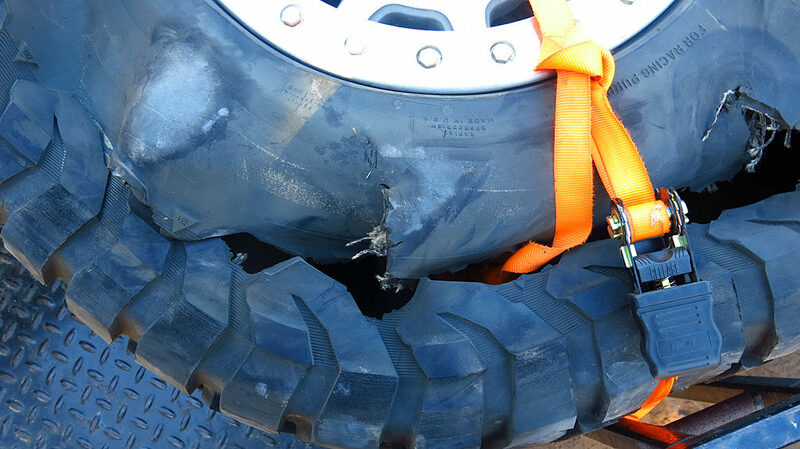 Should he encounter stuckage problems, we were there to help unstuck. 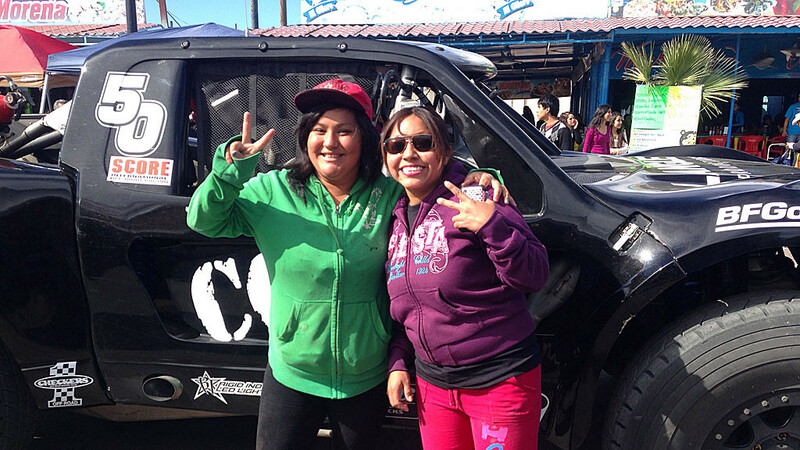 Sunday morning off-loading the prerunner, Oprah, in Cuidad Insurgentes. 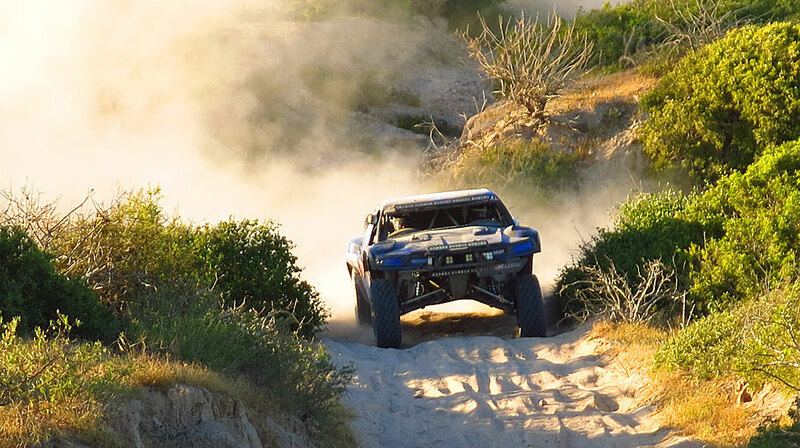 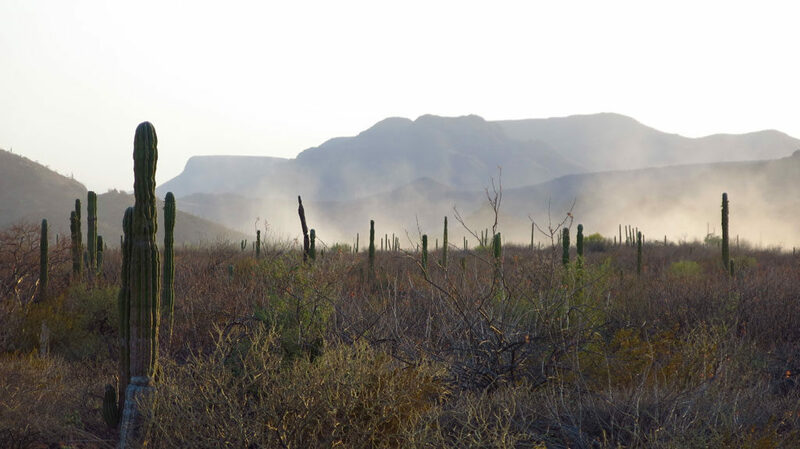 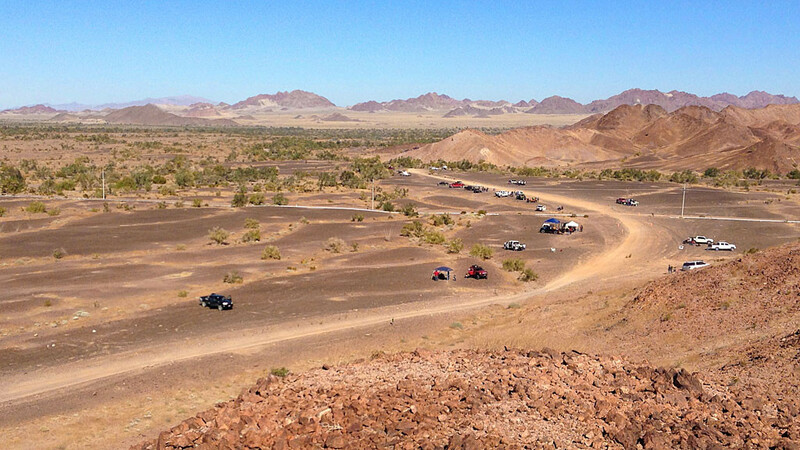 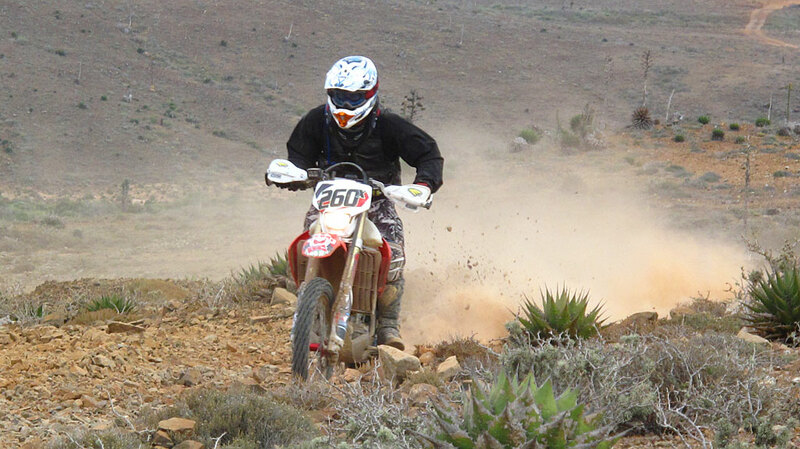 Morgan and John practiced their different sections of the race course in the southern third of Baja. 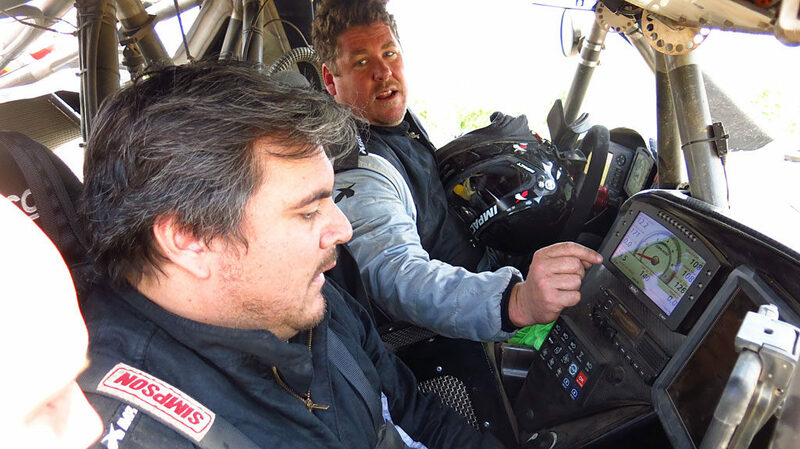 On Race Day, Morgan would drive the Class 1 and John would drive the Class 10. 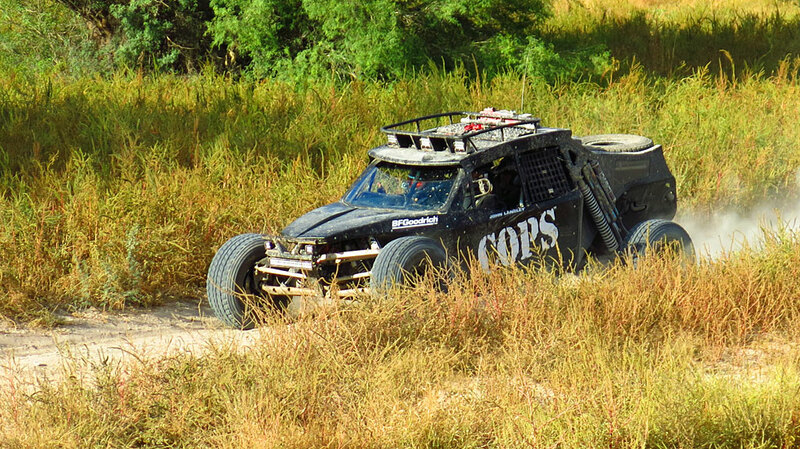 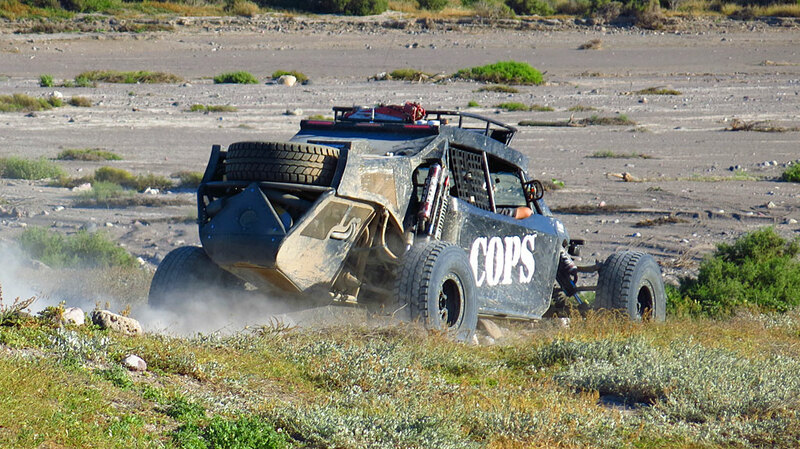 The COPS prerunner was built by Racer Engineering, sporting a race Corvette motor and three feet of suspension travel. 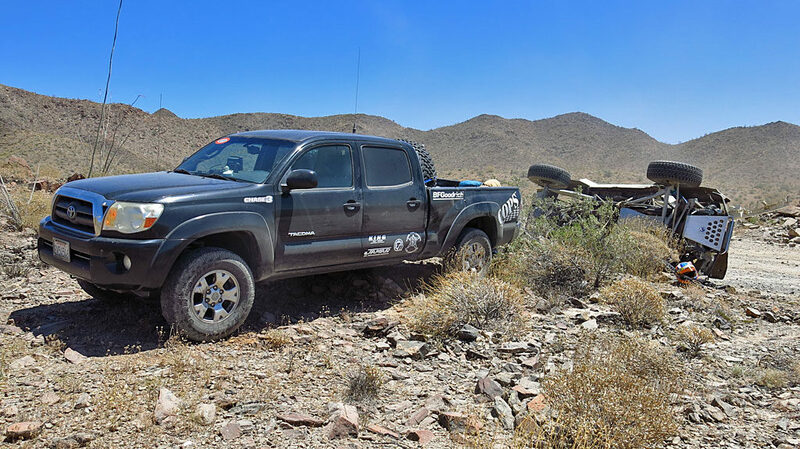 It has two front seats and one back seat – perfect for optimum course reconnaissance. 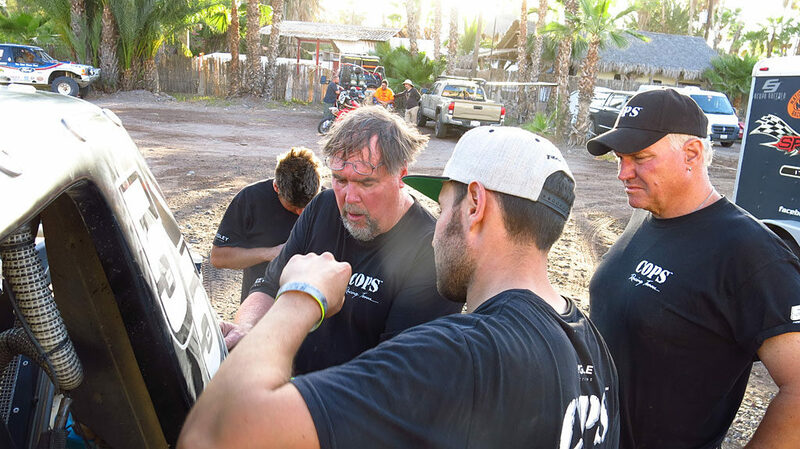 John Langley, COPS Team Owner, discusses the day’s logistics with Morgan and Bill. 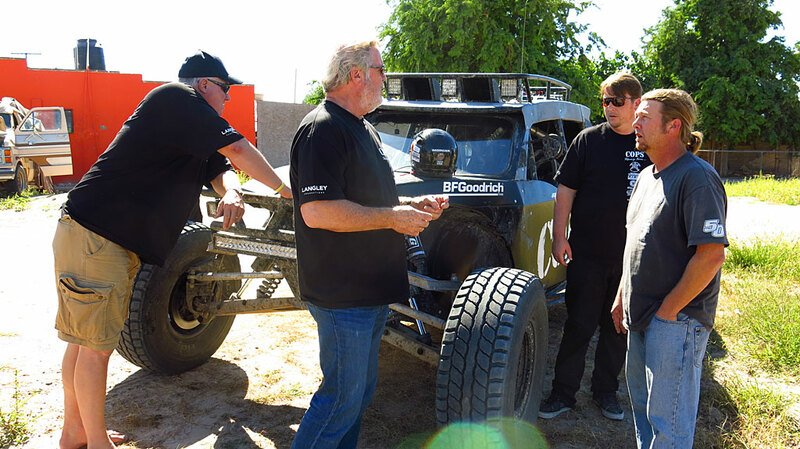 Dennis and Ron gas up Oprah at the soon-to-be BFGoodrich Pits near Santa Rita. 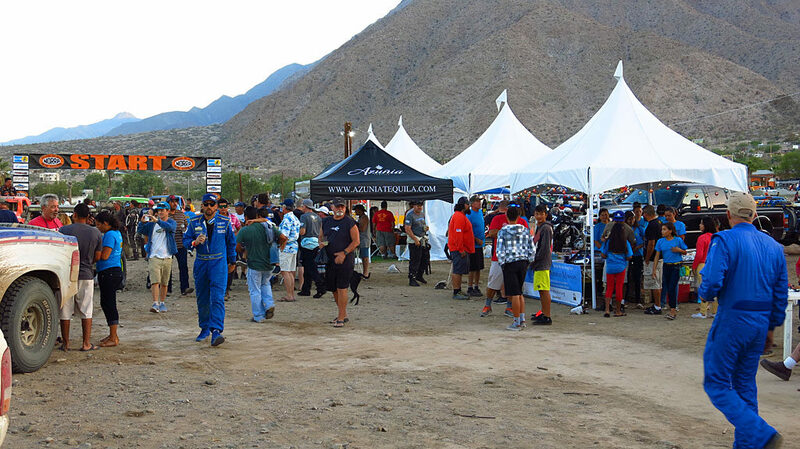 Waiting for Oprah at the soon-to-be BFGoodrich Pits near Santa Rita. 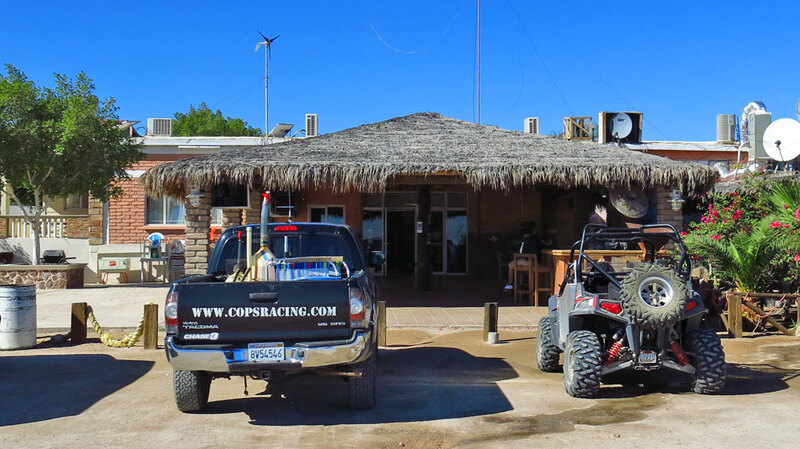 Morgan and Bill practicing their portion of race course near Punta Conejo. 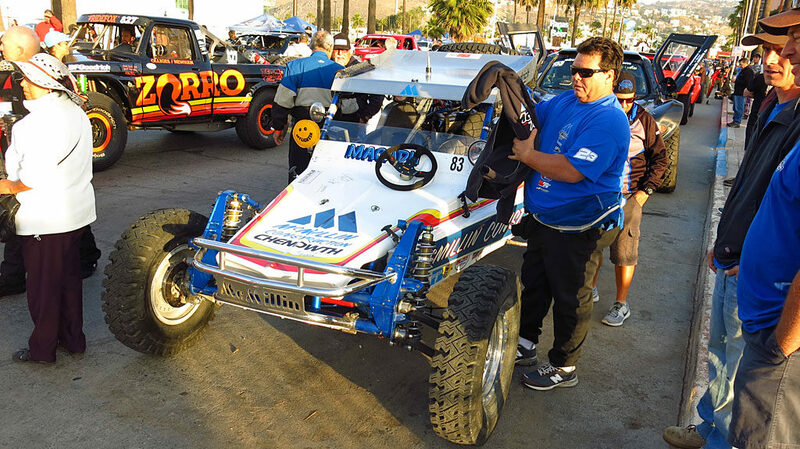 On race day, they’ll be piloting the Class 1 car. 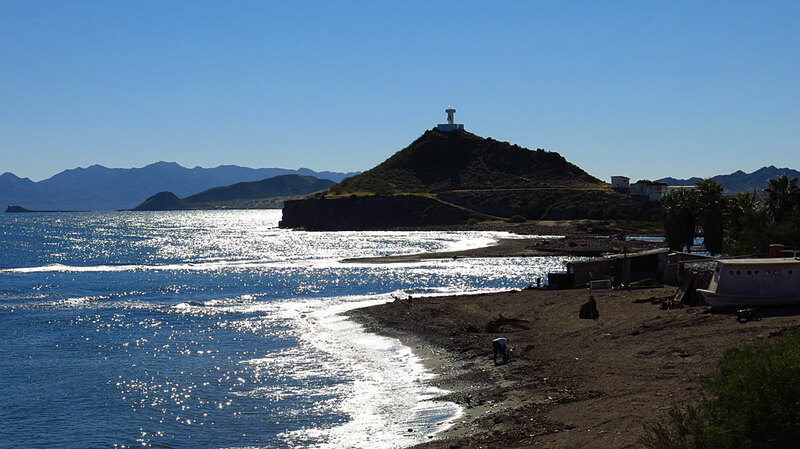 A Photo Sphere from Punta Conejo and the light house – click and drag to look around. 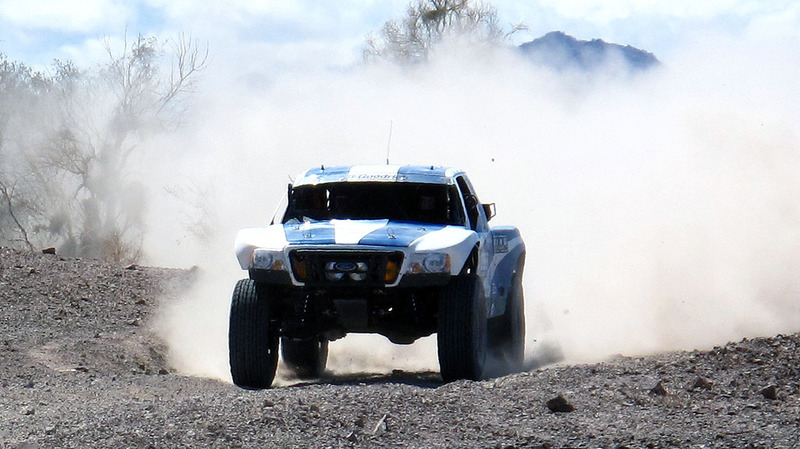 Navigating a race course access road. 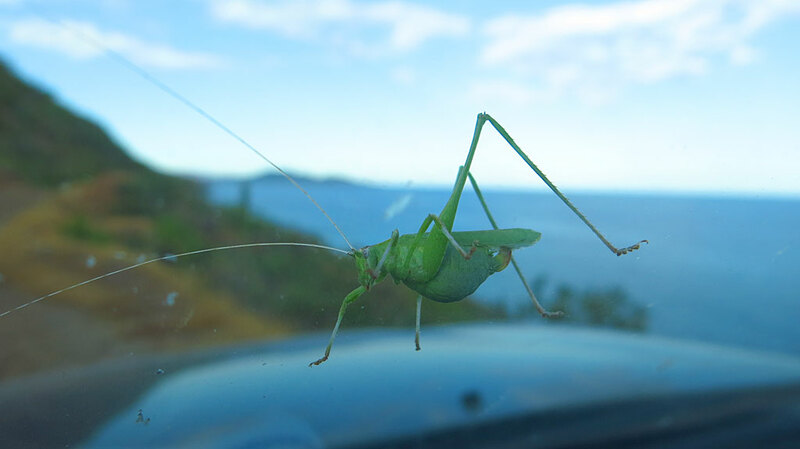 We get distracted by a giant bug on the windshield. 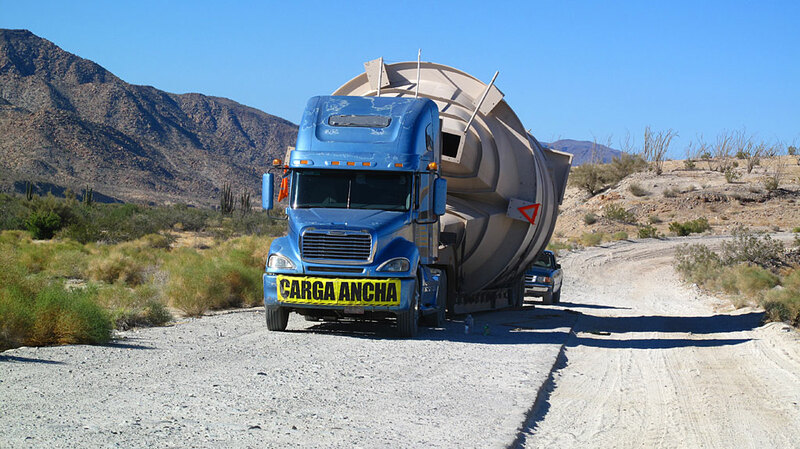 If you’re keeping score, here’s our route as chase guys: SoCal → Loreto → Cuidad Insurgentes → Punta Conejo → La Paz → Cuidad Insurgentes → Santa Rita → Punta Conejo → La Paz → Cuidad Constitución → La Paz → Punta Conejo → RM1190 → Punta Conejo → RM1180 → Loreto → SoCal. 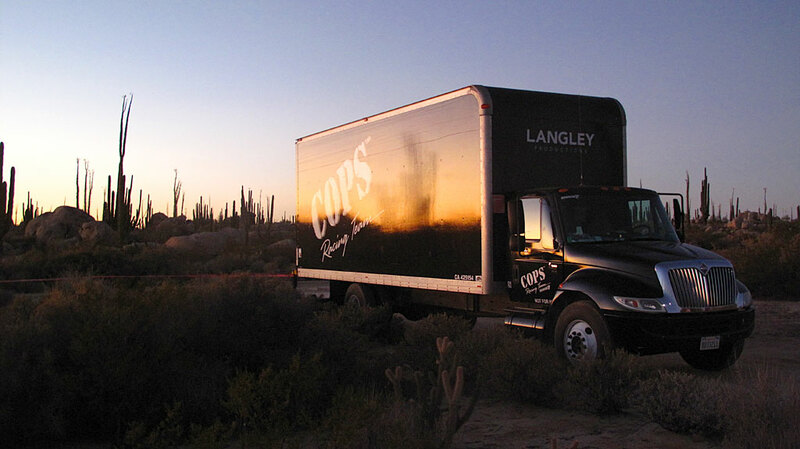 All that equals 3354.06 miles with an average speed of 46.43 mph, and almost 72 hours of moving time. 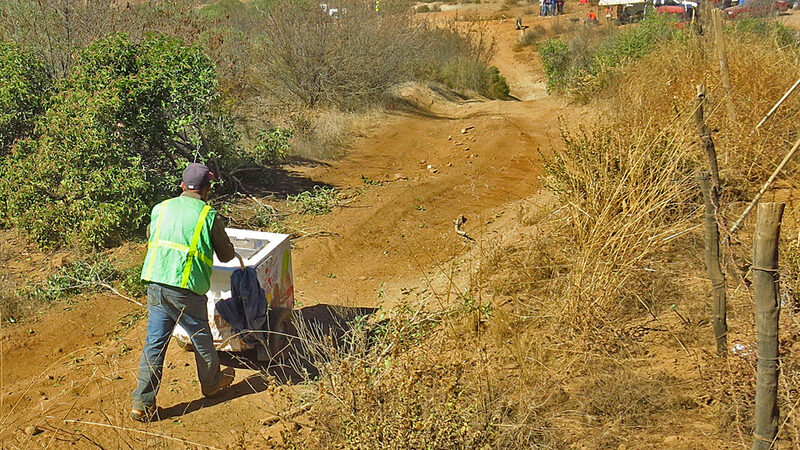 Oprah charges into the silt beds at Santa Rita. 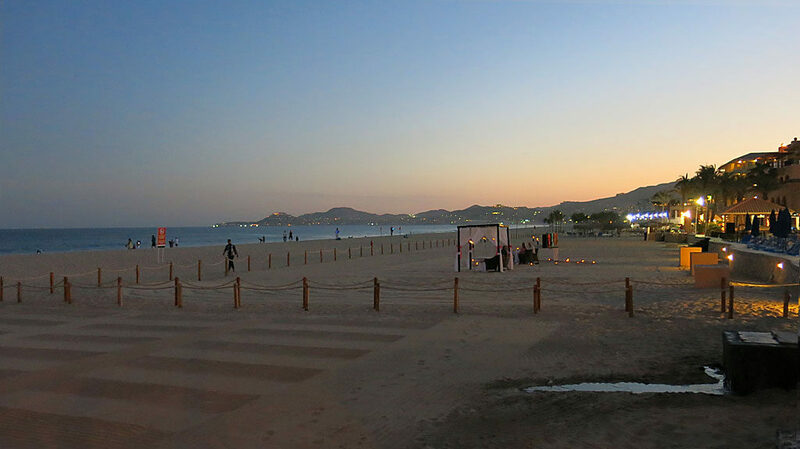 A Photo Sphere of the Hyatt Place La Paz lobby – click and drag to look around. 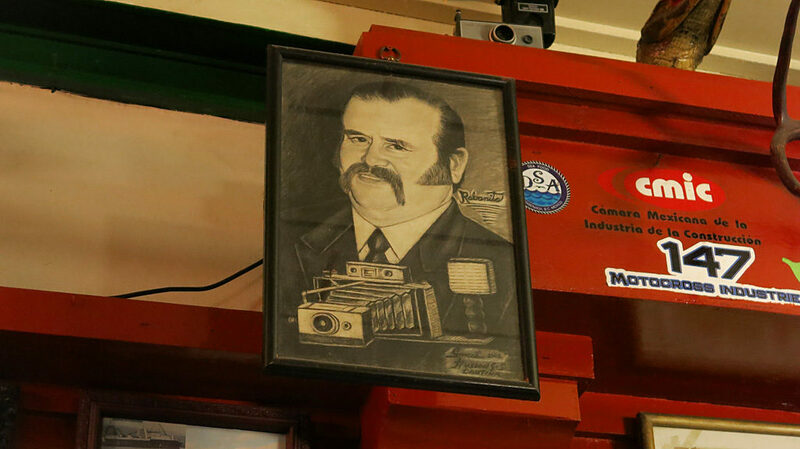 That’s Ron standing by the front desk. 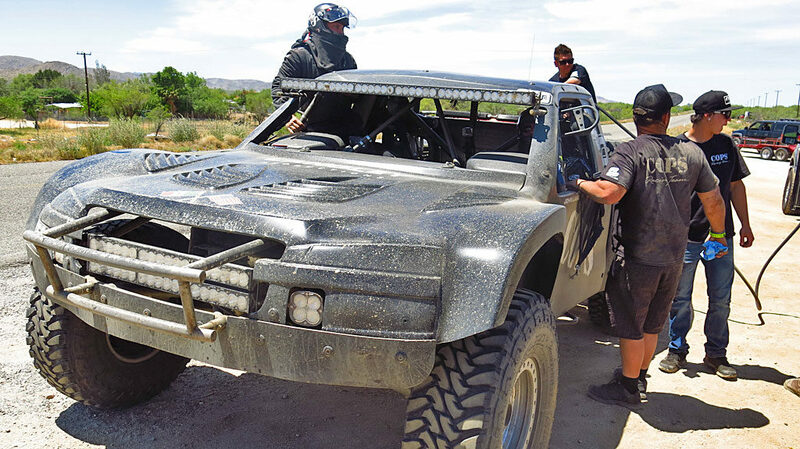 Stewart gasses up Oprah, while Morgan climbs out. 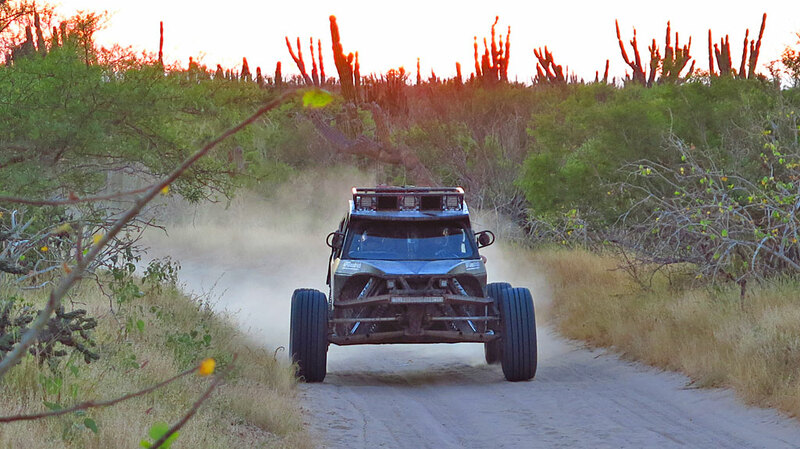 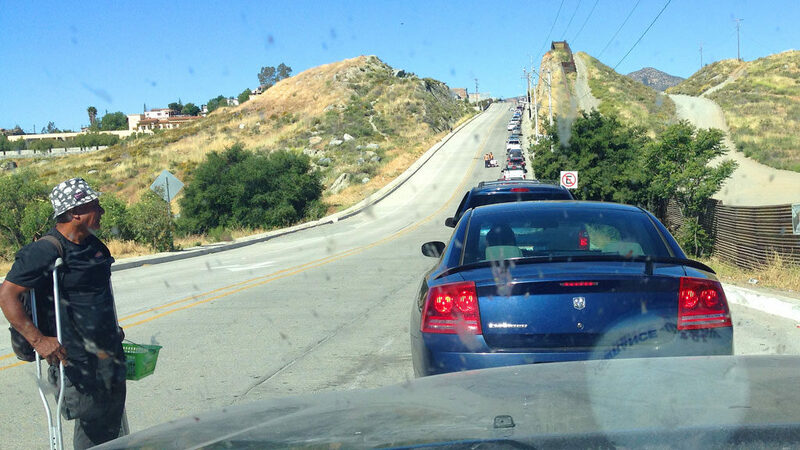 Prerunning is over for the day – running back to the highway on the Punta Conejo road. 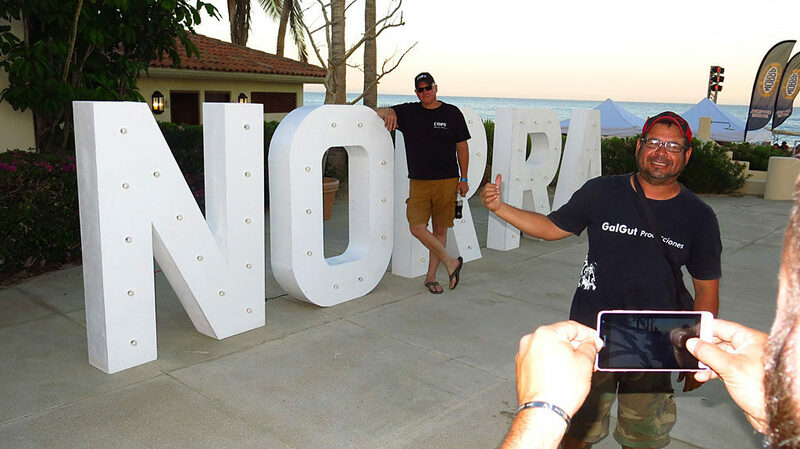 A Photo Sphere while waiting for Oprah – click and drag to look around. 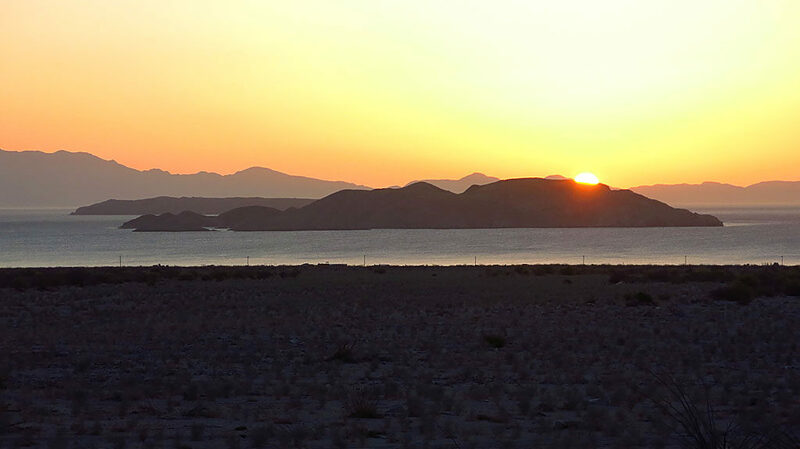 Symbolic sunset photo, transitioning from prerunning to race day. 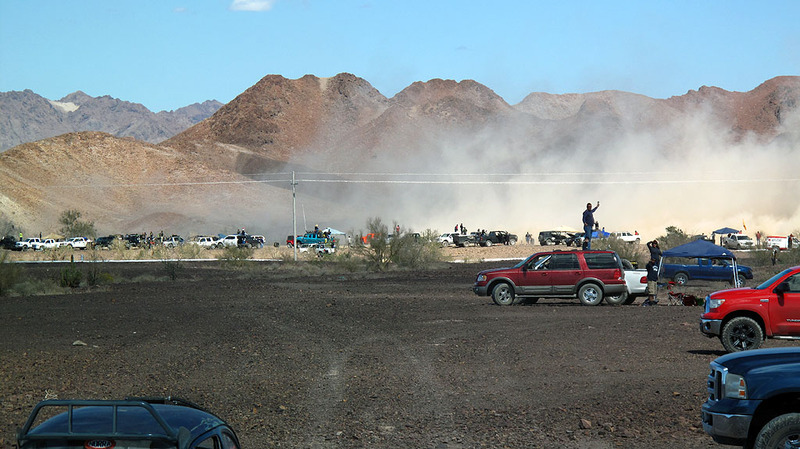 Steve and I had to drive into our camp site near the silt beds, the day before the race which would keep us from driving on a live race course. 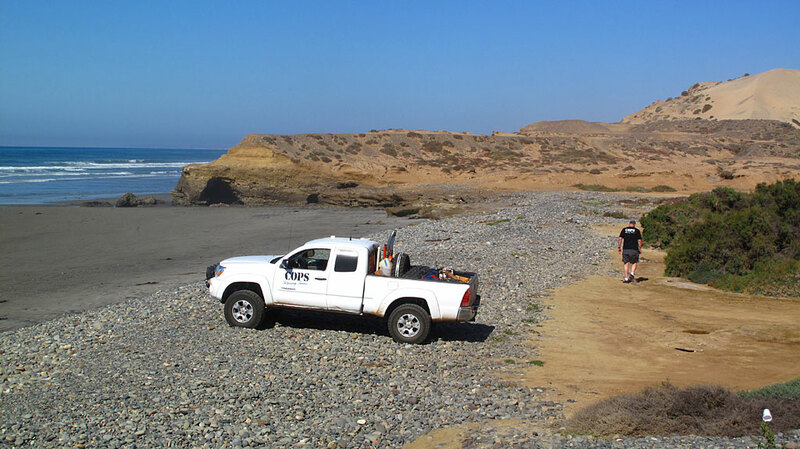 We had to drive around 15 miles on a dirt road to Punta Conejo, then another 15 miles north along the Pacific, on the beach. 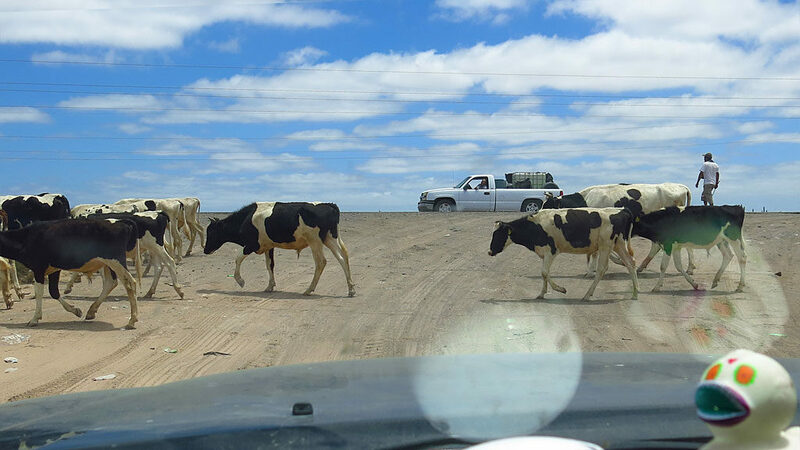 We were very remote. 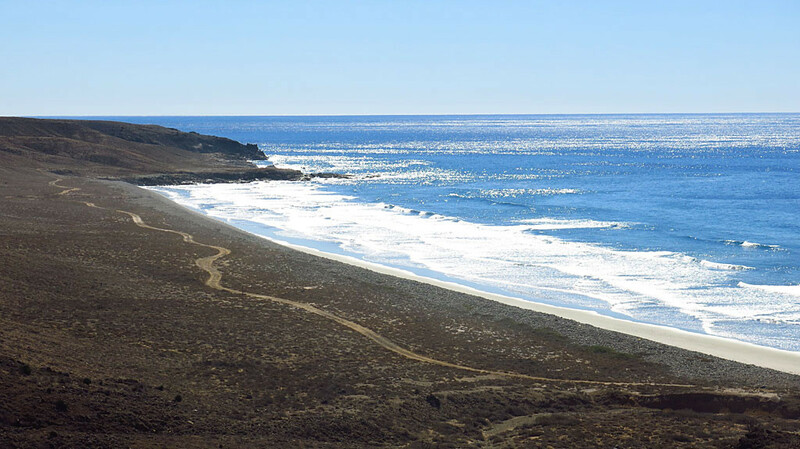 A Photo Sphere of our camp site on the Pacific Coast – click and drag to look around. 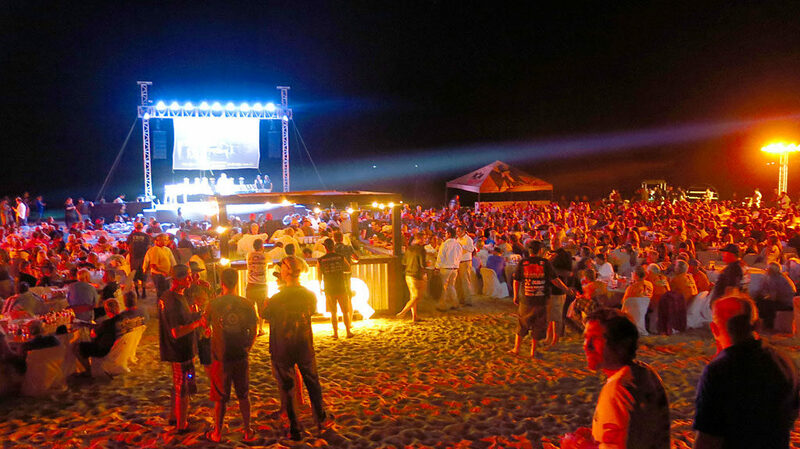 The night before the race got to us, we enjoyed a campfire on the beach and some Tecate beers. 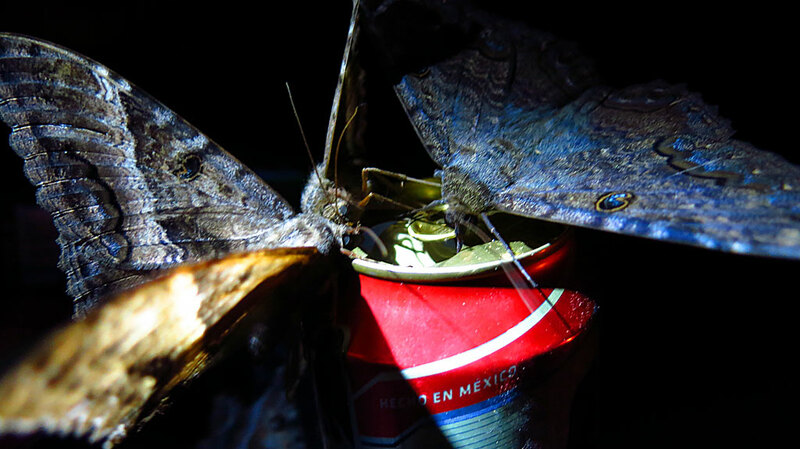 As it turns out, really big moths like Tecate beer too. 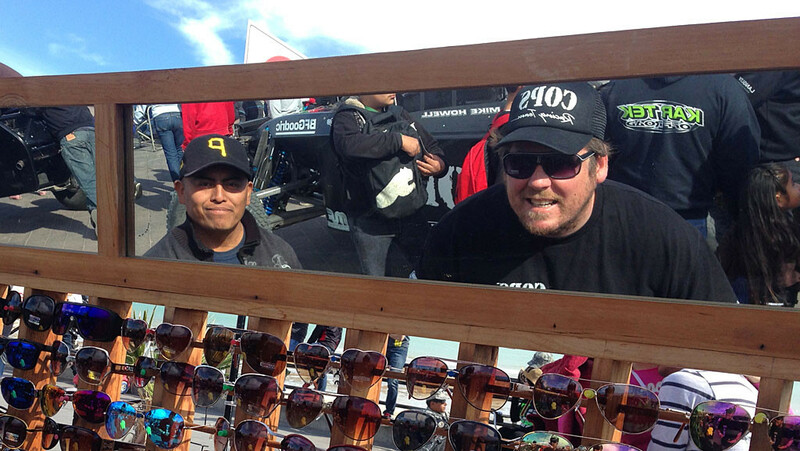 The race started in Ensenada Thursday morning, but didn’t reach us, 1100+ miles down-course, until early Friday morning. 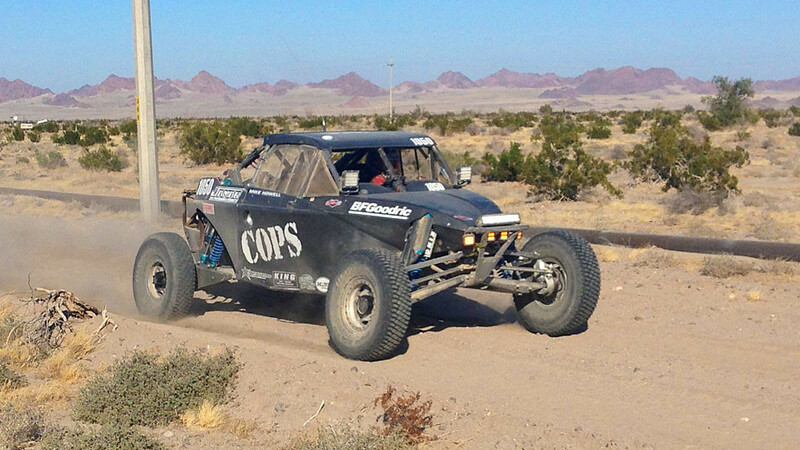 The COPS Trophy Truck passed us Friday afternoon running strong, finishing 8th in Class. 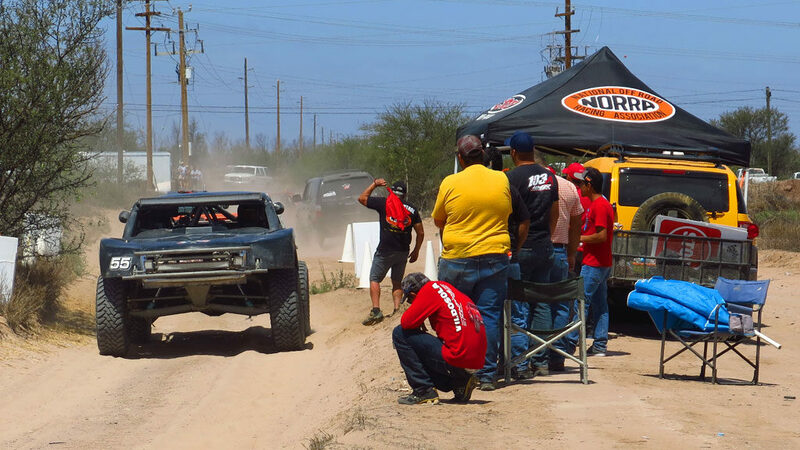 We ultimately got word the Class 1 went into a ditch halfway down Baja and ripped out the car’s front end, rendering a DNF. 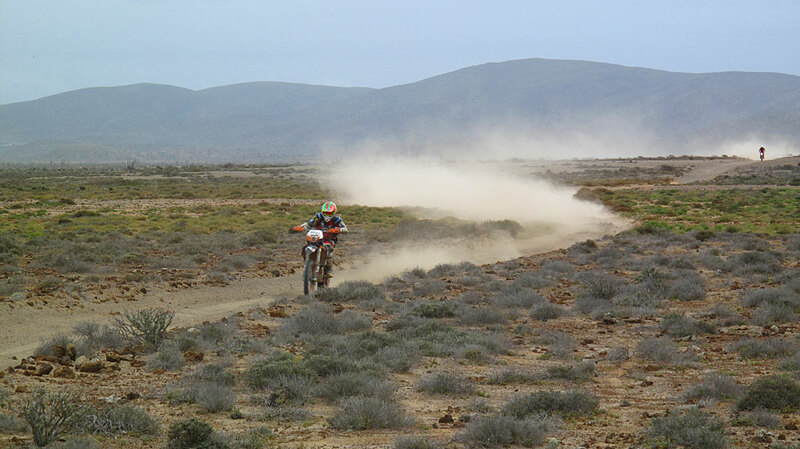 And the brand-new Class 10 Jimco was running strong toward us. 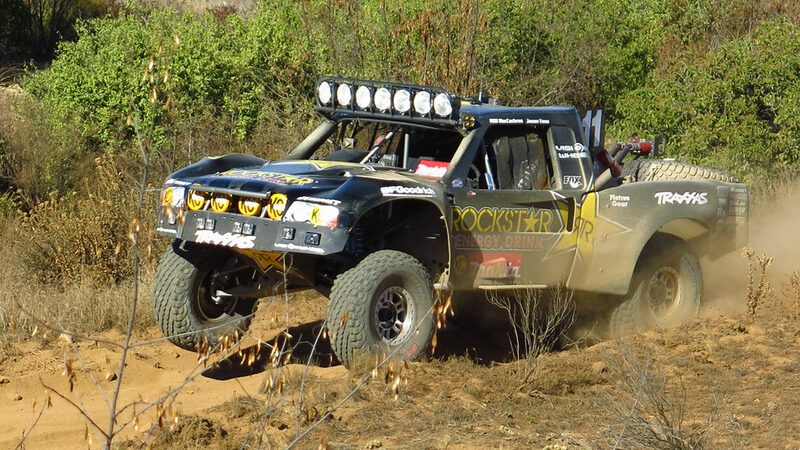 One of the lead Trophy Trucks past our location was Clyde Stacy from Bristol, VA – he finished 7th in Class. 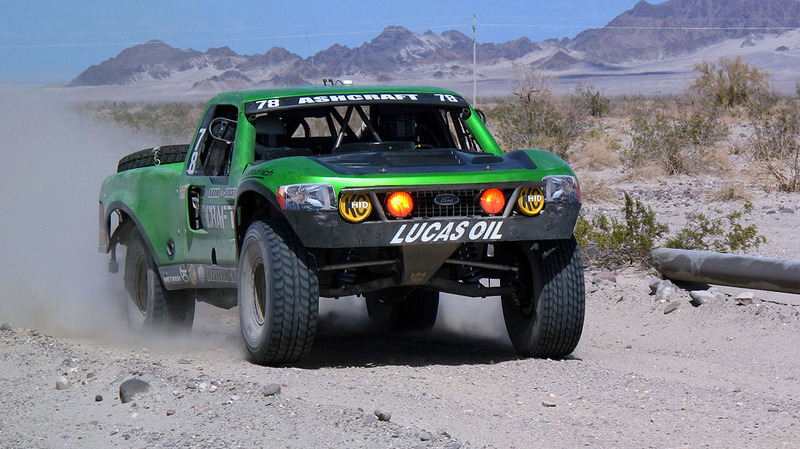 Justin Davis was the Class 1 leader in his Rigid Industries Jimco, finishing first in Class in around 24-1/2 hours. 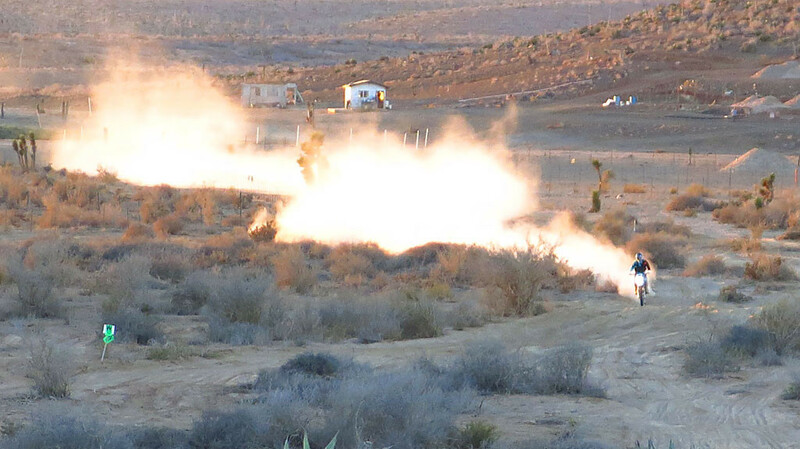 Late afternoon sun shows off the sandy whoops on the course. 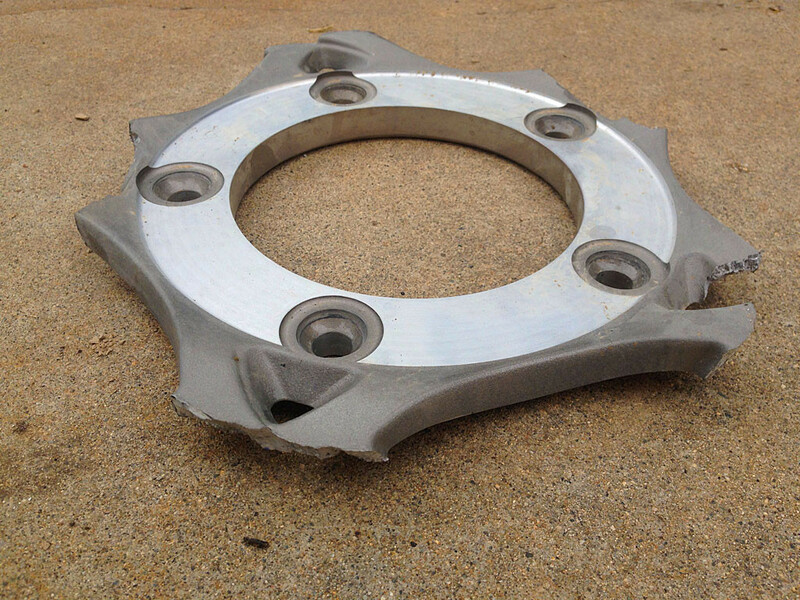 Late on Friday evening the new Jimco Class 10 made it to around RM1180 and the clutch failed. 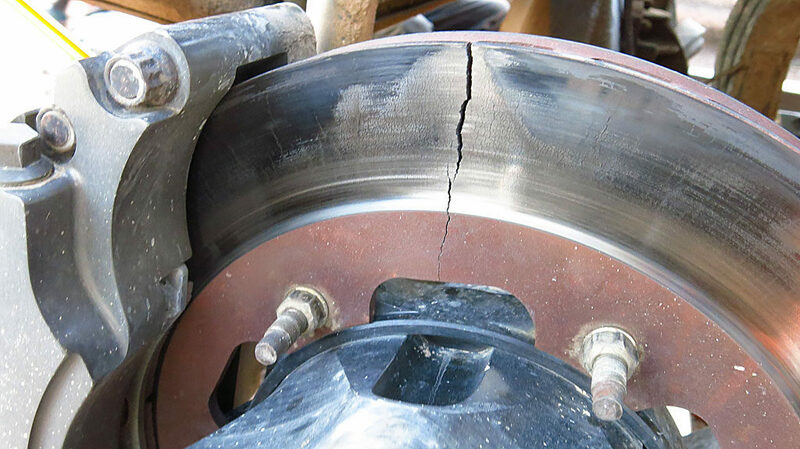 Actually, the clutch had been slowly failing for the prior 100 miles, but without a spare, the car was stopped, pressure plates were scuffed up and reassembled. 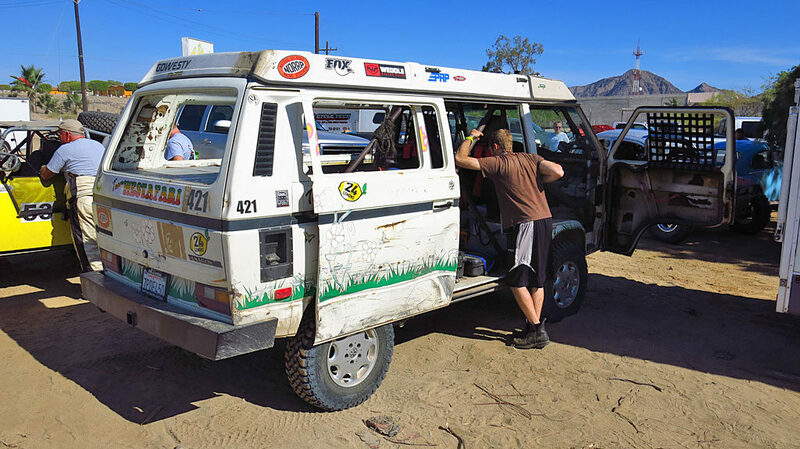 The car made it a final 30 miles before the clutch gasped its final breath of life. 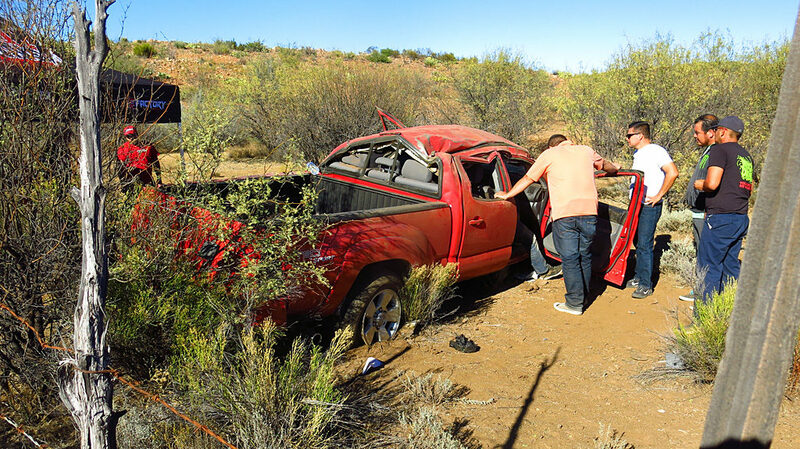 We found the car after sunrise Saturday morning and towed it 20 miles to the highway with a bigger truck and trailer. 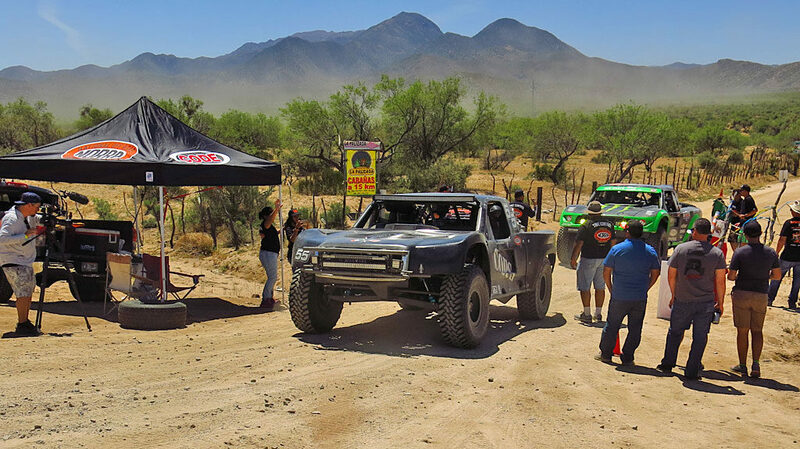 When the dust settled, our race day was 36 hours.